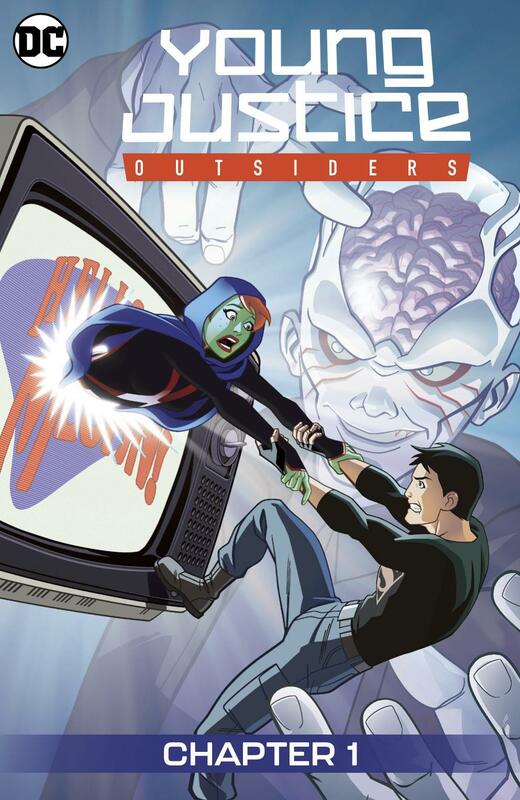 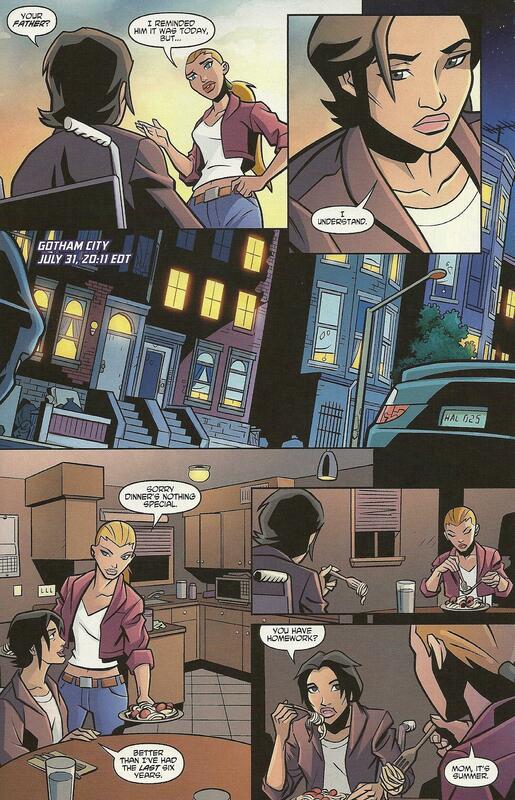 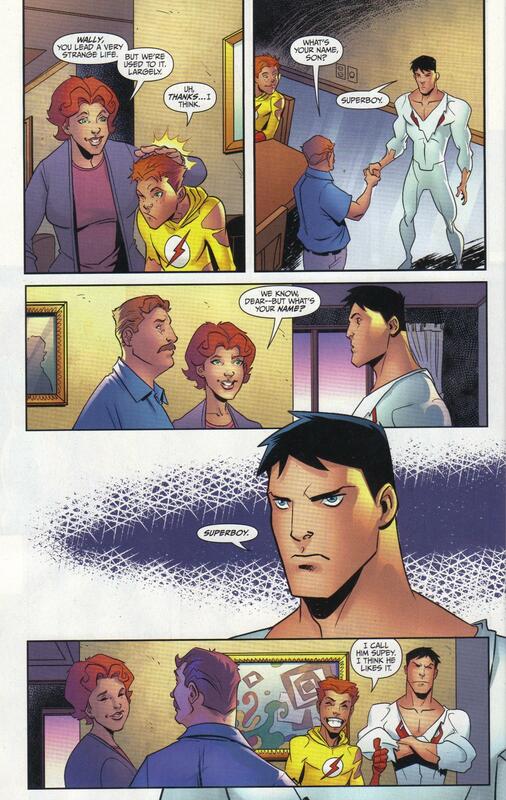 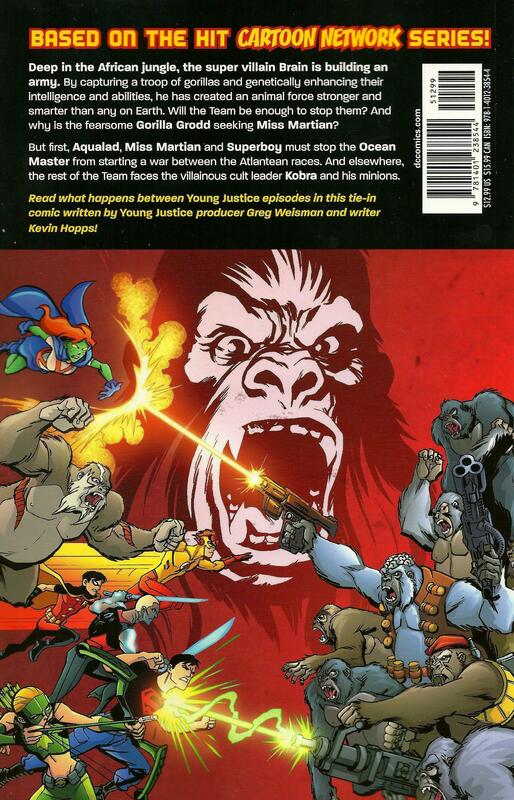 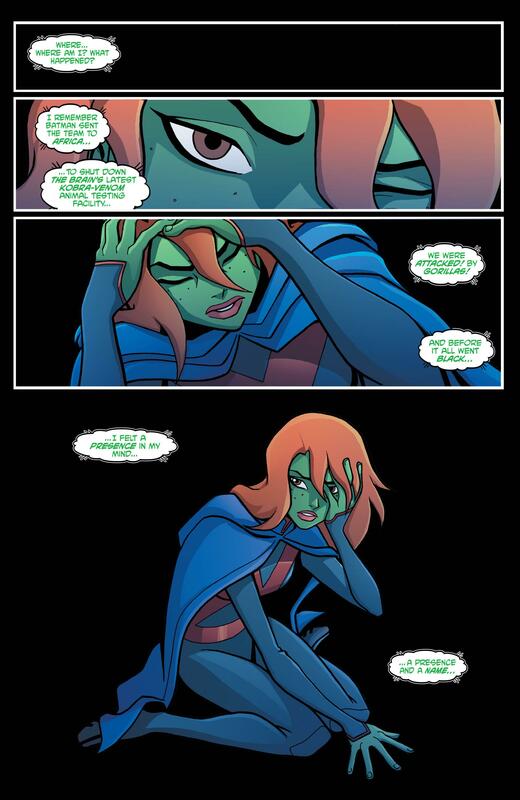 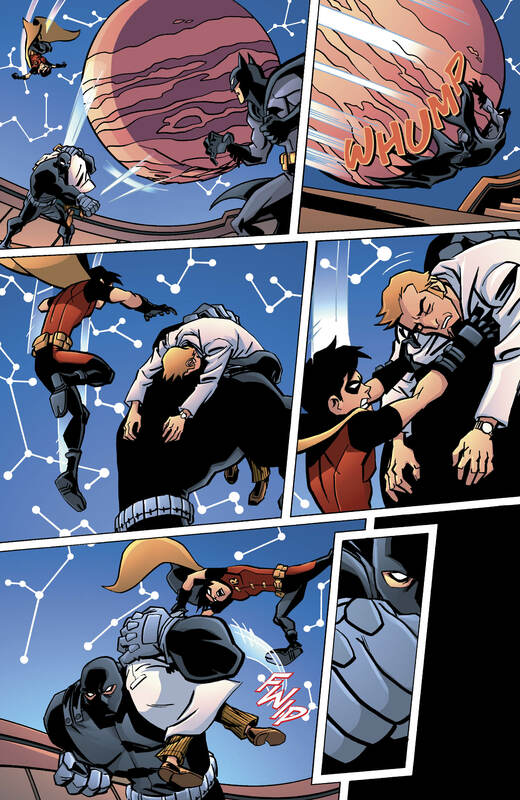 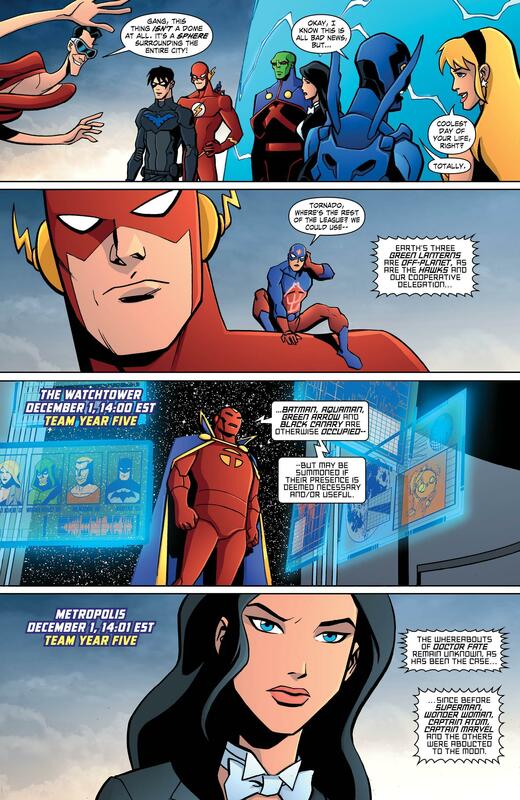 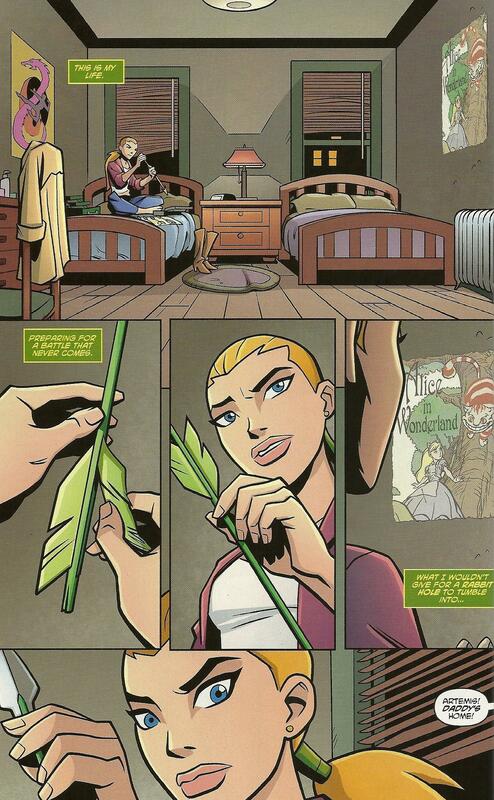 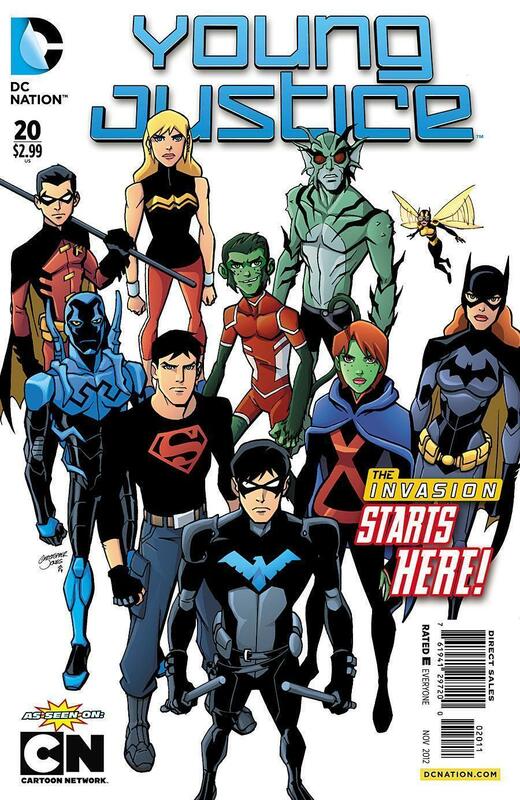 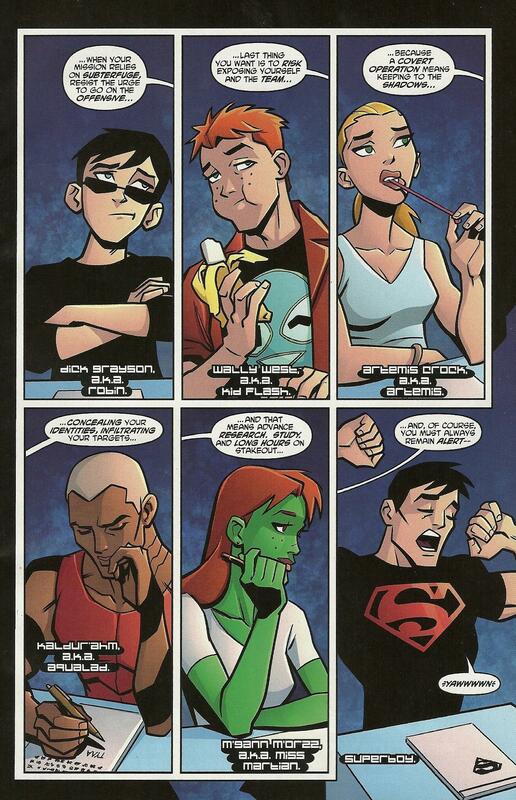 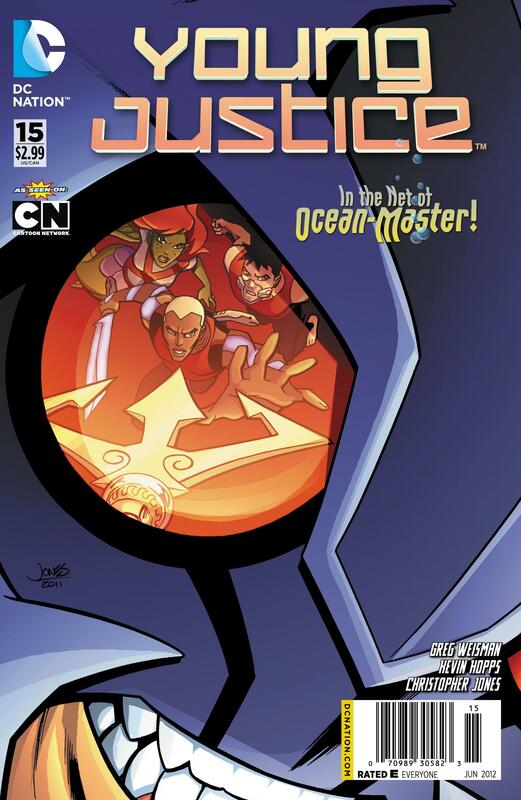 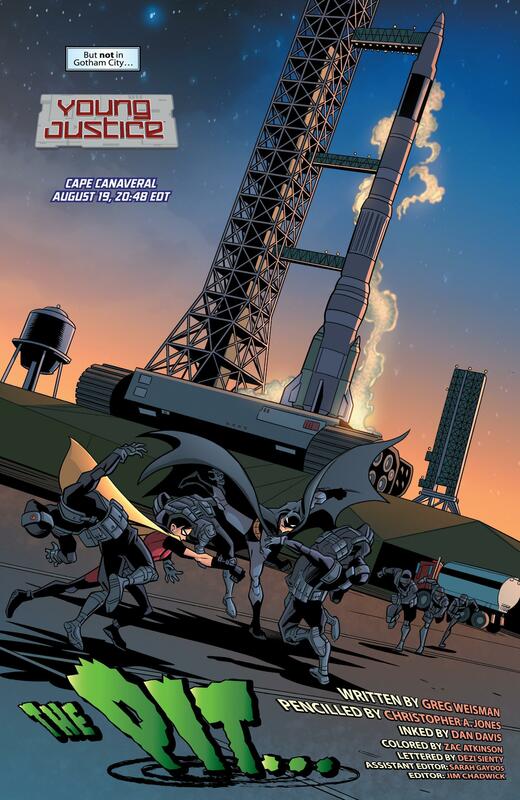 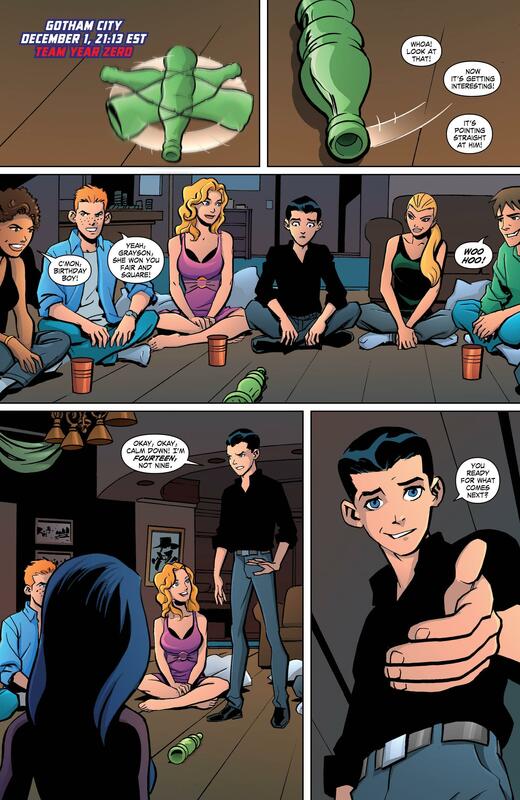 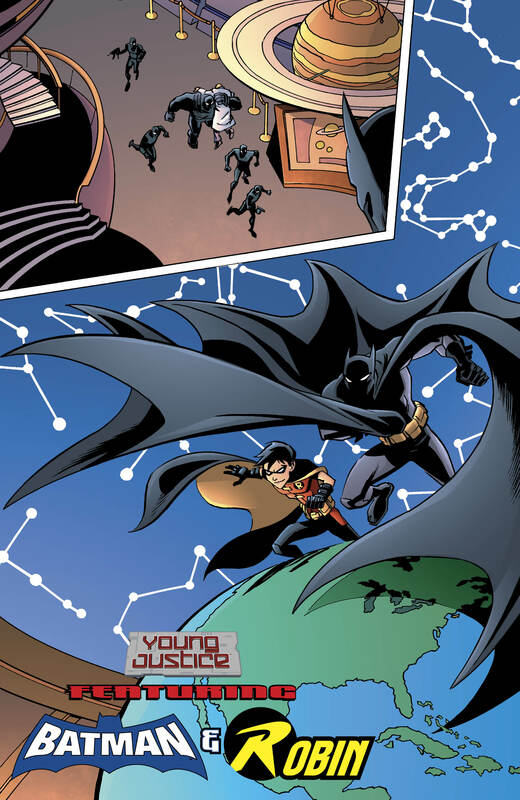 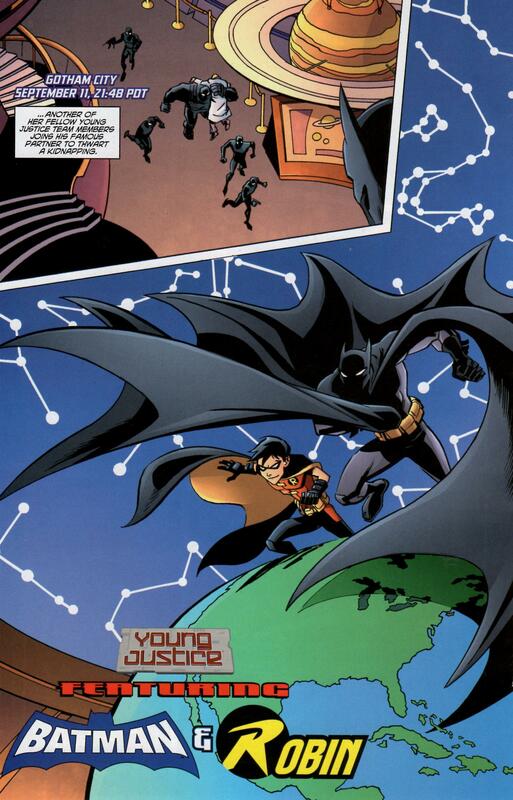 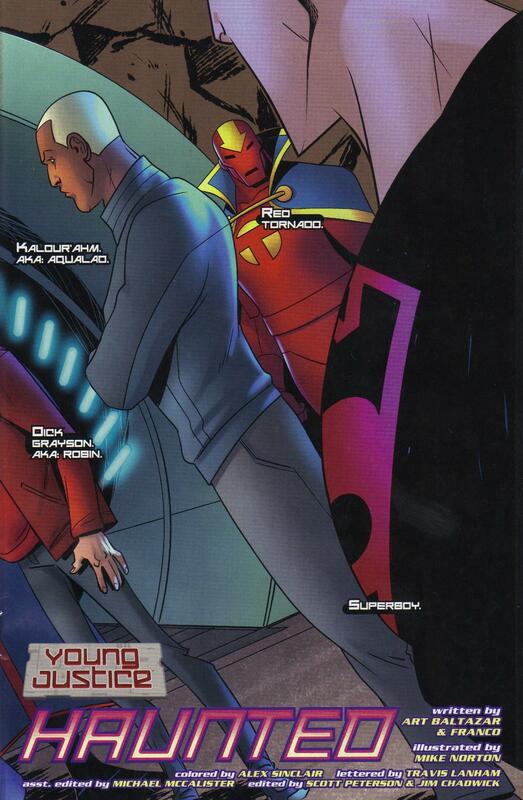 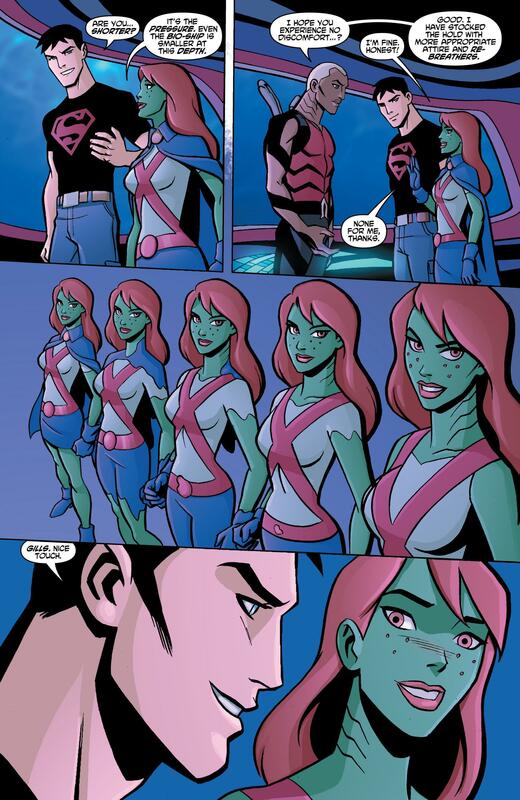 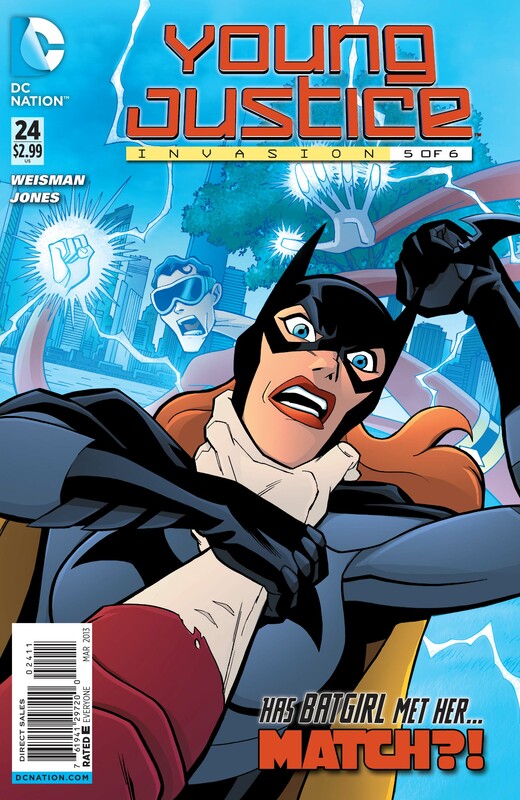 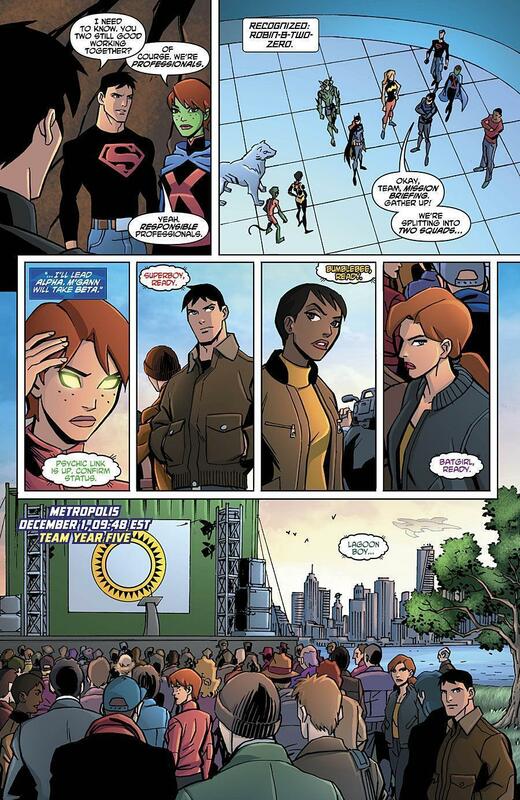 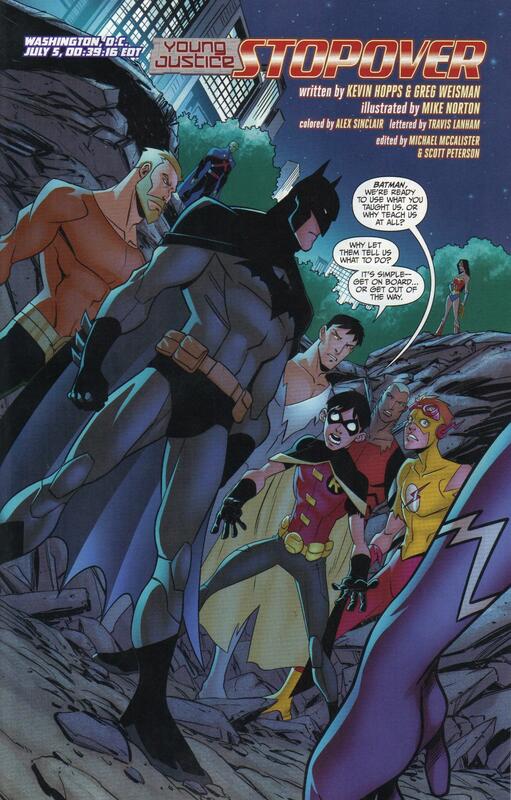 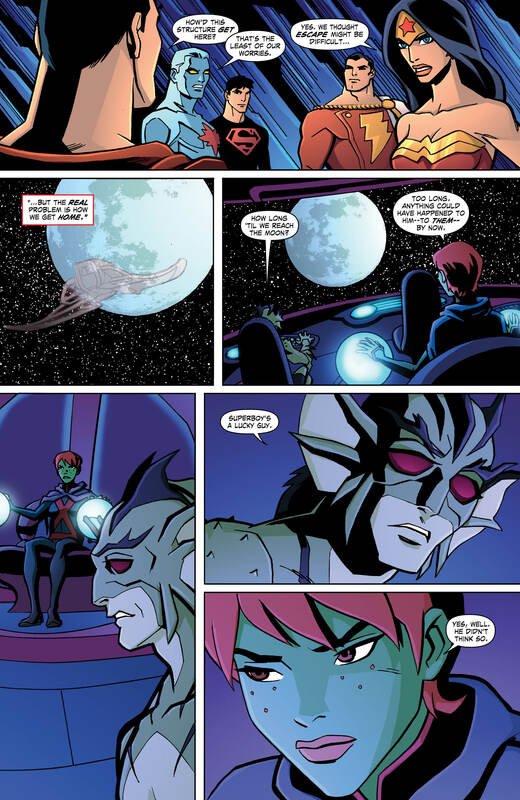 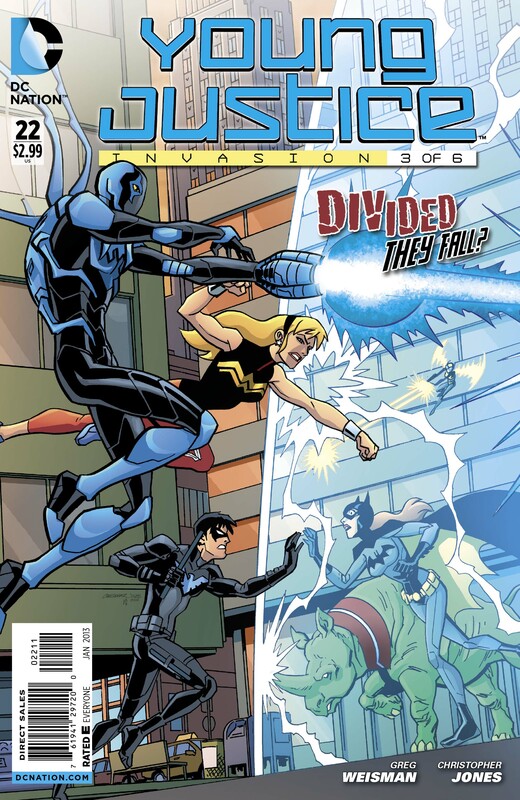 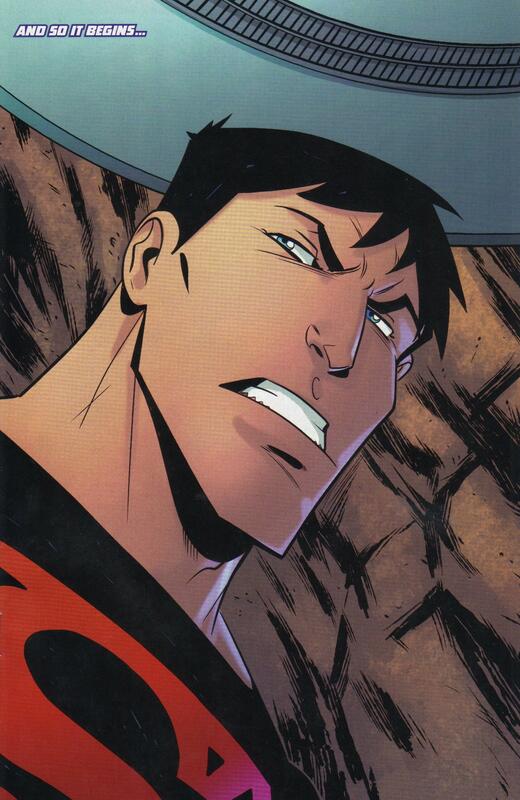 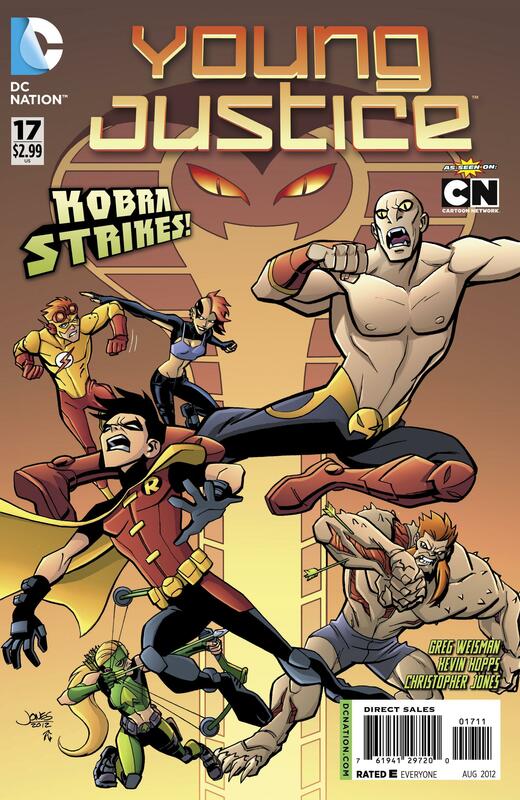 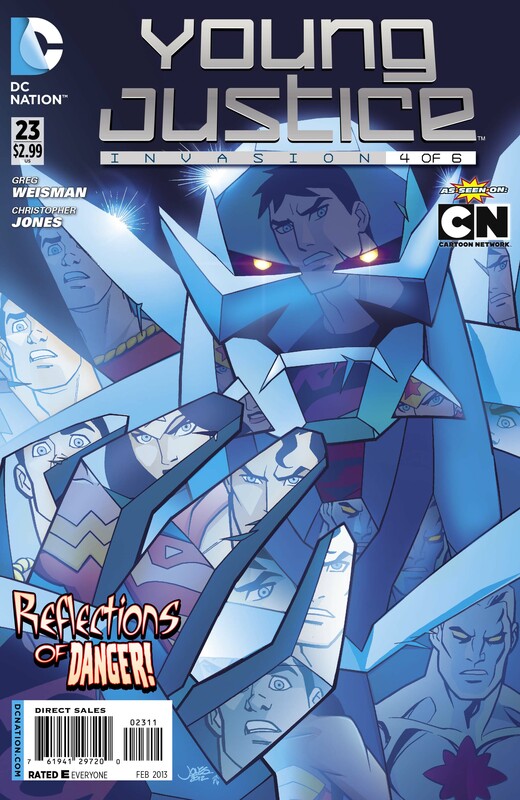 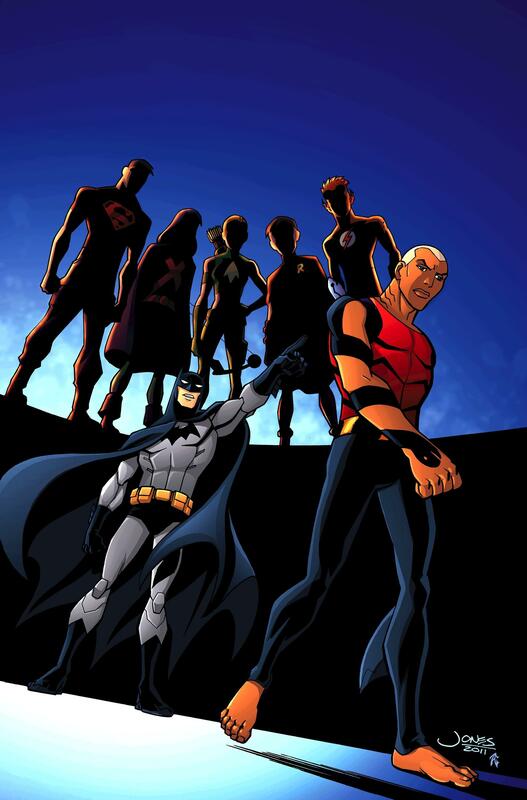 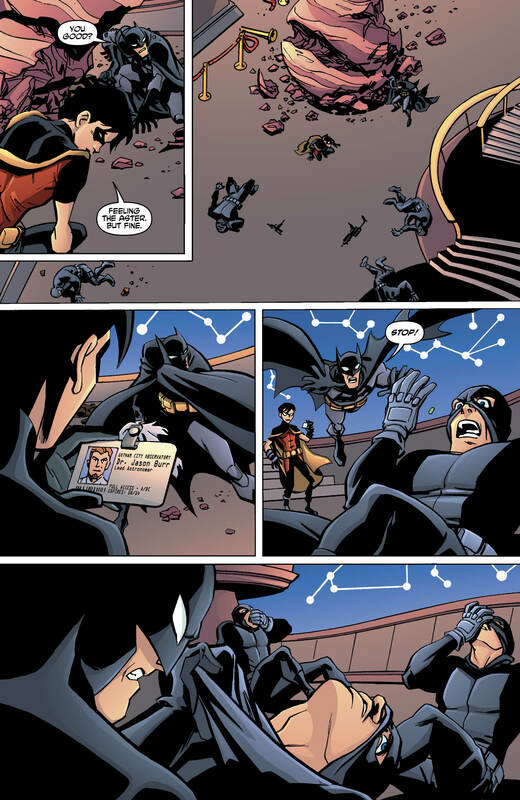 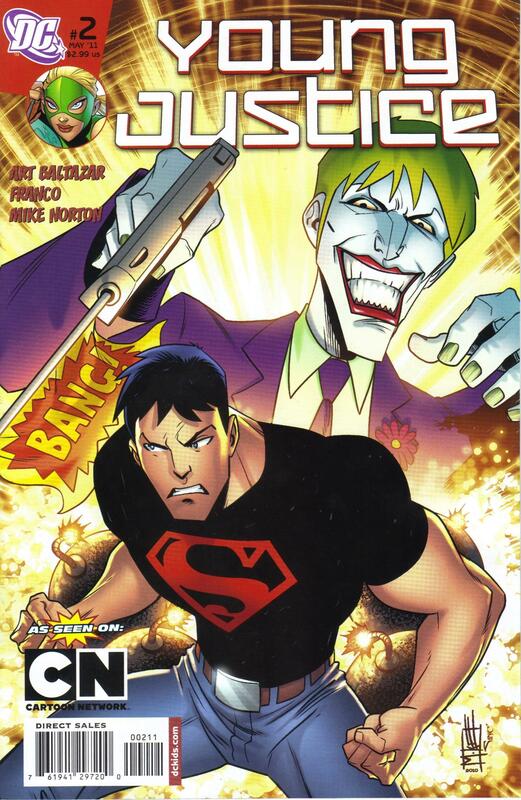 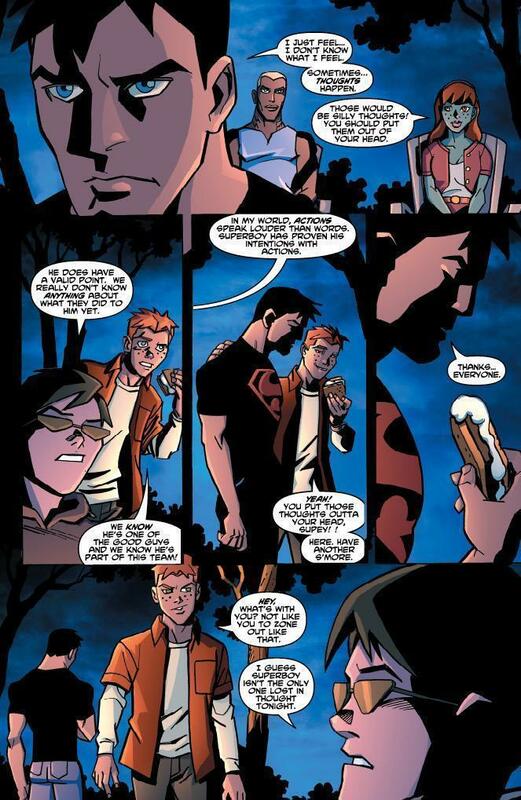 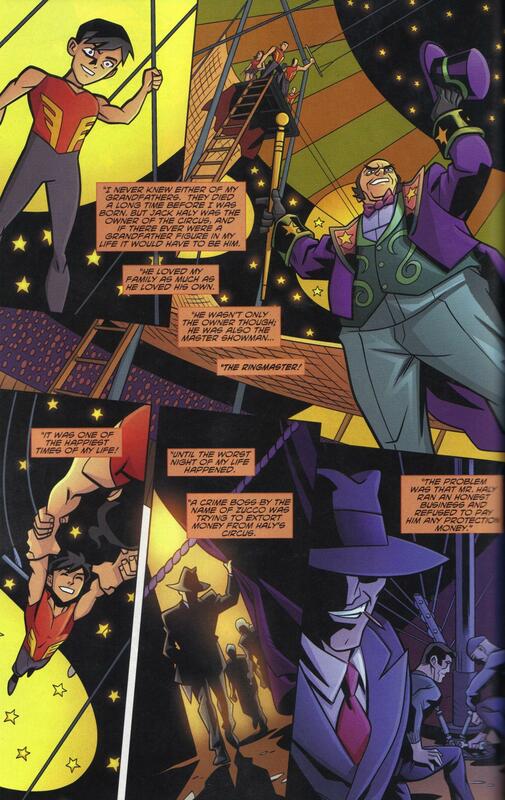 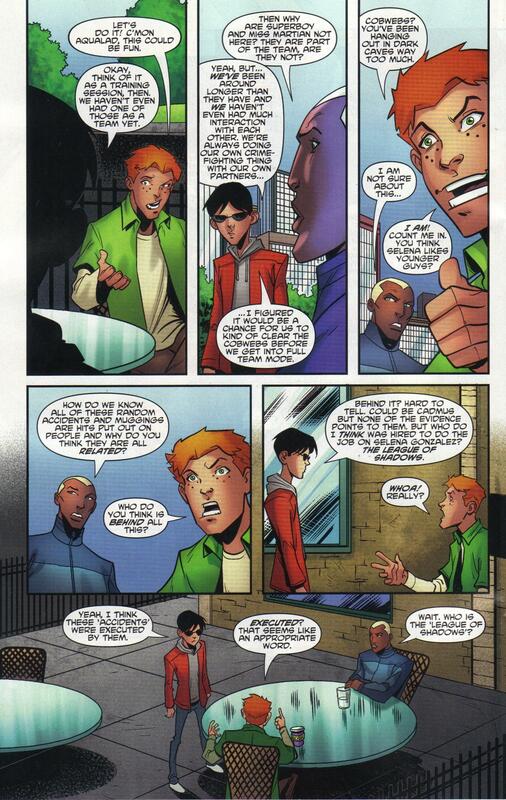 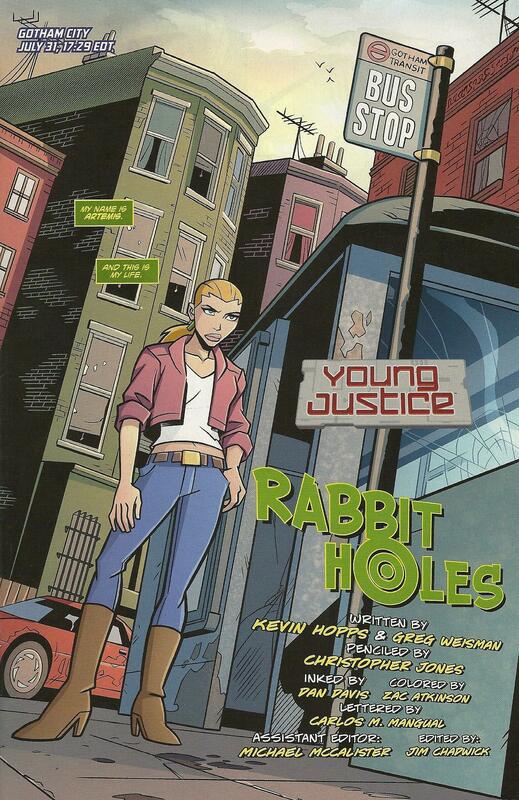 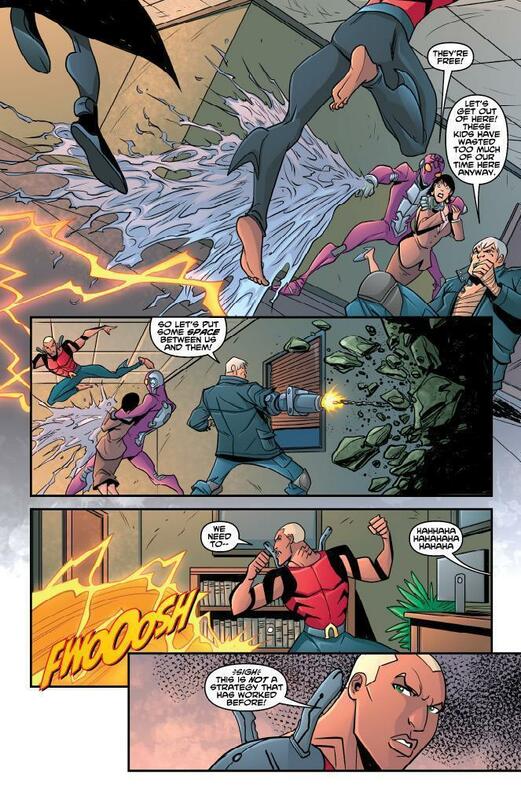 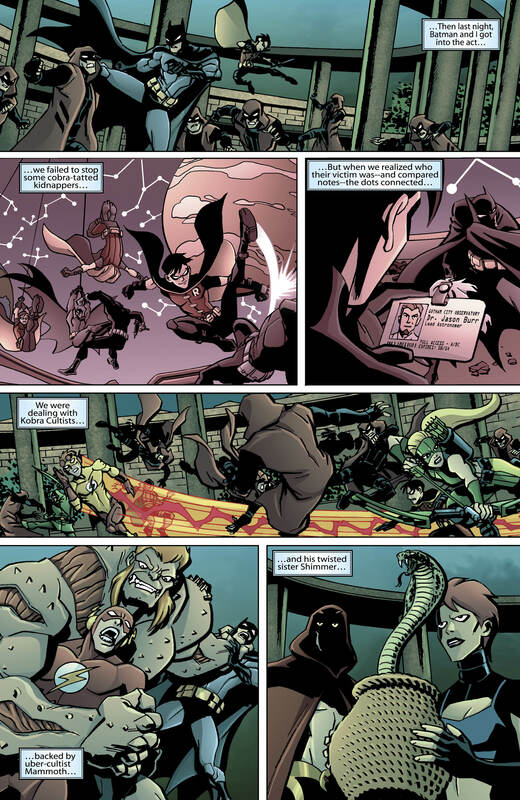 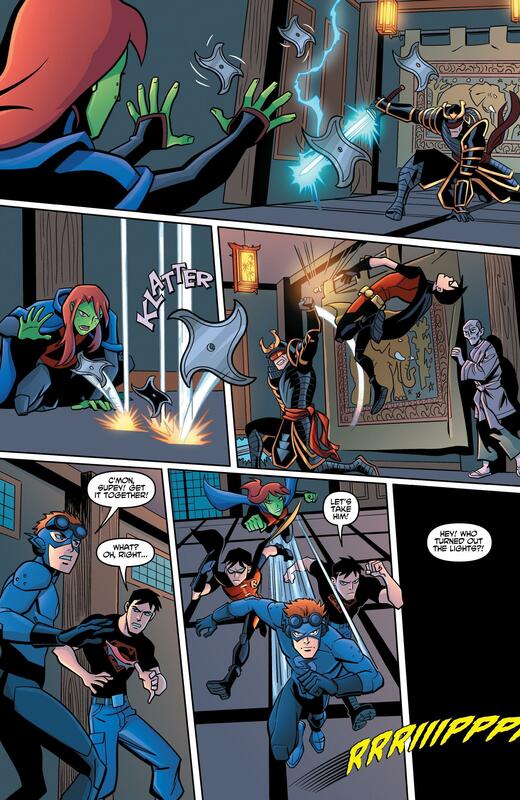 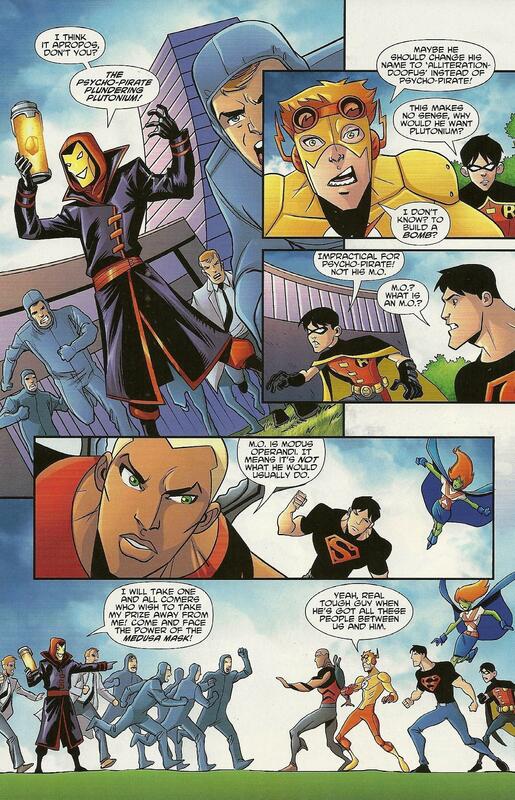 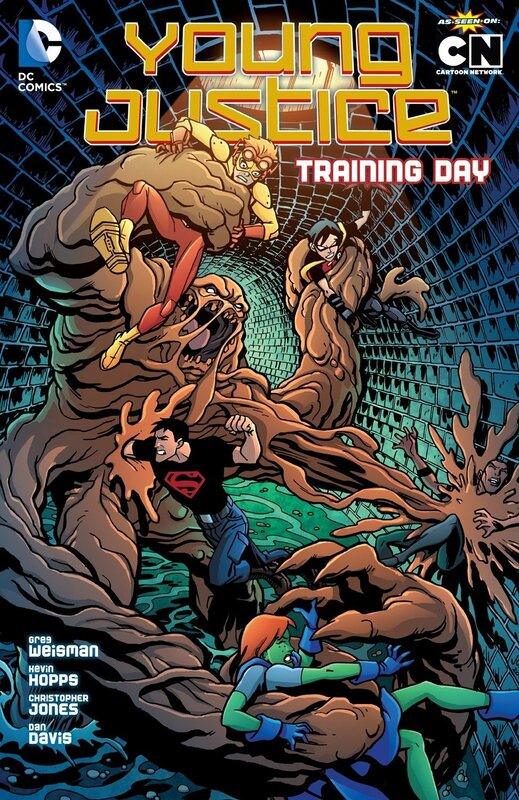 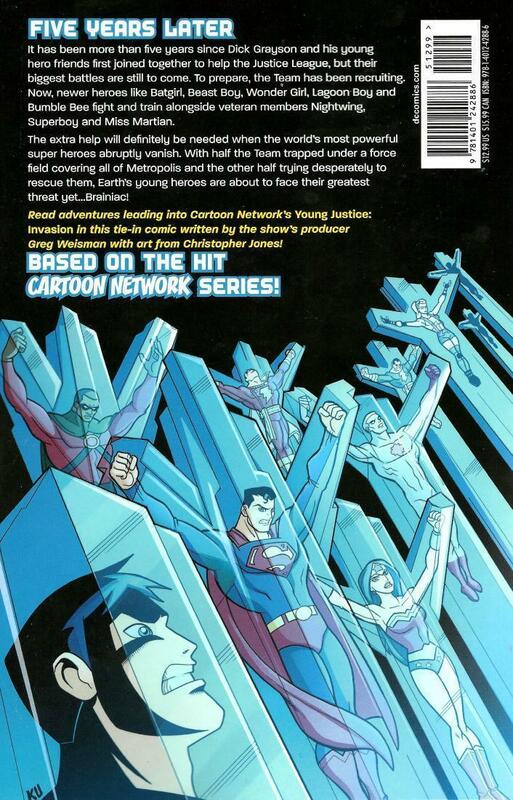 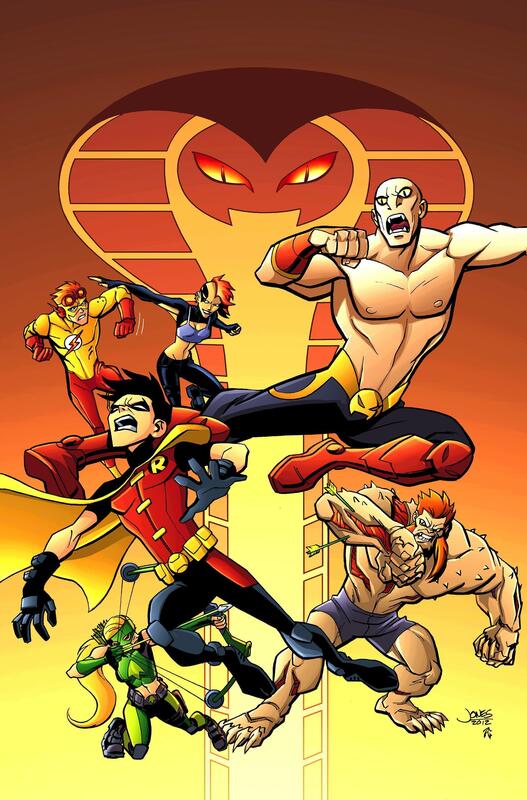 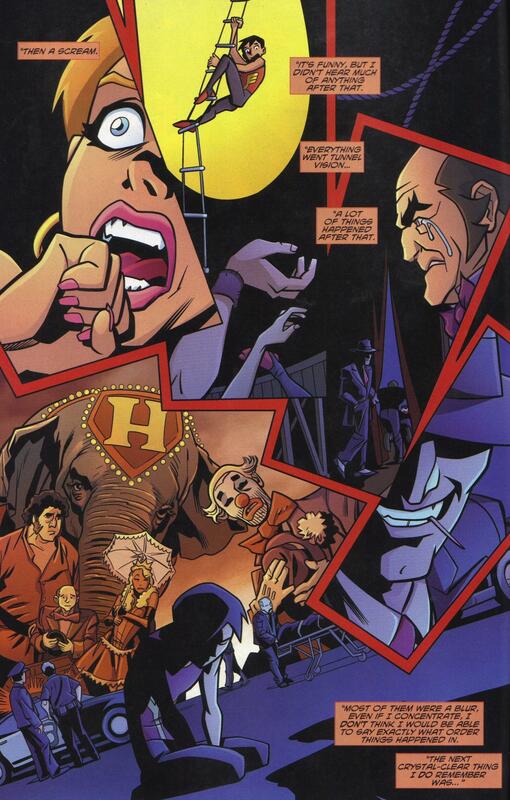 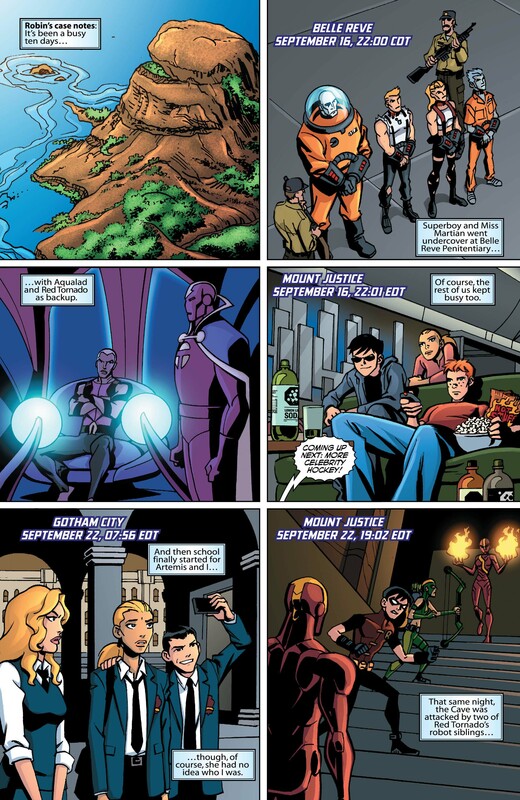 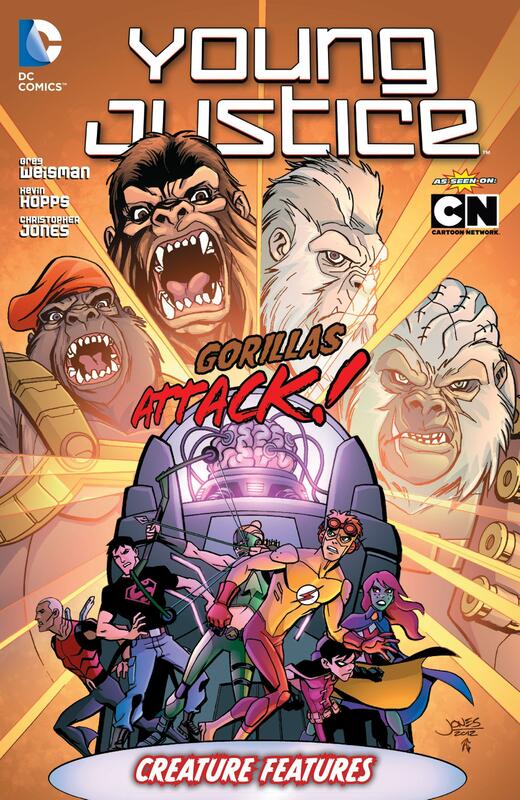 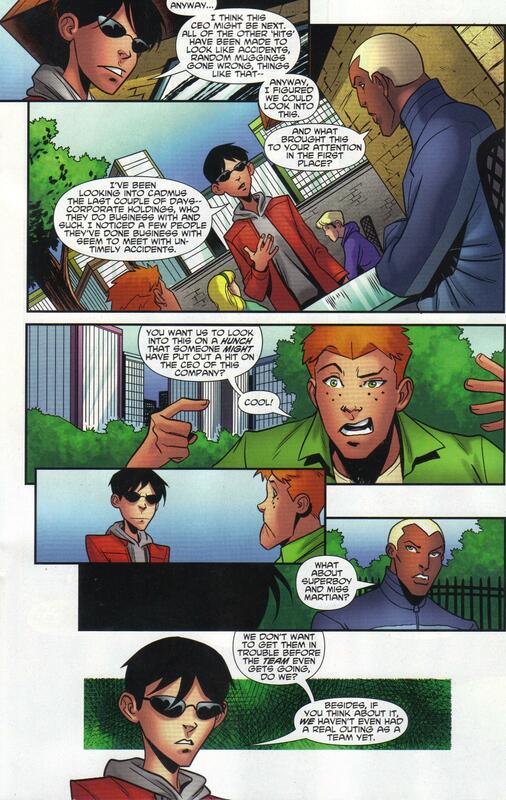 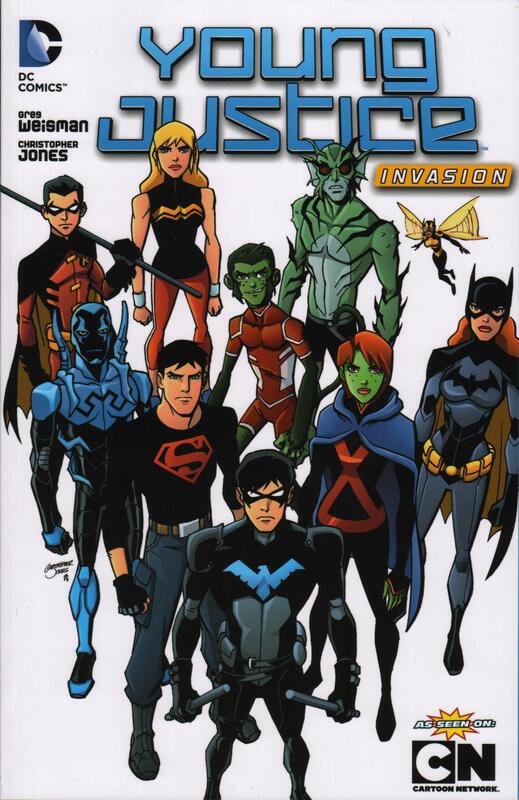 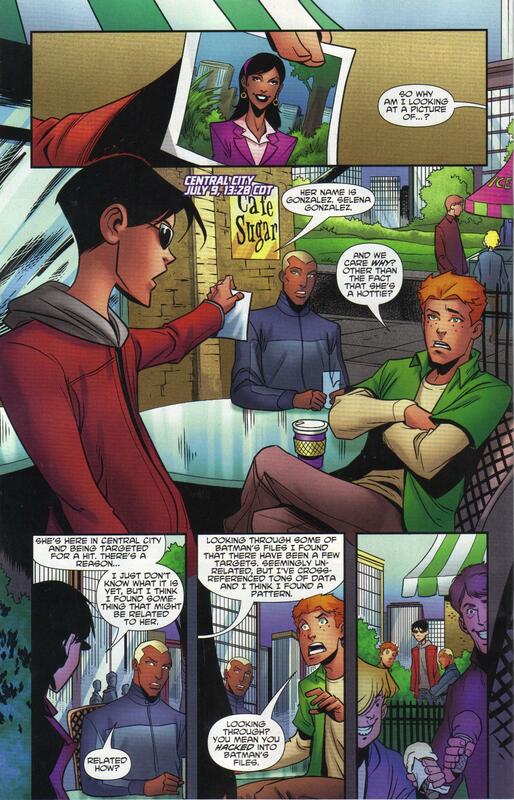 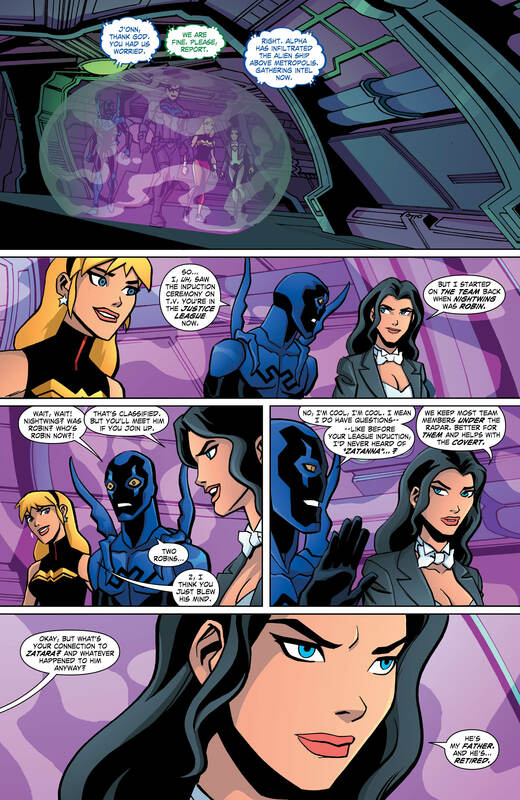 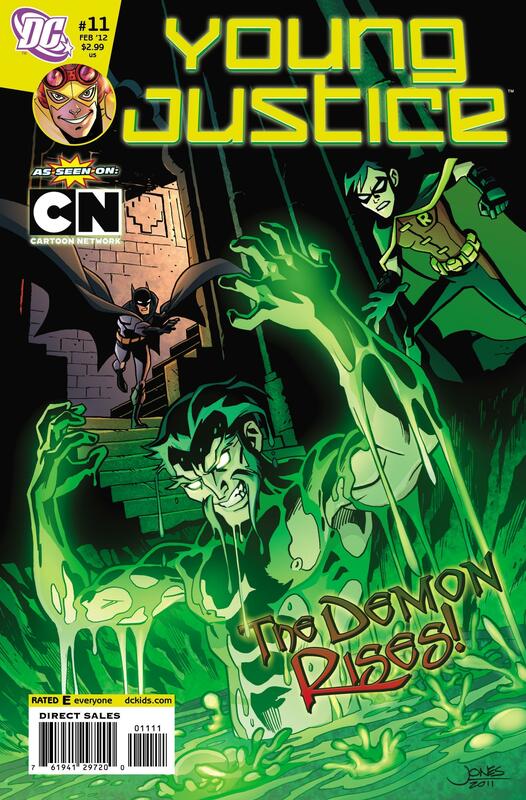 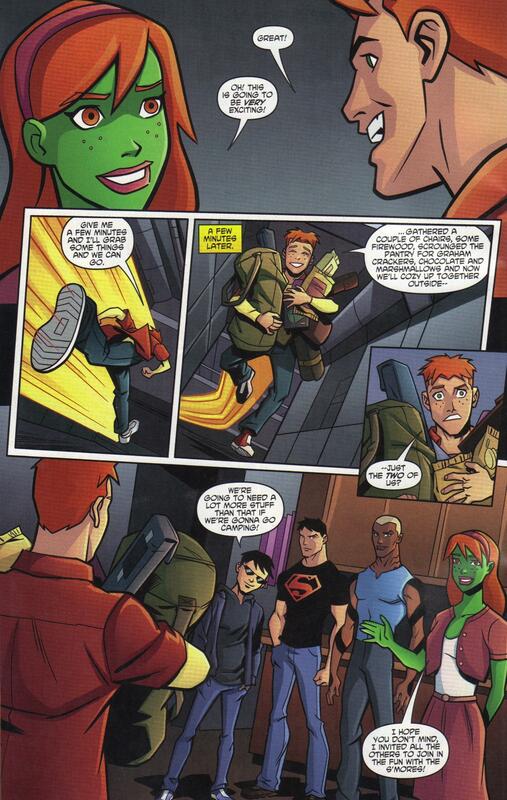 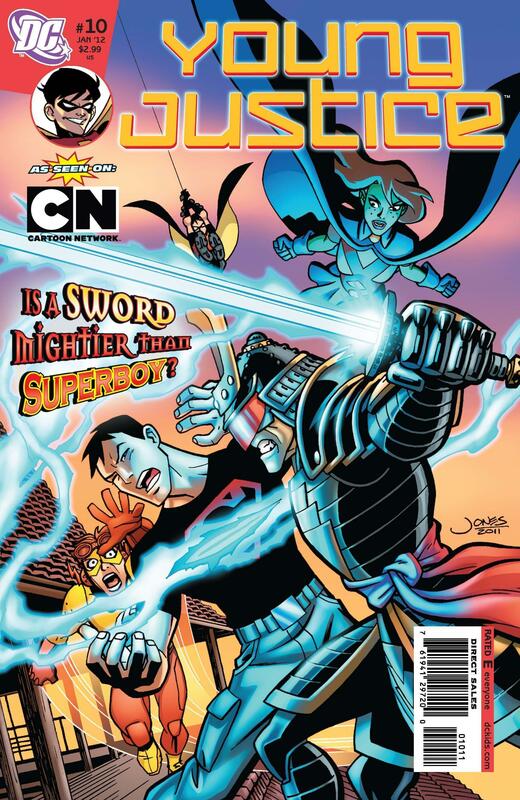 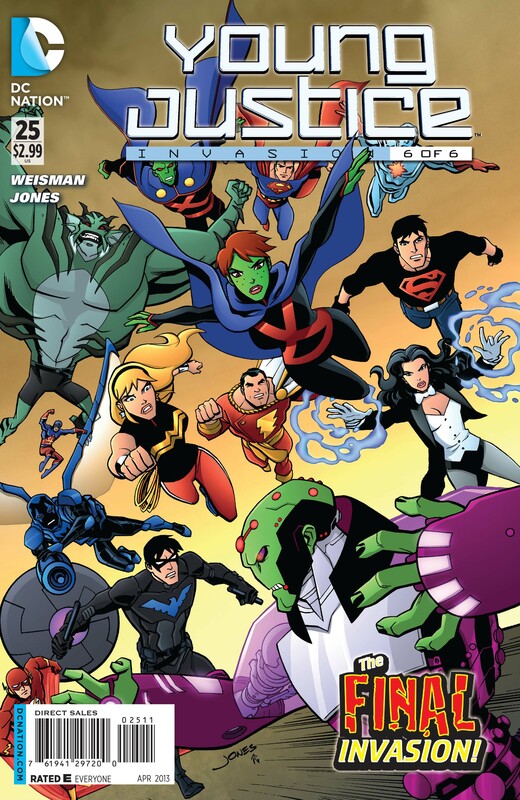 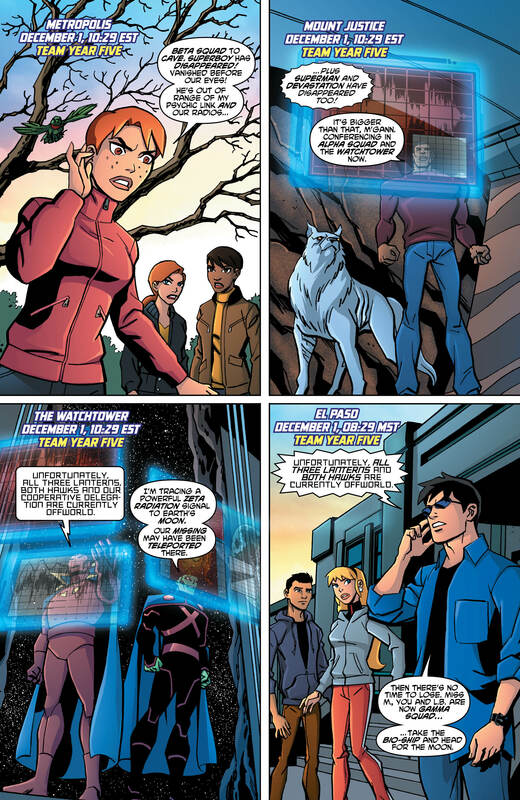 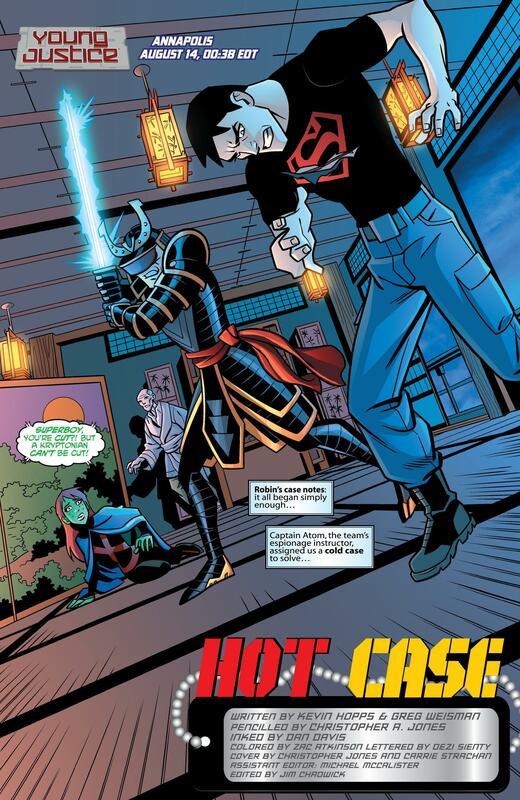 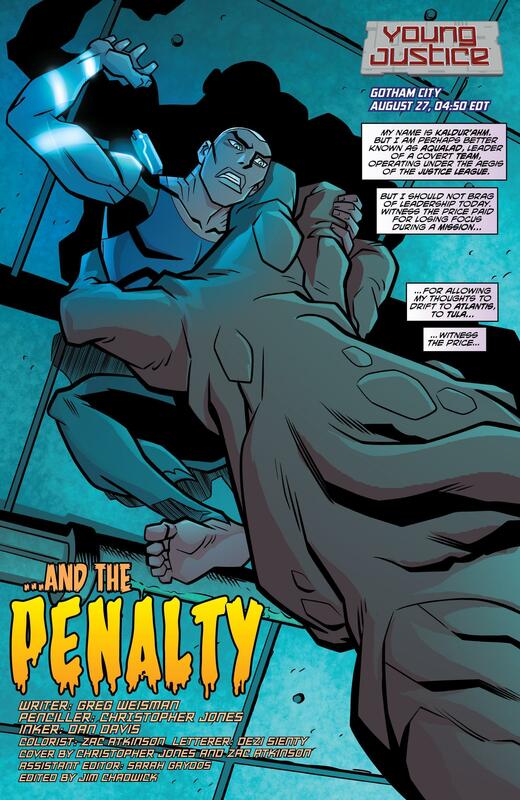 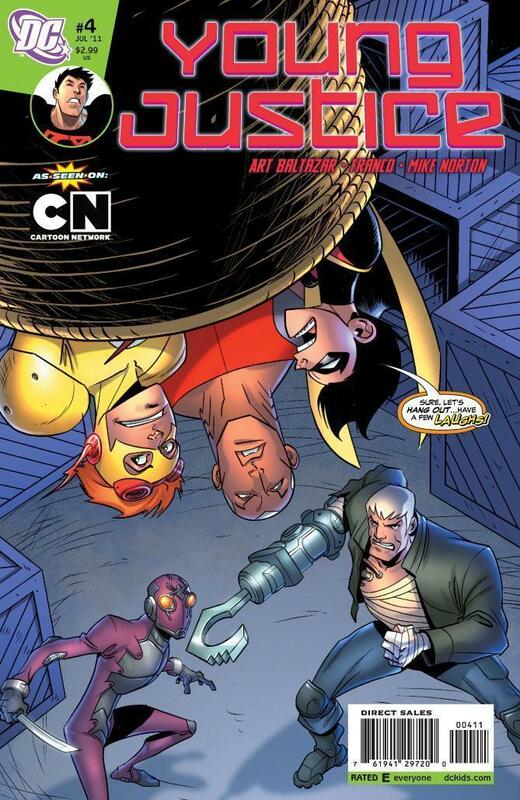 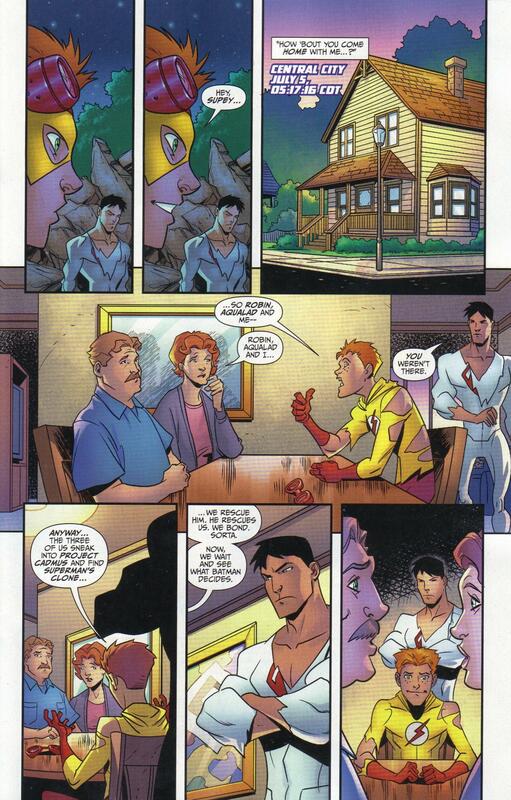 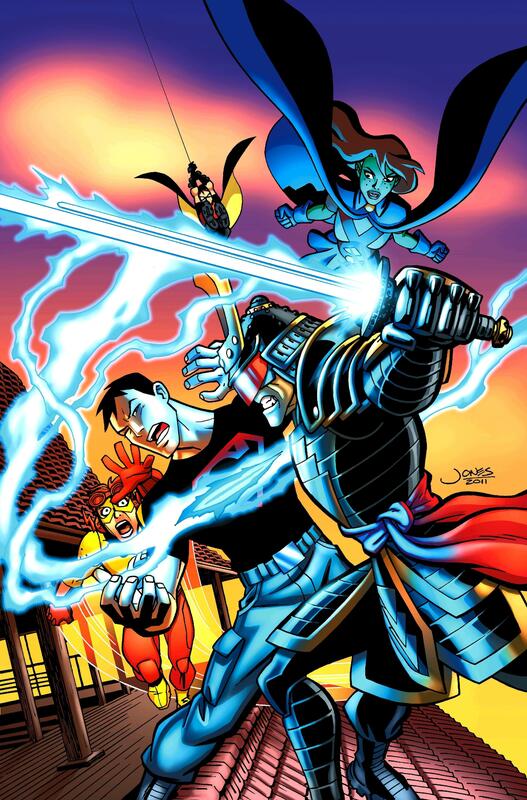 Published monthly by DC Comics, the Young Justice comic series features new stories in continuity with the animated series the title is based on. 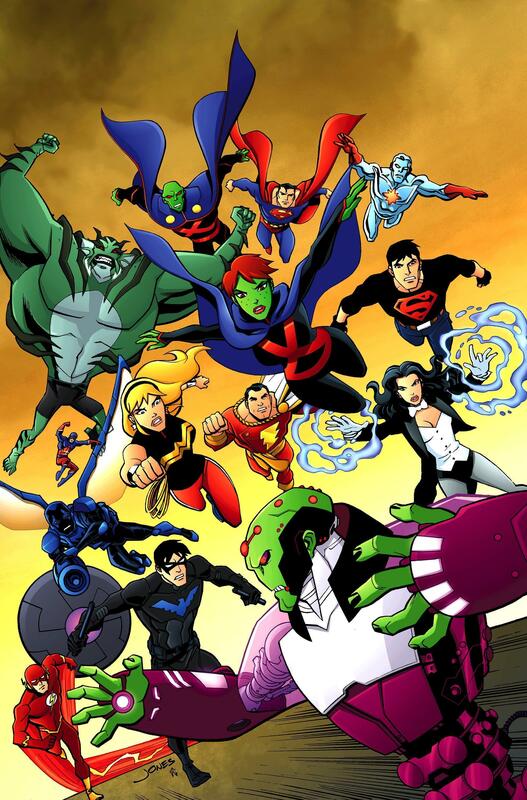 The series will provide a closer at the young super-hero team, highlighting and expanding upon characters and events that have happened in assorted episodes of the Young Justice animated series. 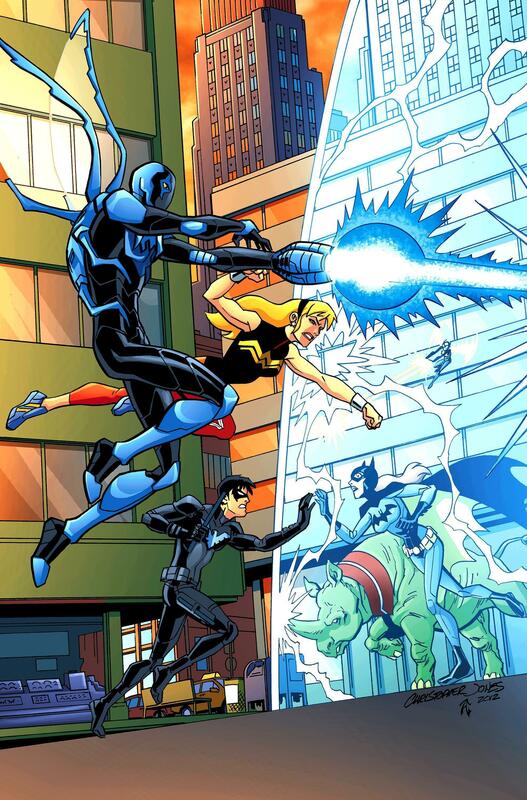 While not required reading for fans of Young Justice, the comic series will add more depth to the inhabitants of this animated world. 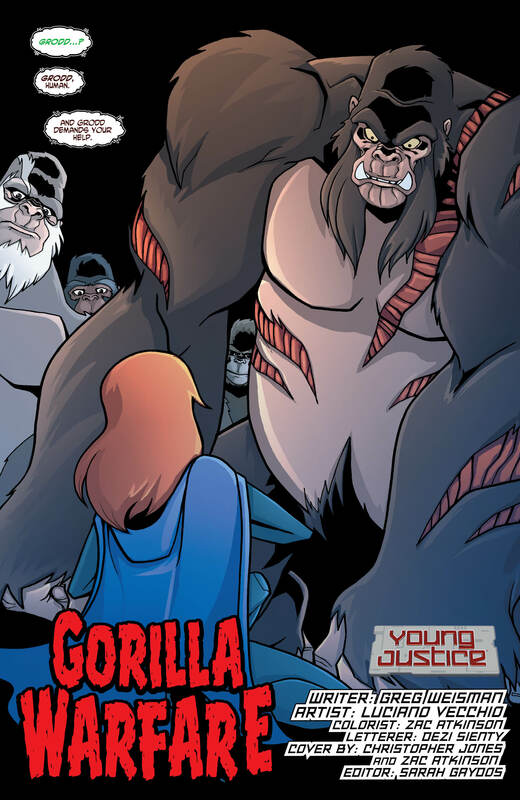 The Story: Based on the upcoming hit animated show from Warner Bros. debuting on Cartoon Network! 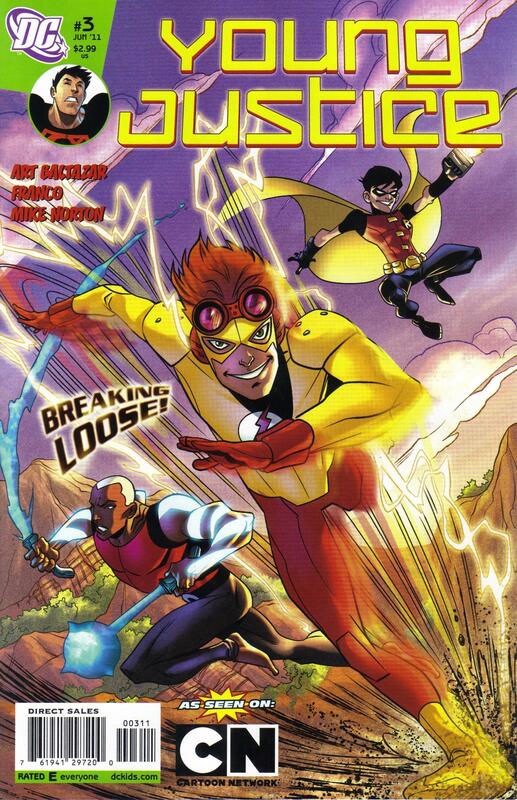 Robin, Superboy, Kid Flash and Aqualad star in this explosive issue kickstarting an all-new ongoing series! 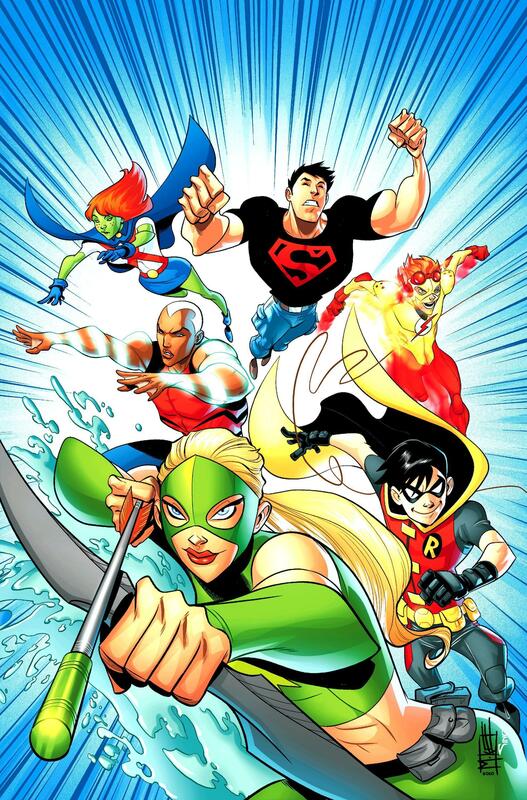 They're four young superheroes learning how to be a team...and maybe doing a bit of growing up along the way - but only just a little bit! 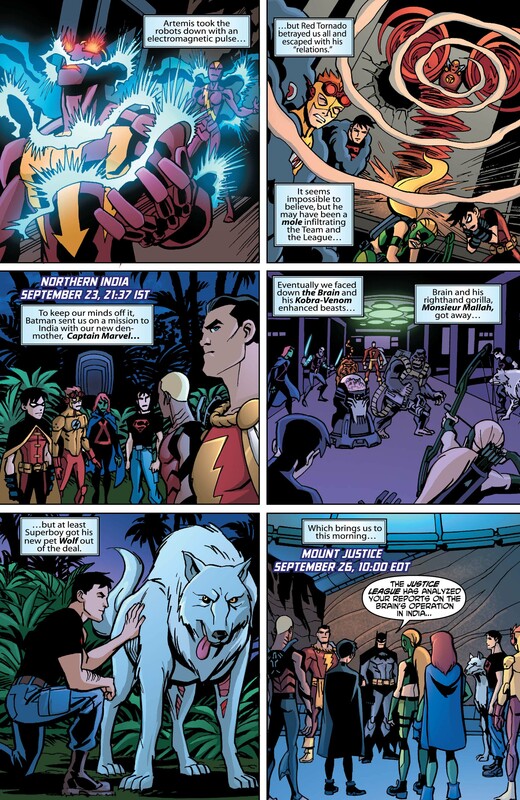 Animation writers Greg Wiesman (The Batman, Gargoyles) and Kevin Hopps (The Spectacular Spider-Man, Smurfs) join fan-favorite artist Mike Norton (Billy Batson and the Power of Shazam!) 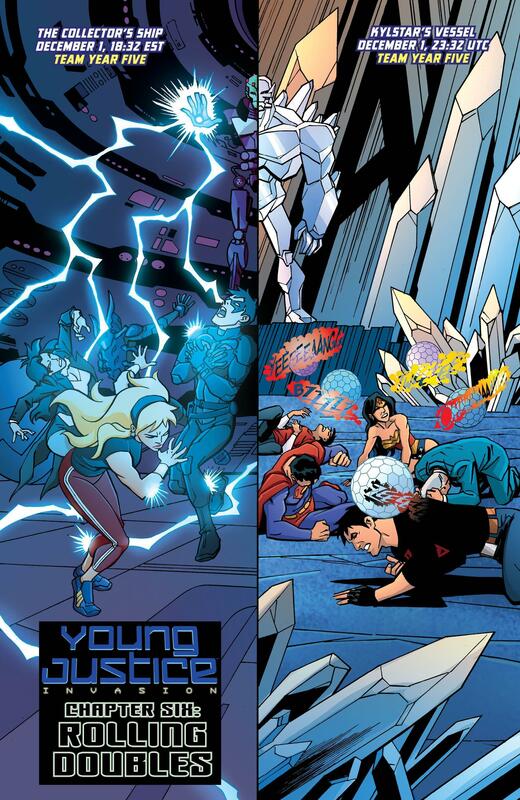 for this exciting new, all-ages title! 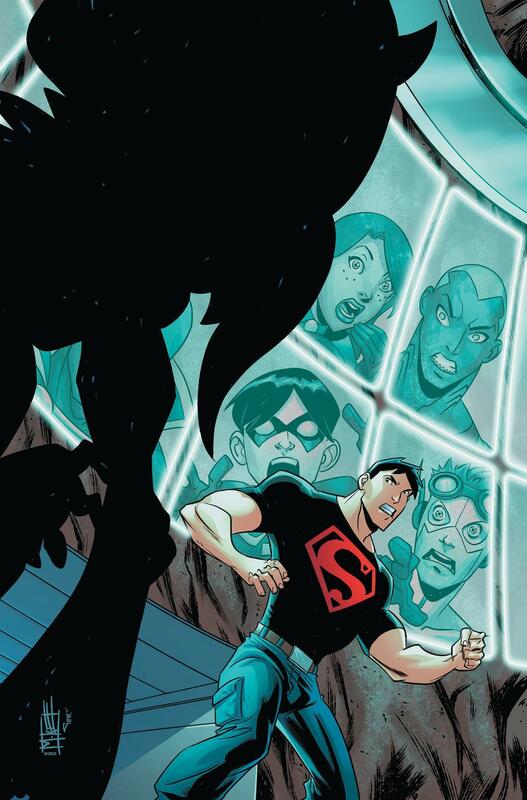 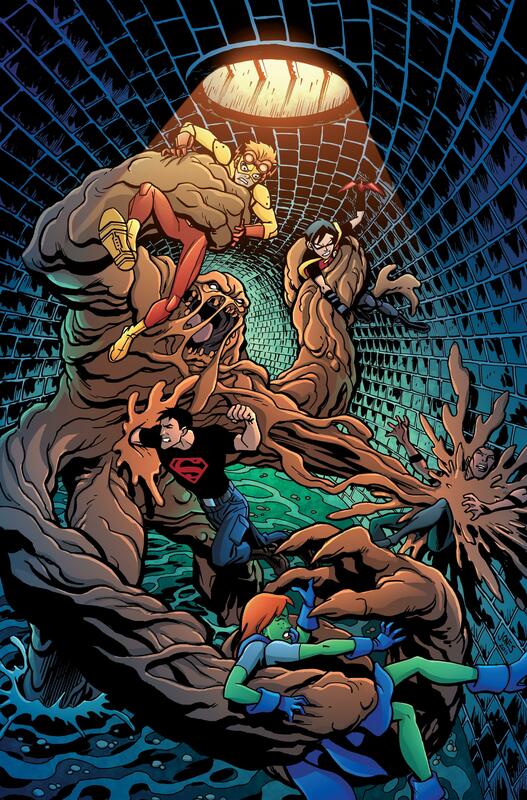 The Story: Superboy discovers that an unwanted guest in the team's cave is not really what he appears to be! 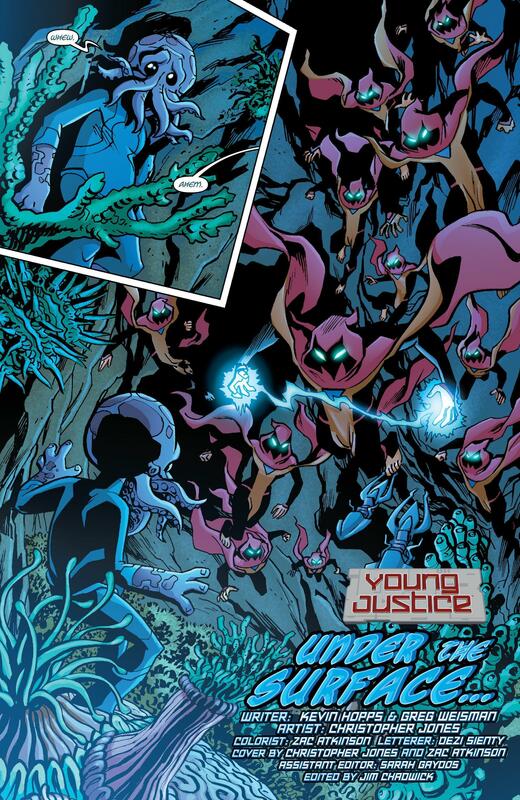 Is the threat deadly to only The Boy of Steel - or is the enture Justice League in danger, as well? 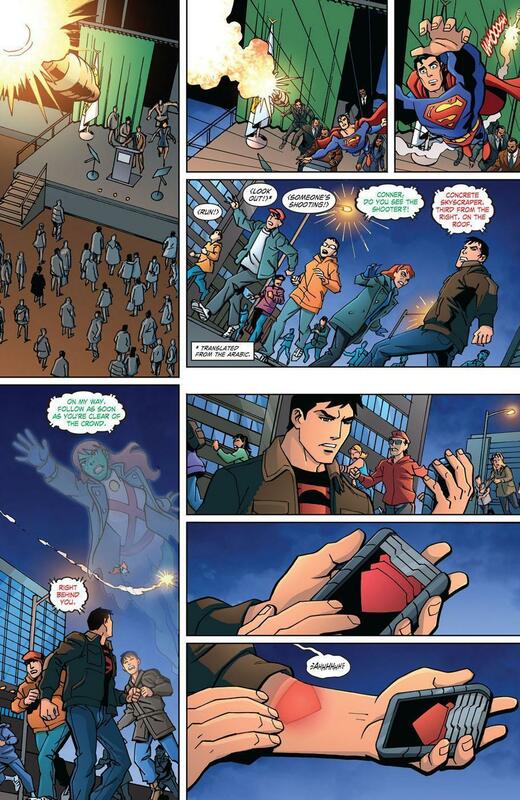 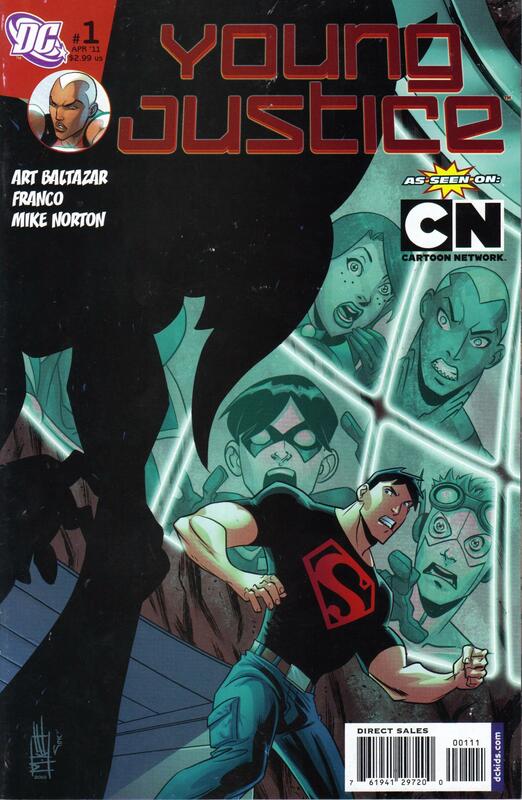 Superboy struggles to find the balance between fighting for himself and for the sake of others! 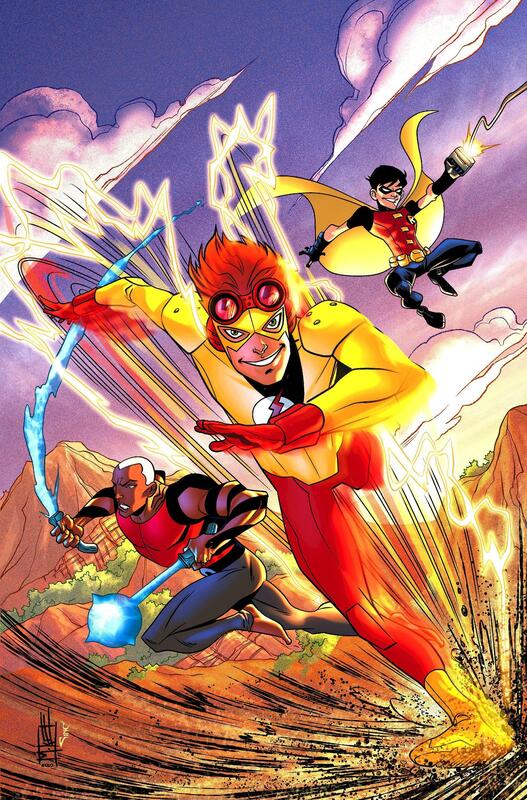 The Story: Robin decides that Kid Flash and Aqualad and he should take on a mission without waiting for orders from Batman. 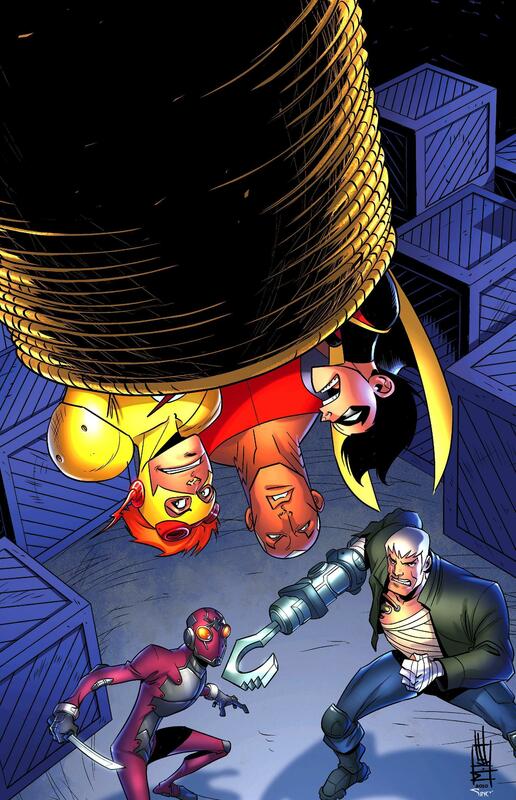 Big Trouble could be waiting up ahead! 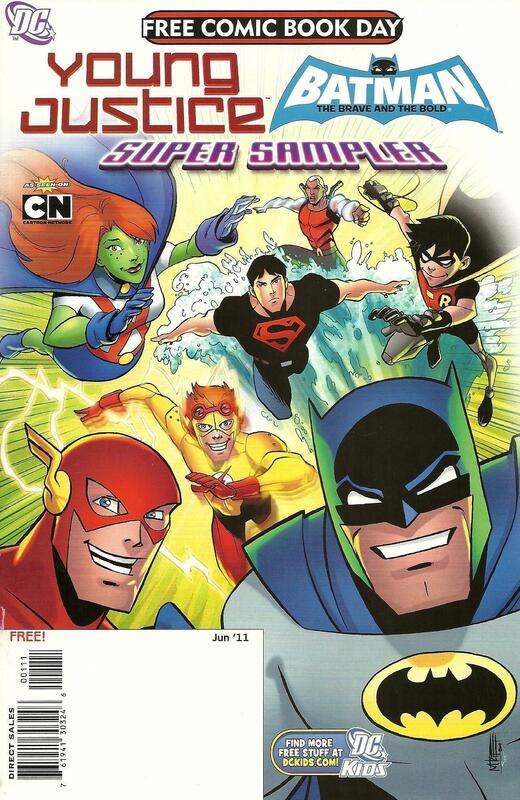 The Story: This super sampler is the perfect place to check out two sensational series from the DC Kids line, Young Justice and Batman: The Brave And The Bold, based on the popular animated series seen on Cartoon Network. 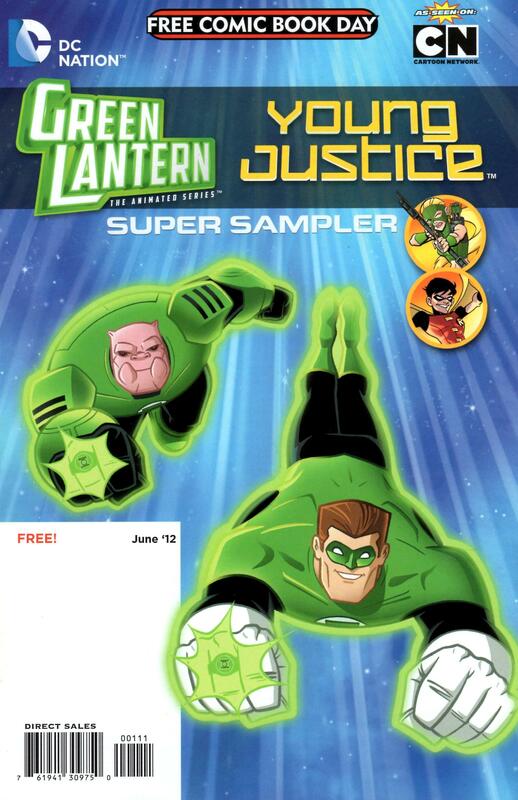 It includes two exciting, all-new stories that readers of all ages will enjoy! 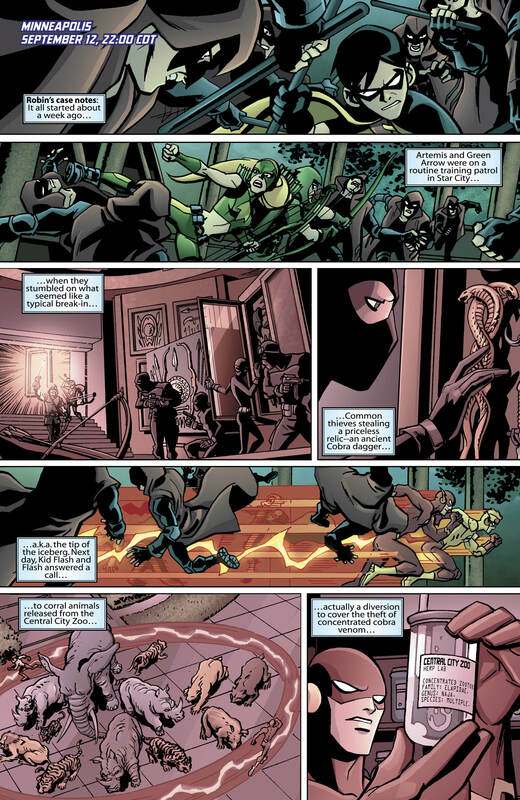 The Story: A woman is targeted by a covert group of assassins! 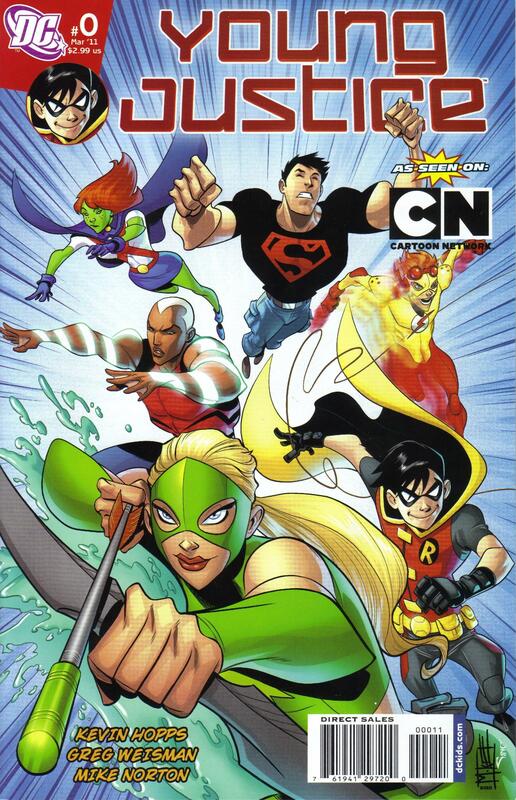 It's Robin, Kid Flash and Aqualad to the rescue, but can they save her from the combined menace of Hook and Black Spider? 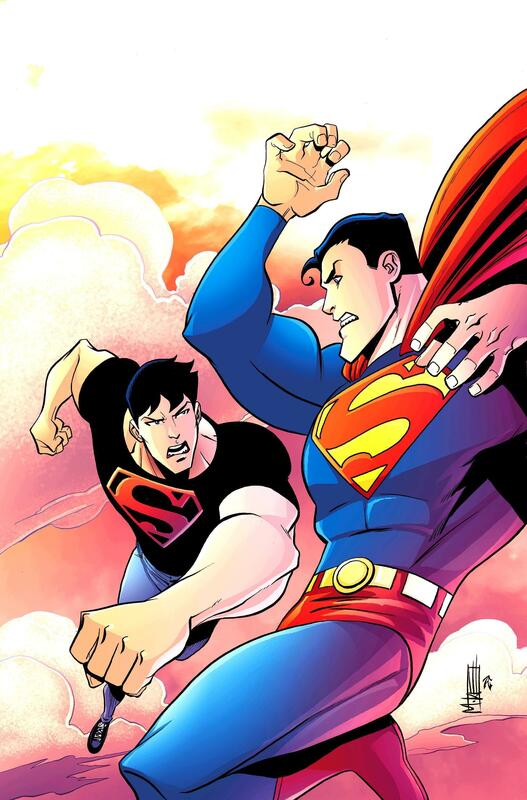 Only if they can escape from the deadly duo themselves! 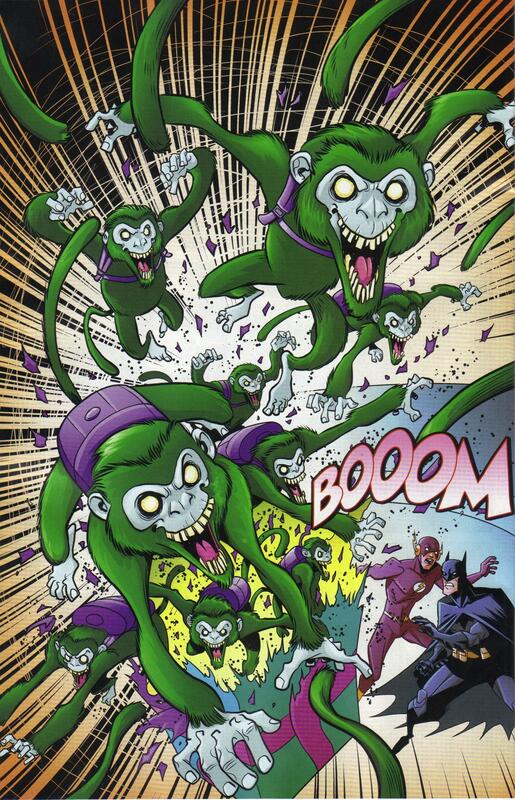 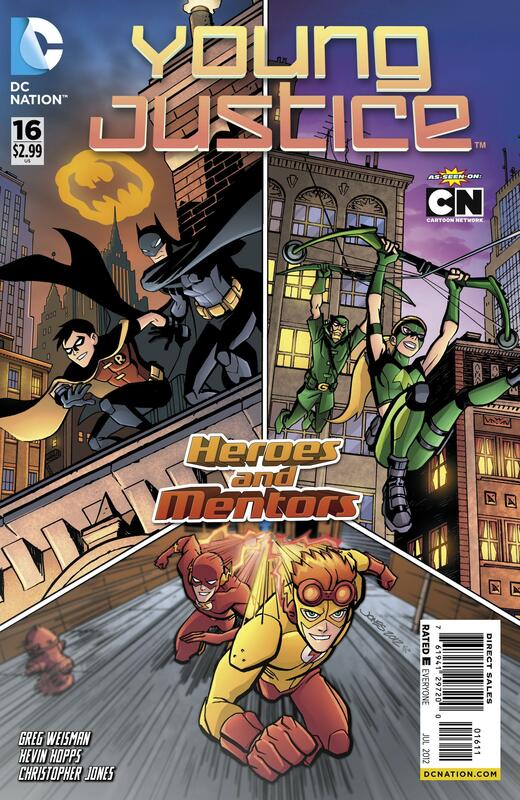 The junior heroes must prove they can work as a team and take on the menace of the League of Shadows at the same time! 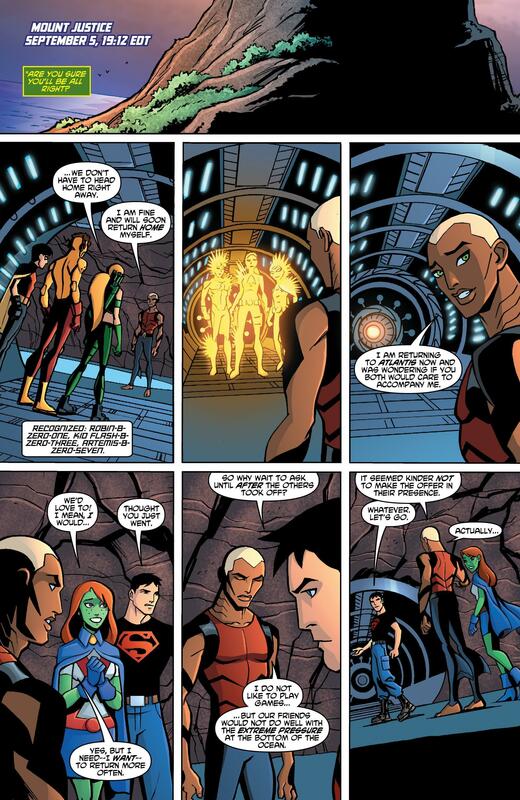 The Story: Aqualad, Robin, Kid Flash, Superboy and Miss Martian are ready for their first mission as a team. 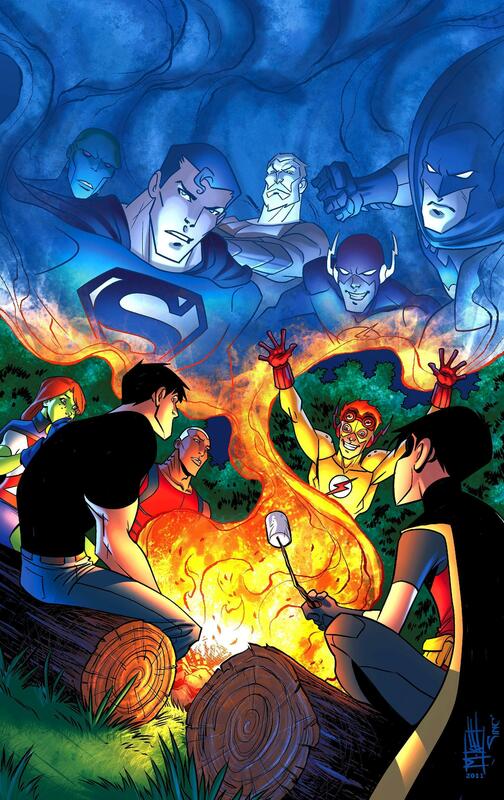 To get to know each other better, they decide to trade stories around the campfire, revealing how they all started as crimefighters. 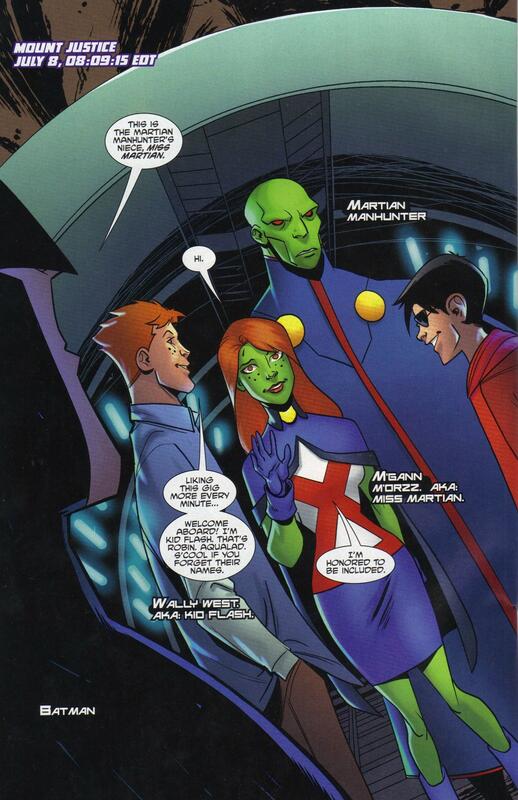 Will this bring them together or underscore their differences? 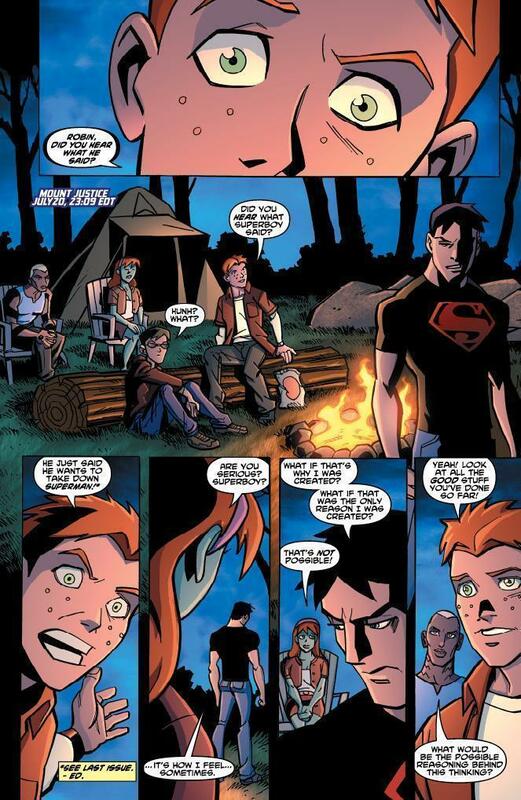 The Story: Campfire bonding continues as the members of the team share their background stories as well as their hopes and fears. 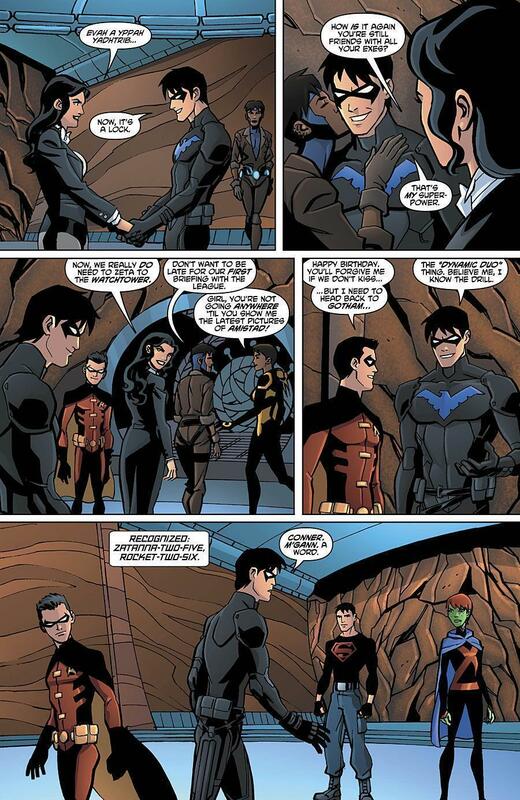 But when do these team-building exchanges cross over into TMI territory? 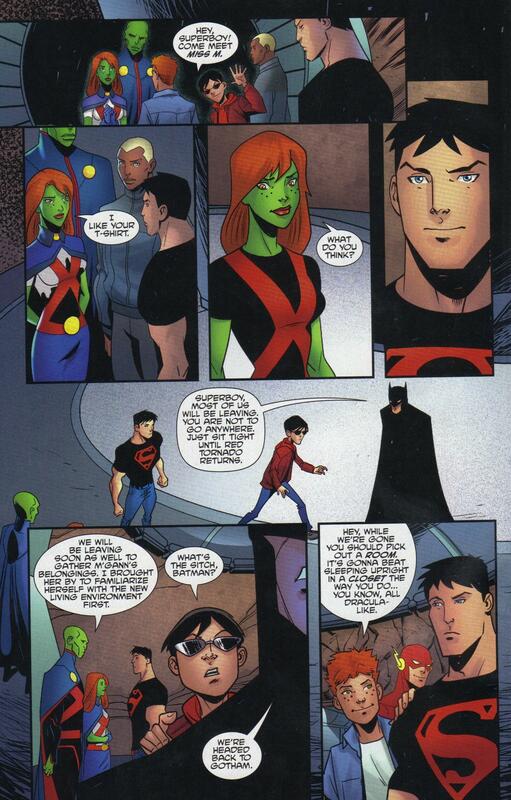 How about when Superboy tells everyone how he's thinking of taking out Superman? 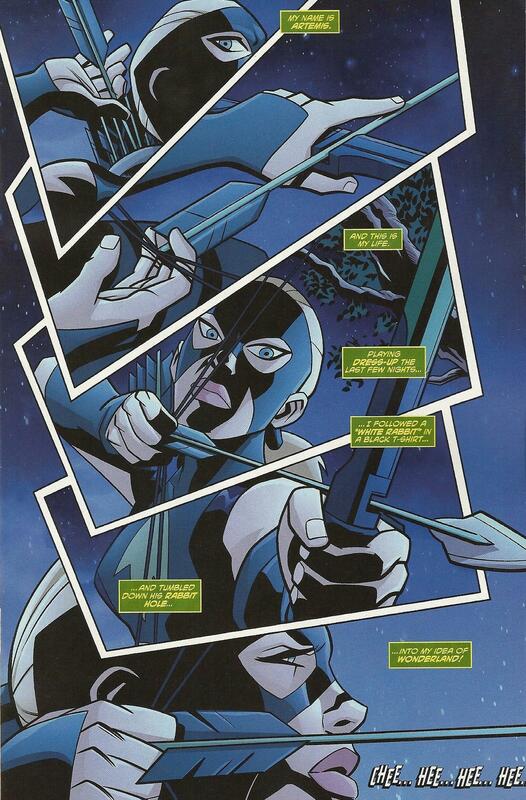 The Story: When night descends on Gotham City, Artemis takes to the streets. 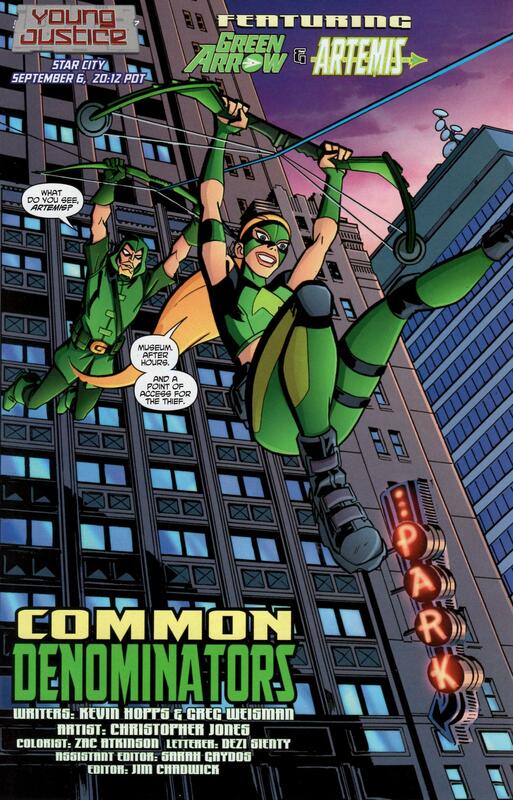 Prowling the rooftops and the alleyways for the first time, this teen archer has a choice to make: Will she fight on the side of the angels or follow a darker path? 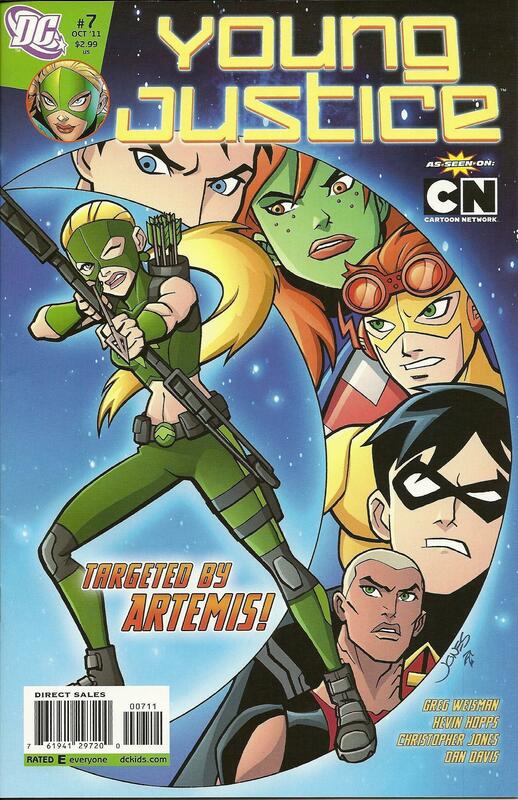 The Story: Can someone with Artemis' pedigree really be a hero? 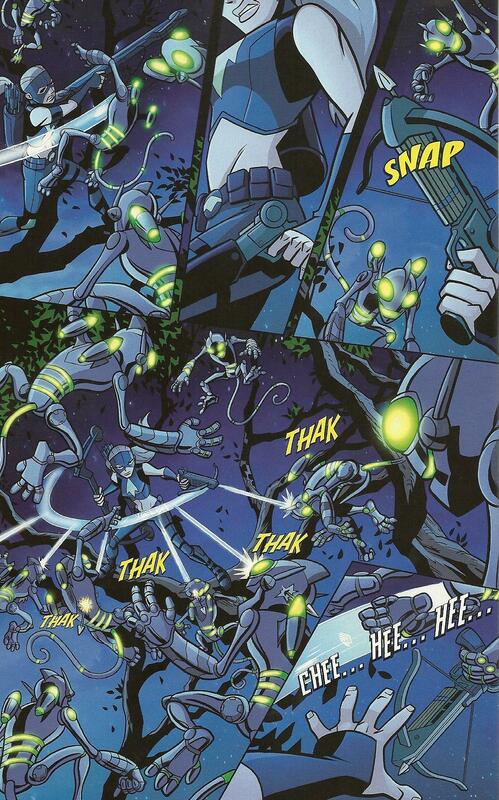 A close encounter when the team takes action against the deadly android Amazo may give her the chance to prove herself - if she can survive the onslaught of Professor Ivo's malevolent MONQIs! 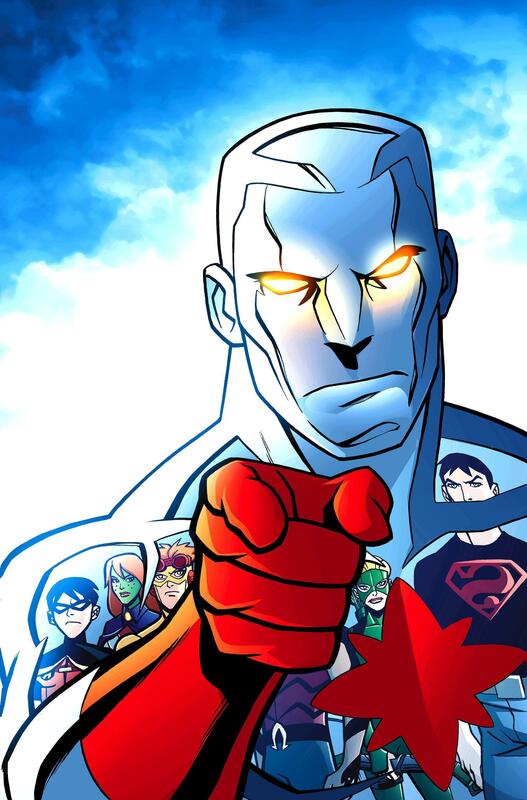 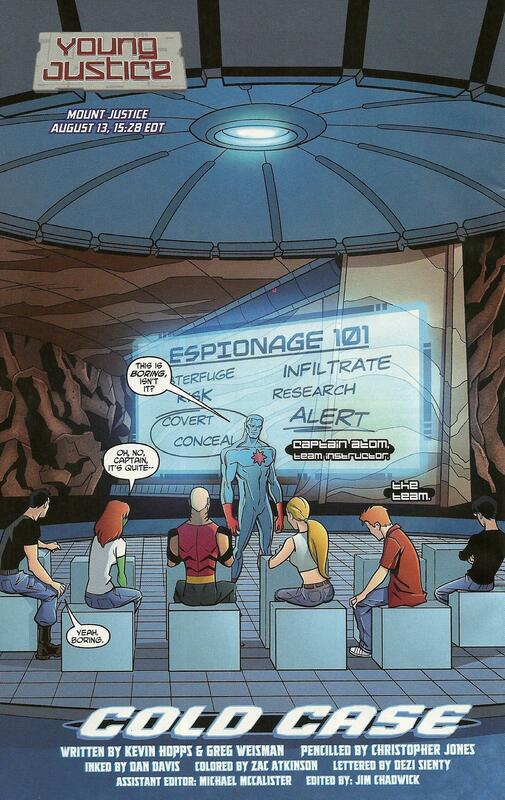 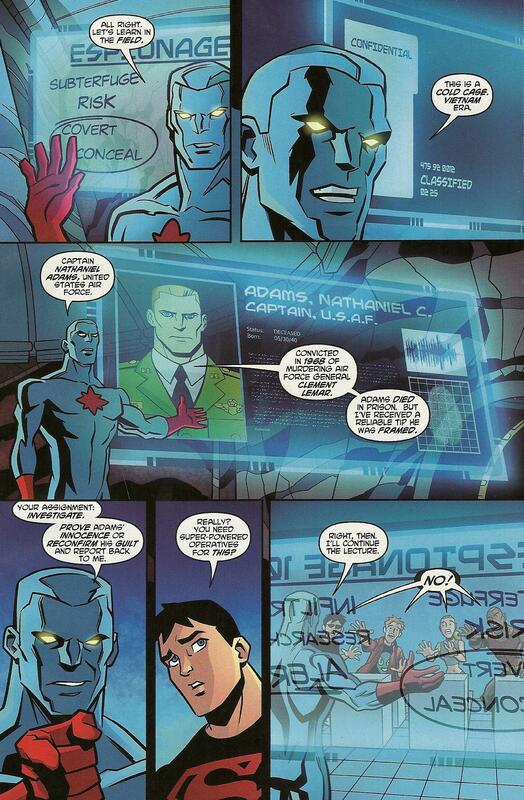 The Story: The team is taking Espionage 101 from Captain Atom. 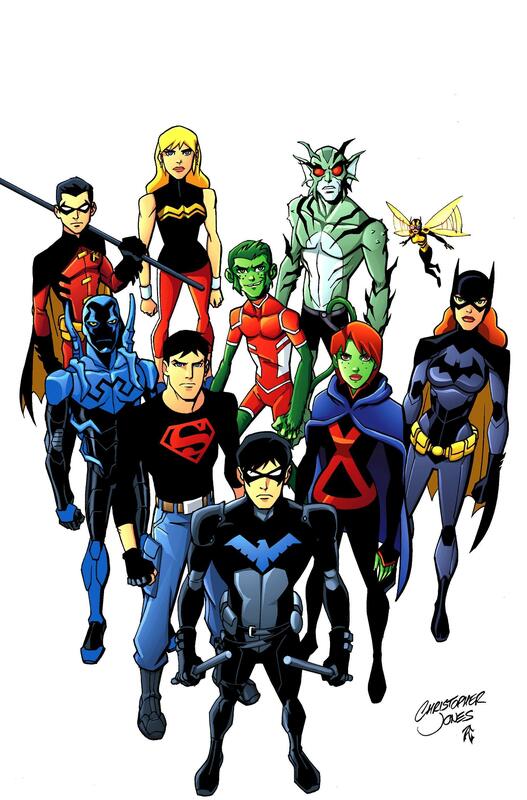 Their class project is to solve a cold case that involves a forty-year-old murder mystery, a military conspiracy and a half-decent chance that none of them will come out alive. 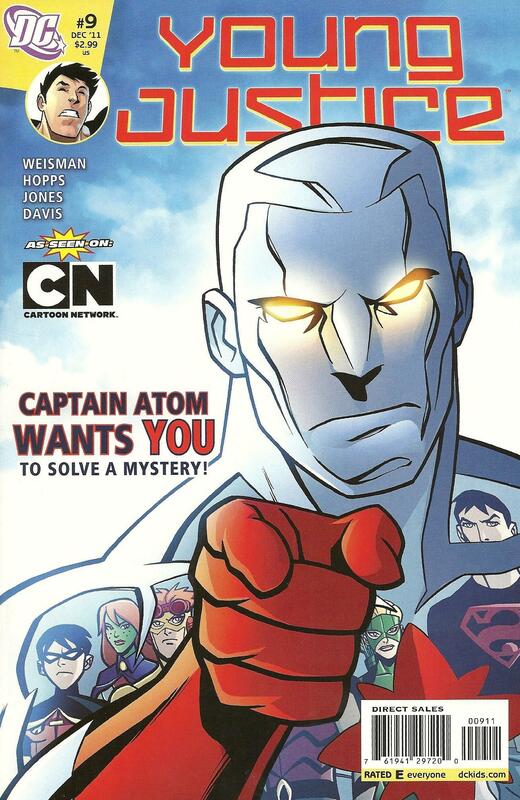 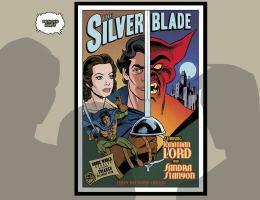 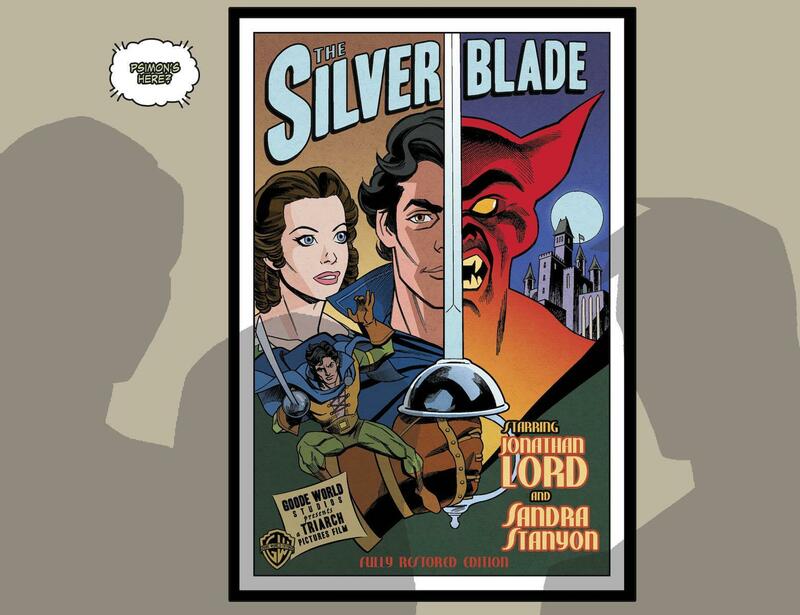 The Story: Captain Atom's cold-case assignment is definitely heating up: The true killer has resurfaced to target anyone who might expose the truth about the murder of General Lemar back in 1968 - and that includes each and every member of the Team! 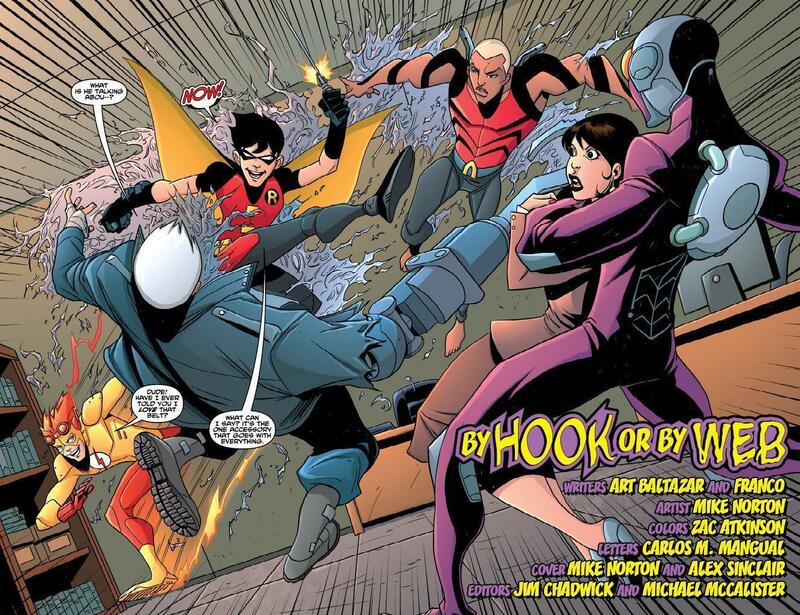 The Story: The spotlight turns to Robin, who must leave his teammates to fight alongside his crimefighting mentor, Batman. 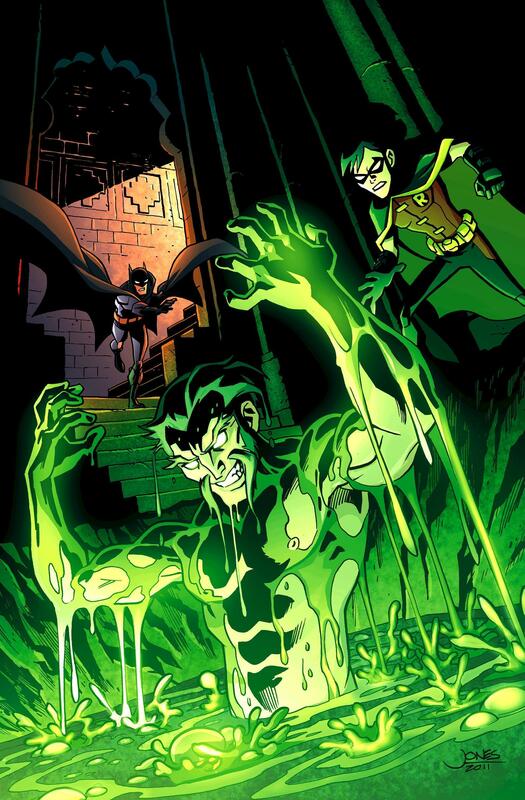 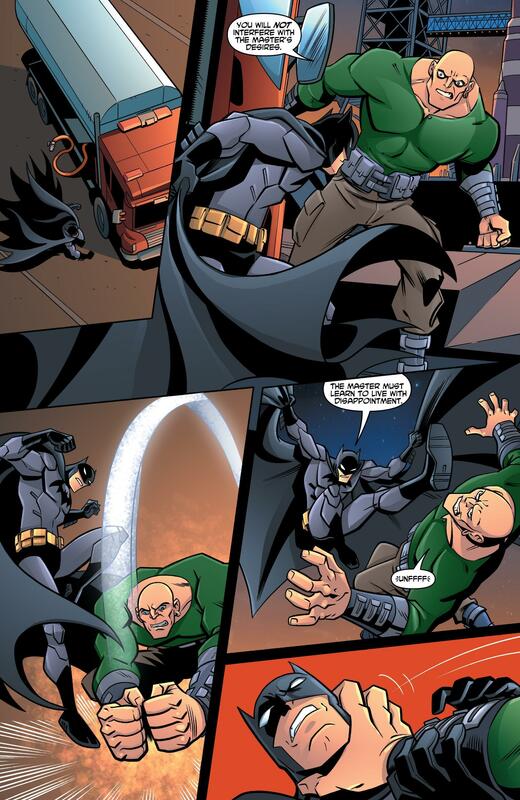 And the stakes couldn't be higher for the Dynamic Duo as they face off against the Demon's Head himself: Ra's al Ghul! 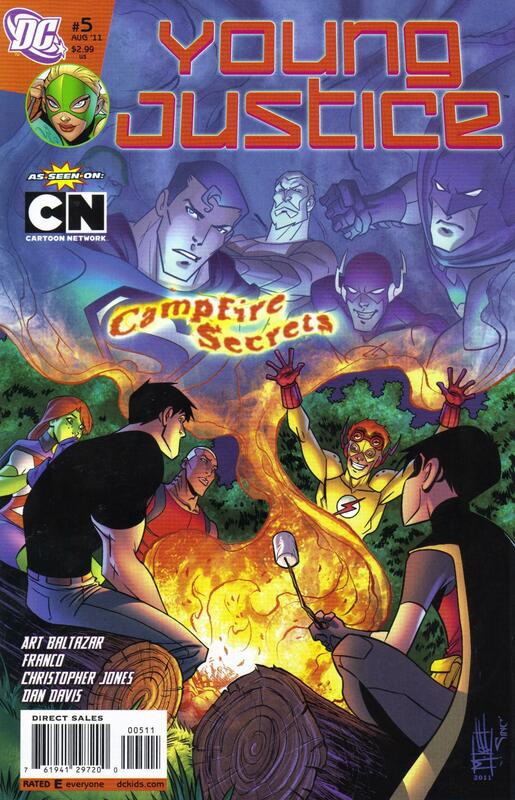 The Story: In these stories from Young Justice #0-6, the team takes on The Joker, meets Snapper Carr and trades campfire tales of past battles alongside their crimefighter mentors. 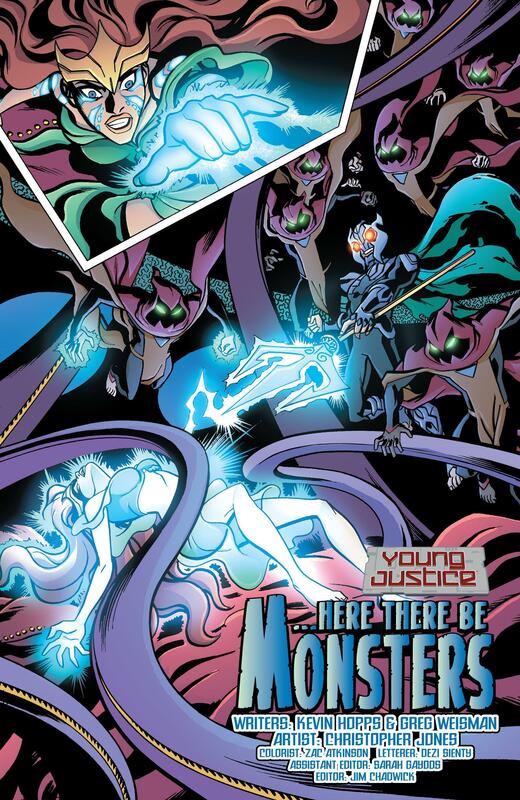 The Story: There's a new menace in Gotham City: a creature so strange - and so versatile - that not even the combined might of the entire Young Justice team can stand against it. 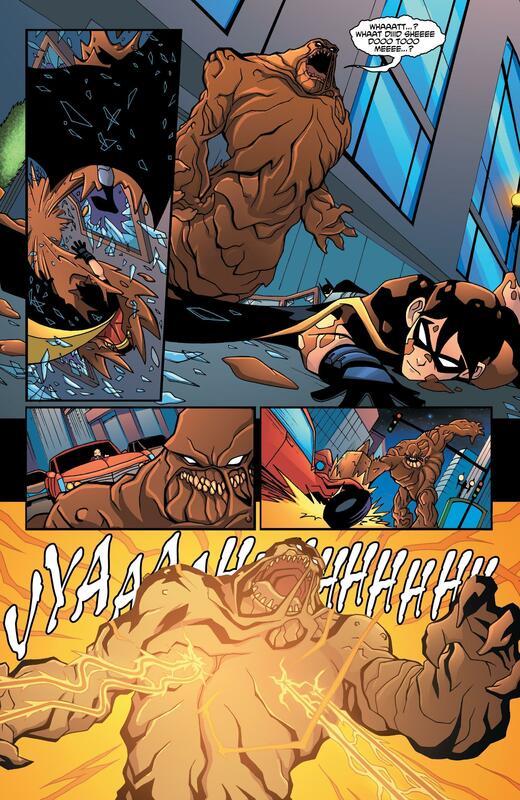 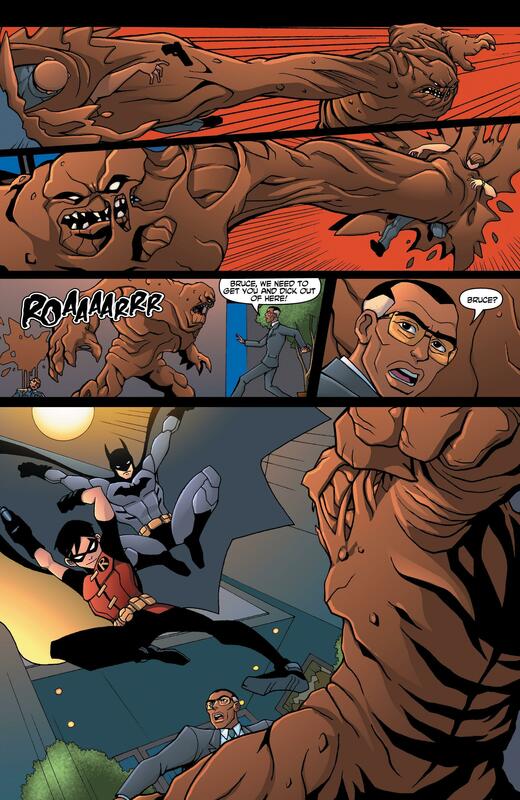 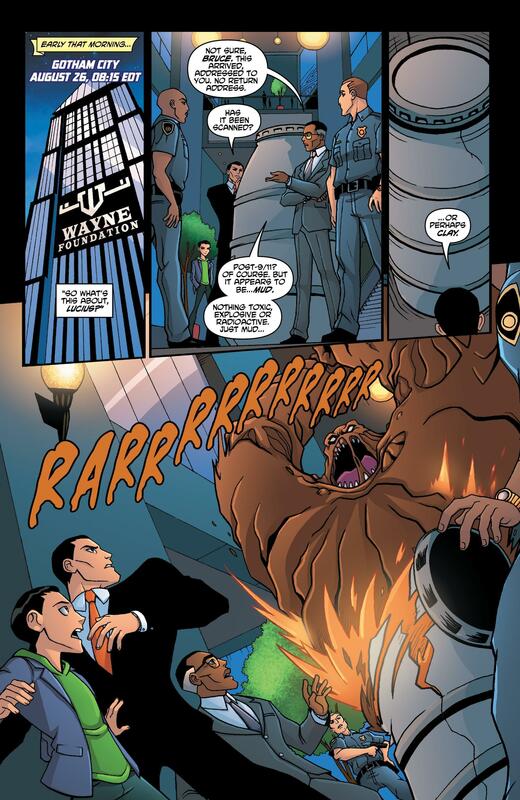 Witness the origin of...Clayface! 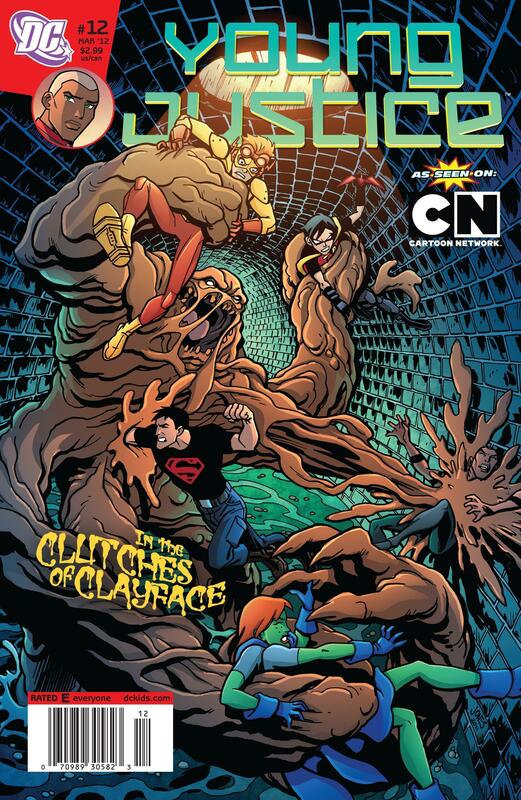 The Story: In Star City, Artemis is under arrest - and in Gotham City, it's Clayface vs. the rest of the team in a battle they cannot win! 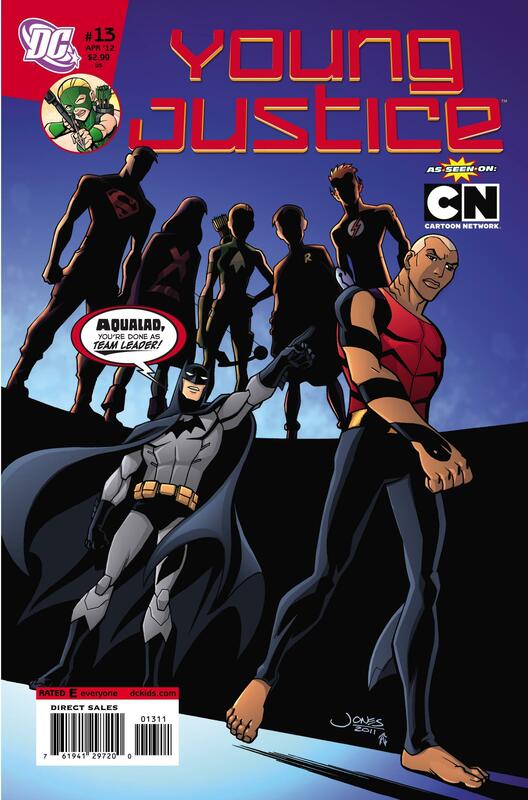 Aqualad's leadership is on the line, and a fateful choice must be made. 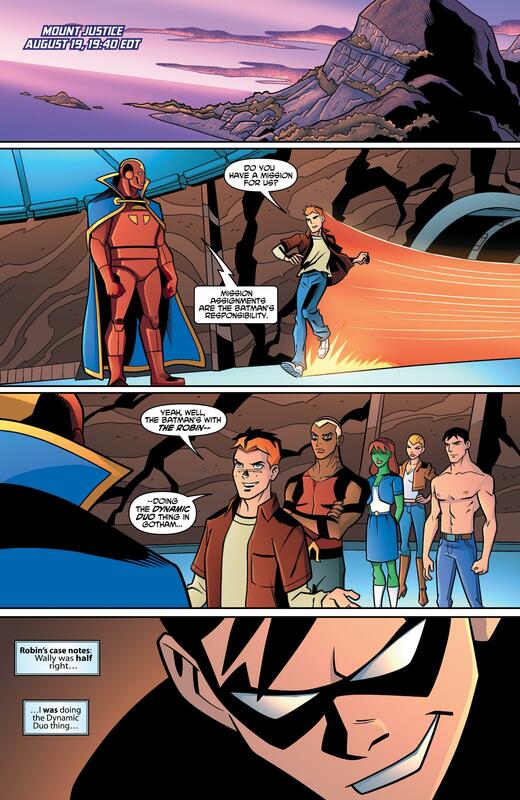 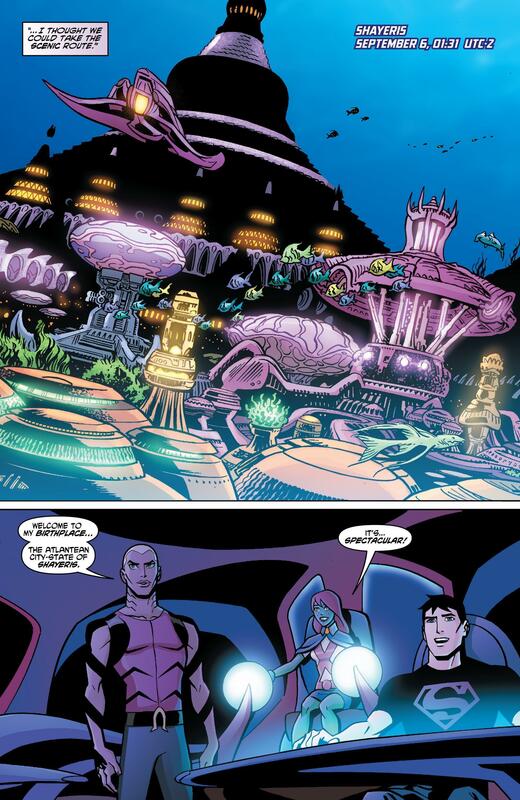 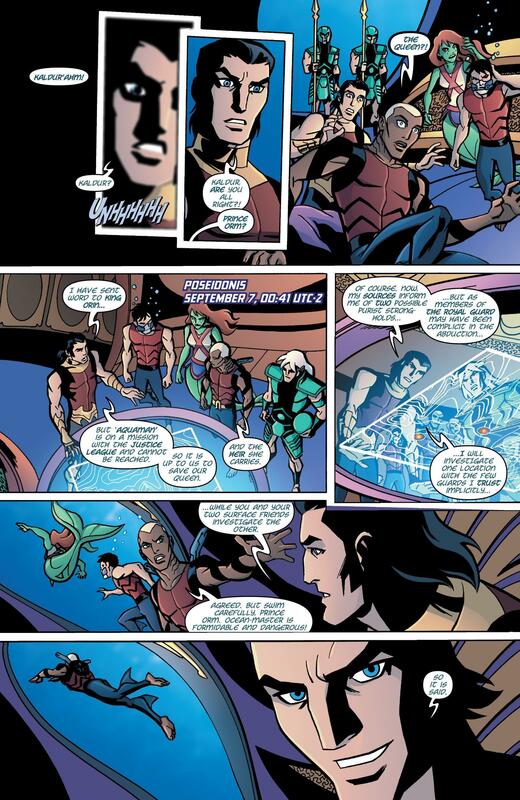 The Story: Aqualad visits Atlantis with Superboy and Miss Martian. 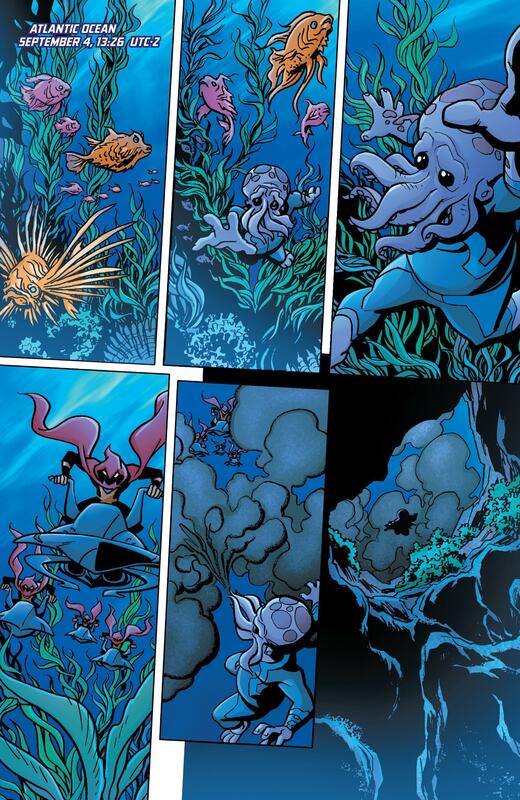 But can they stop an insidious new menace that threatens to plunge the undersea kingdom into civil war? 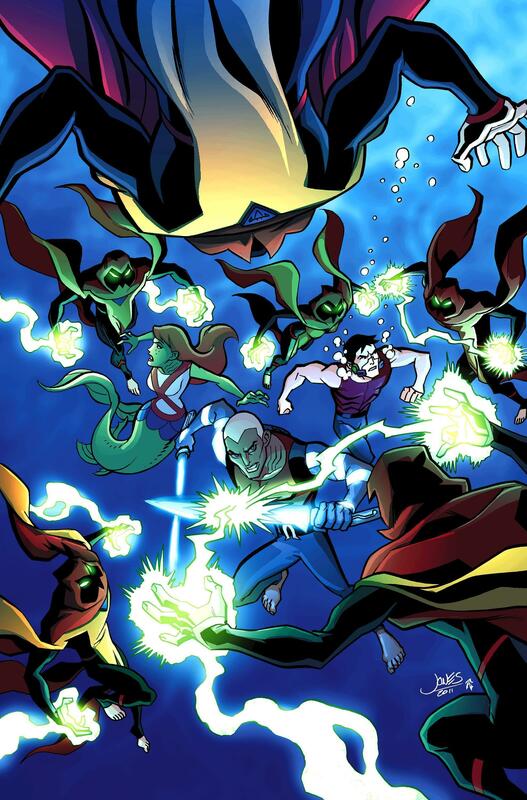 The Story: Ocean-Master's plan to purify Atlantis brings Aqualad to death's door and forces his former schoolmates to choose sides. 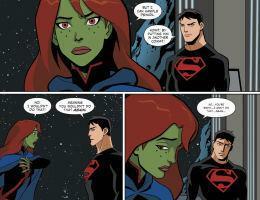 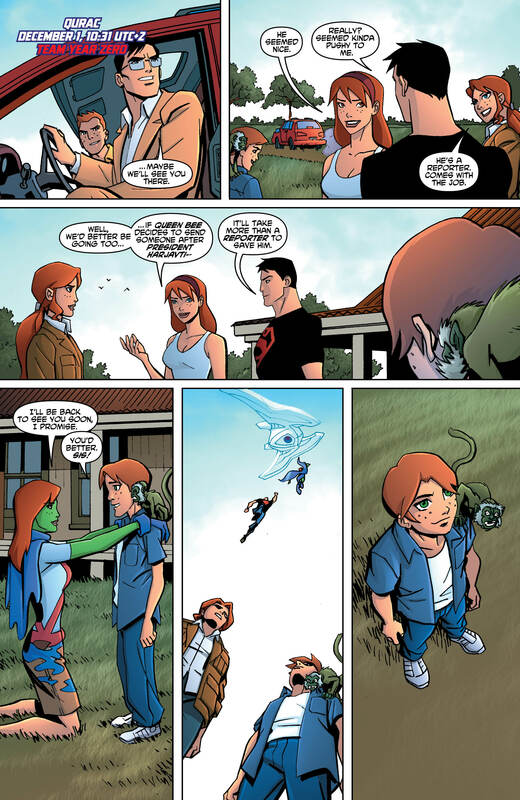 Can even Superboy and Ms. Martian help him? 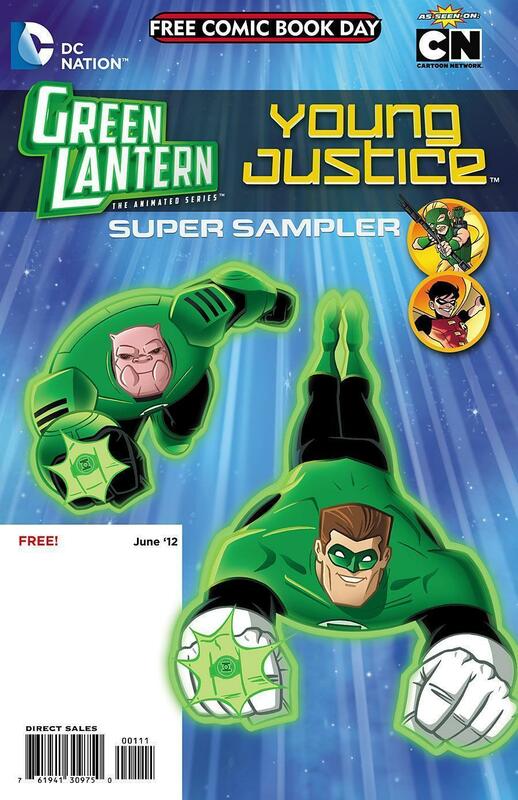 The Story: This super sampler is the place to check out Green Lantern Adventures and Young Justice, two sensational new comic series from the DC Kids line based on Warner Bros. 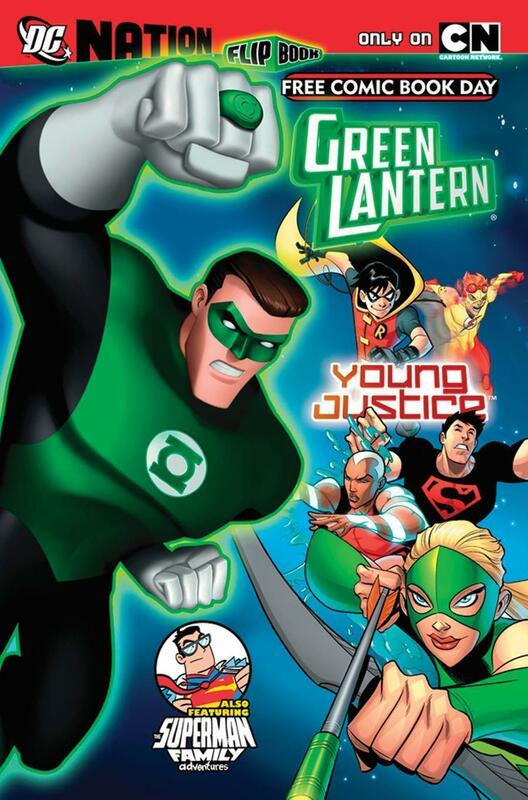 Animation's popular Green Lantern: The Animated Series and Young Justice, featured on the upcoming DC Nation programming block on Cartoon Network in 2012. 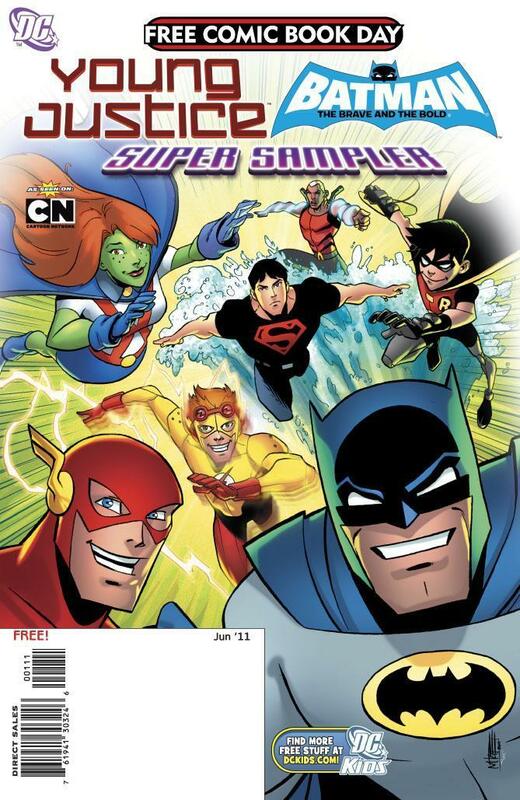 The sampler includes two exciting, all-new stories that readers of all ages will enjoy. 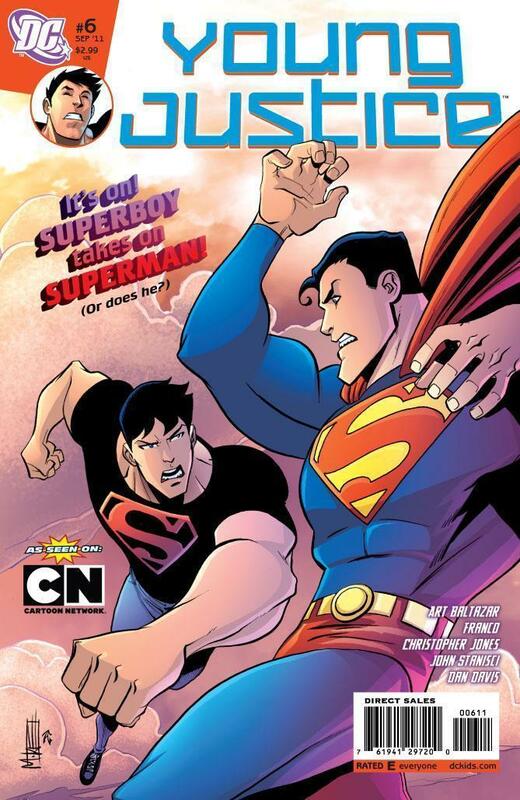 Plus, get a sneak-peek at the brand-new Superman Family Adventures monthly series from the Tiny Titans creative team! 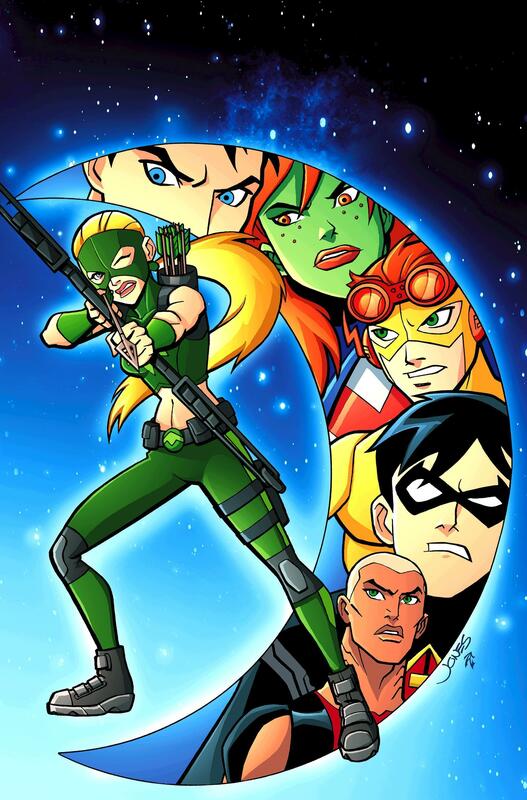 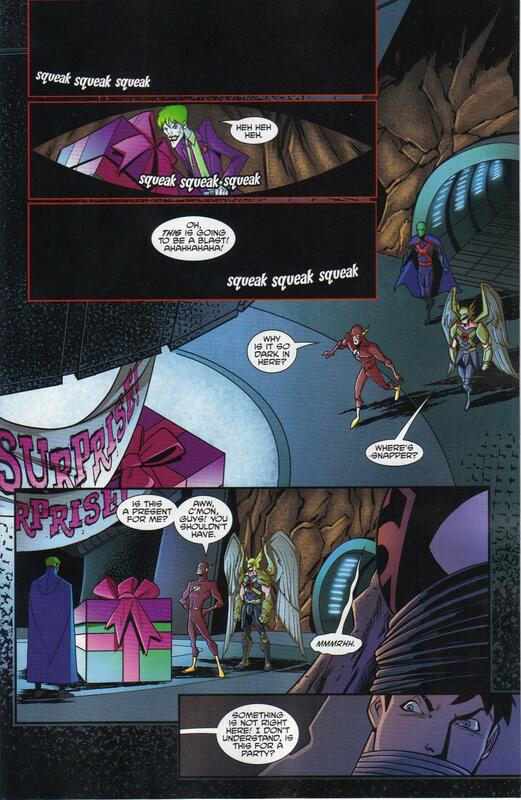 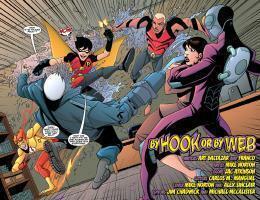 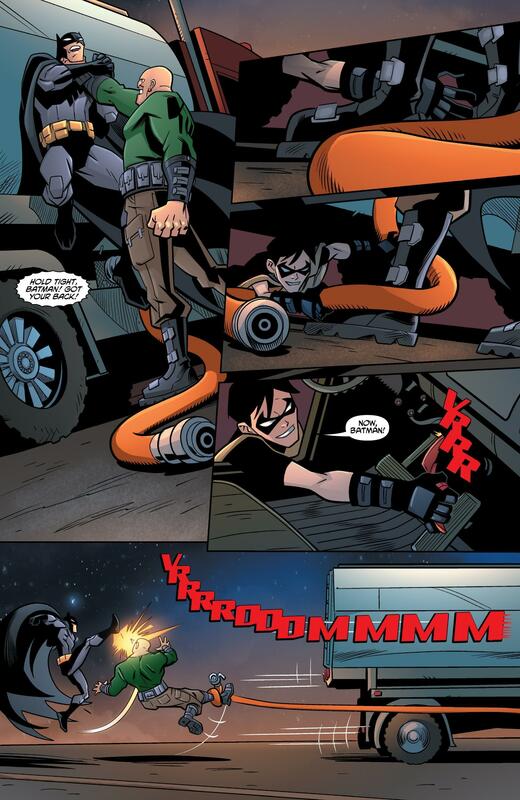 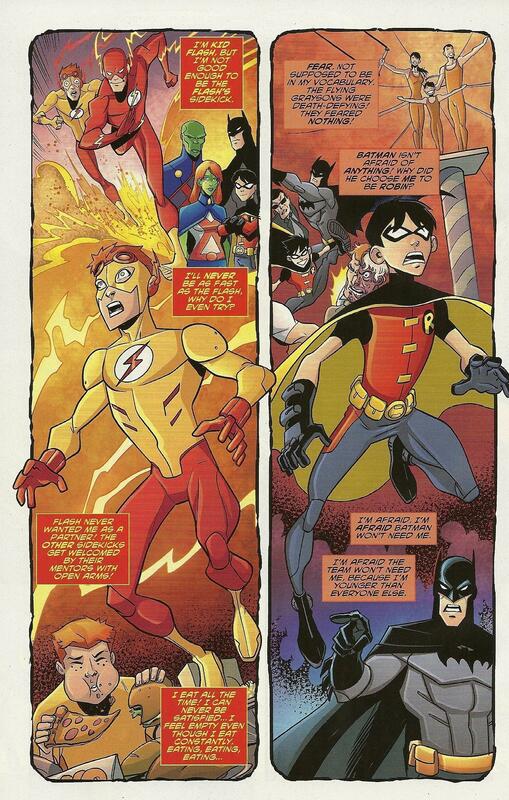 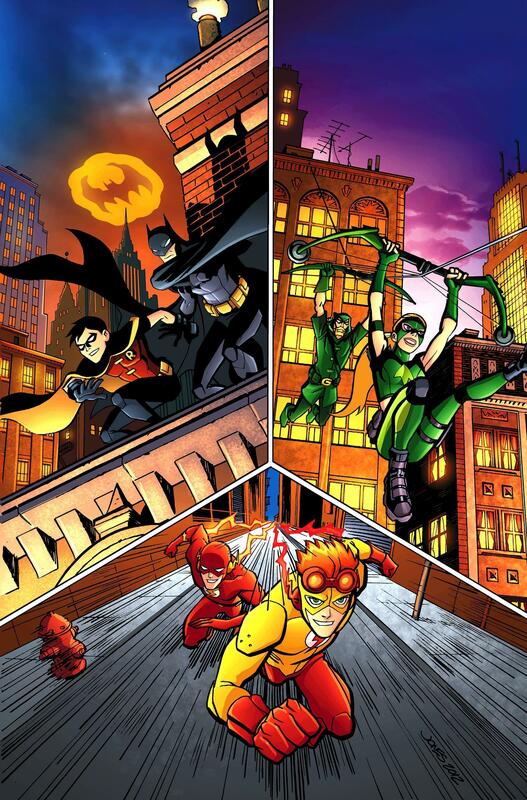 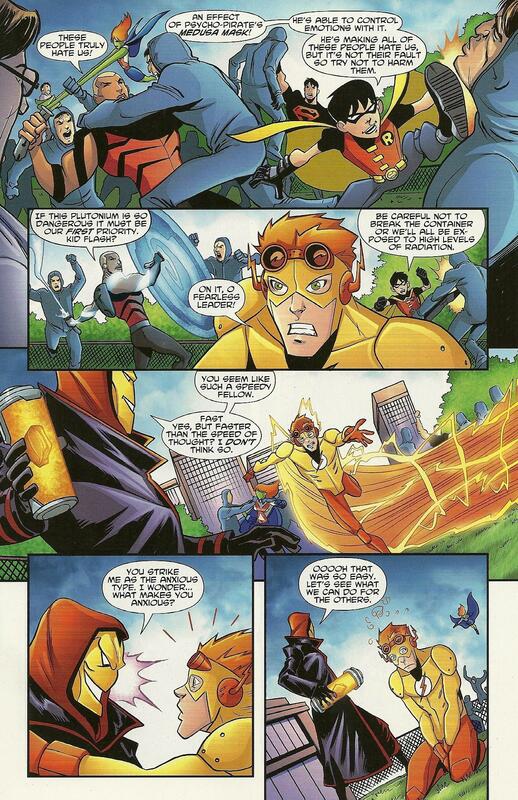 · Robin, Kid Flash and Artemis fight crime with their adult counterparts! 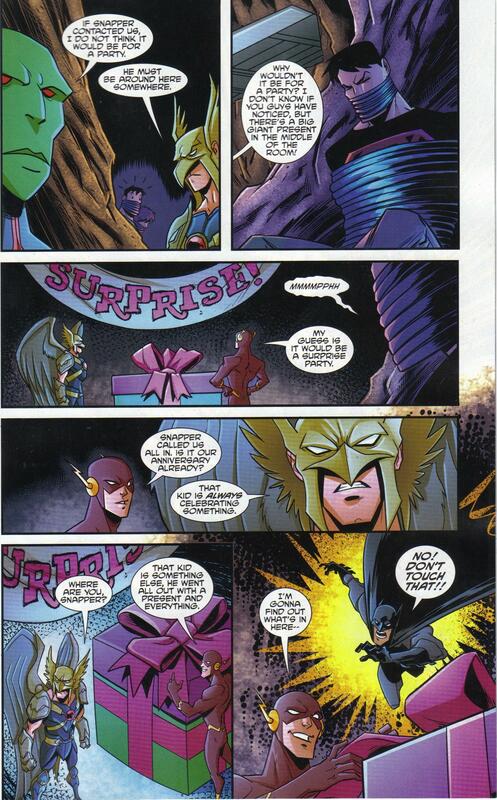 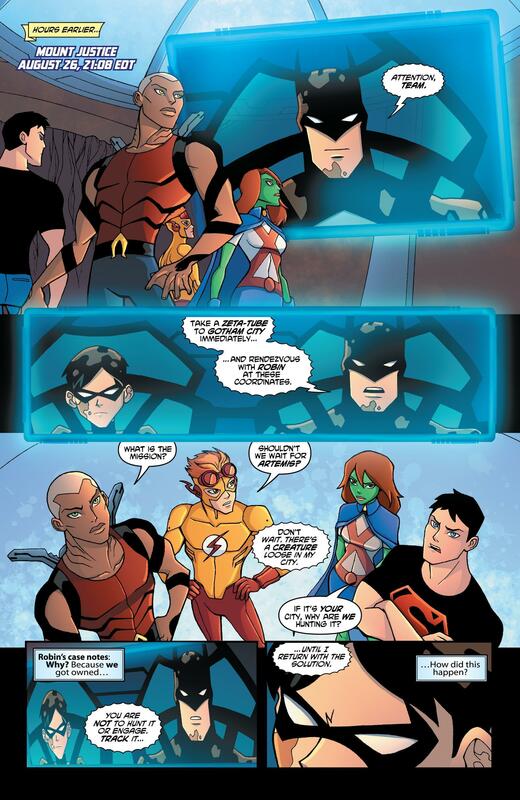 · Guest starring Batman, The Flash and Green Arrow! 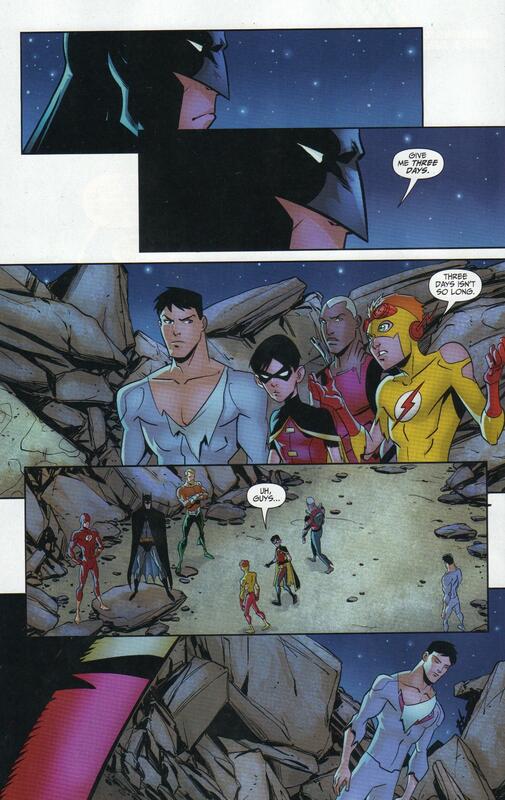 · First part of a new storyline. 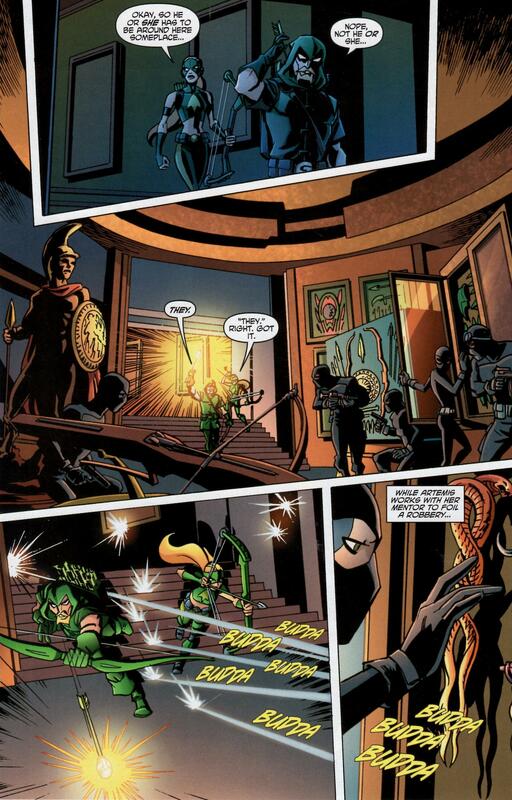 · Kobra is back - and he's scheming to become a god! 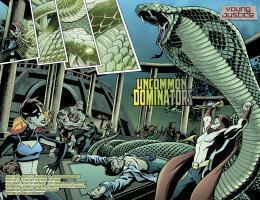 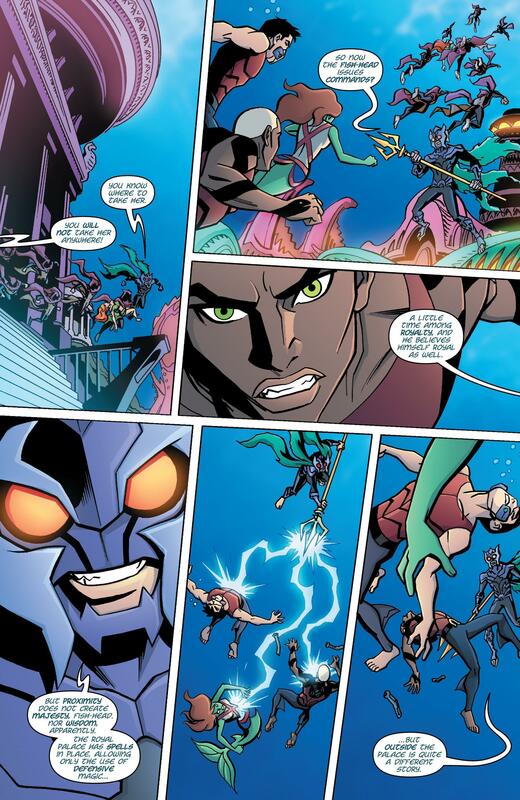 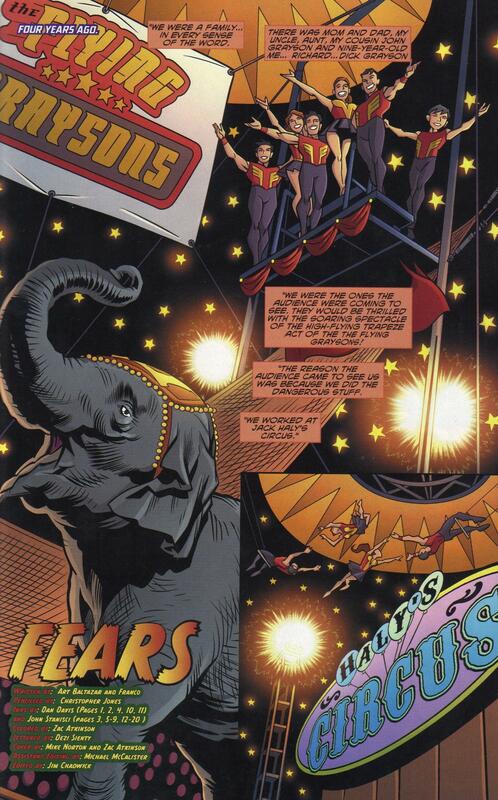 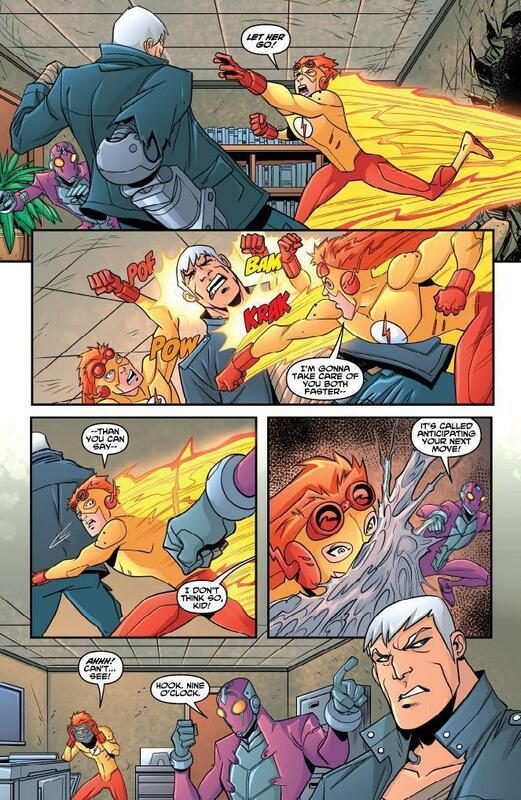 · Don't miss the action as Robin, Kid Flash and Artemis tackle Mammoth and Shimmer! 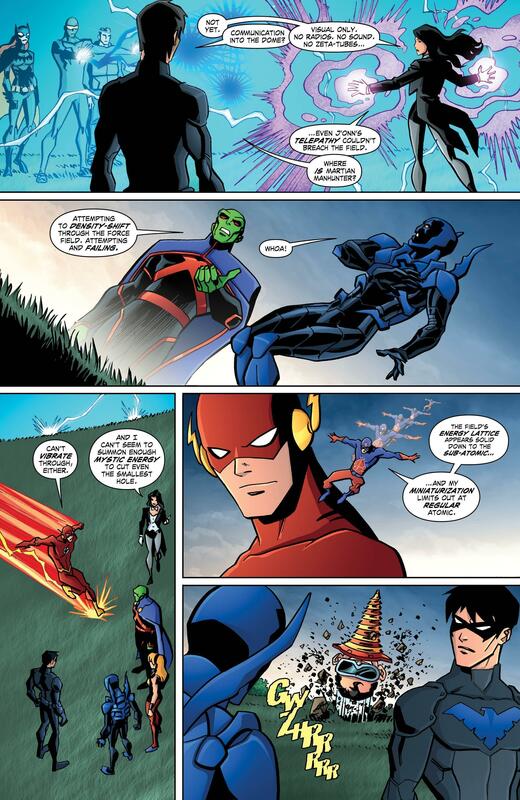 · Guest-starring Batman, The Flash and Green Arrow! 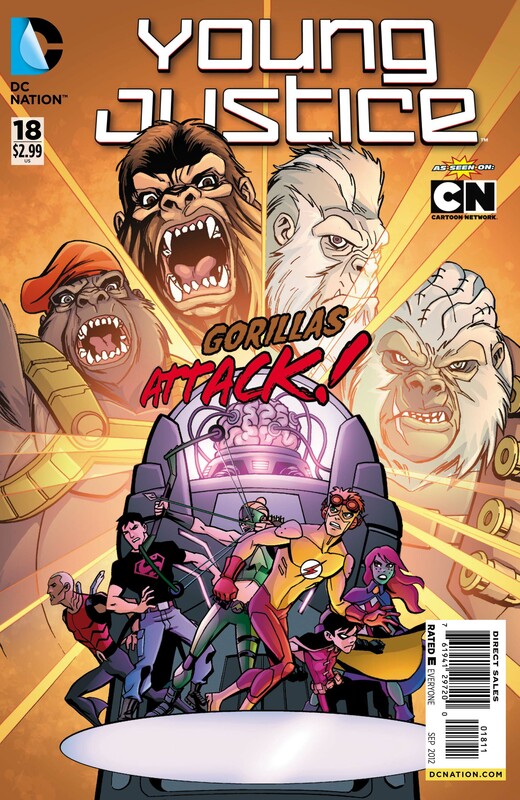 · The team travels to Gorilla City! 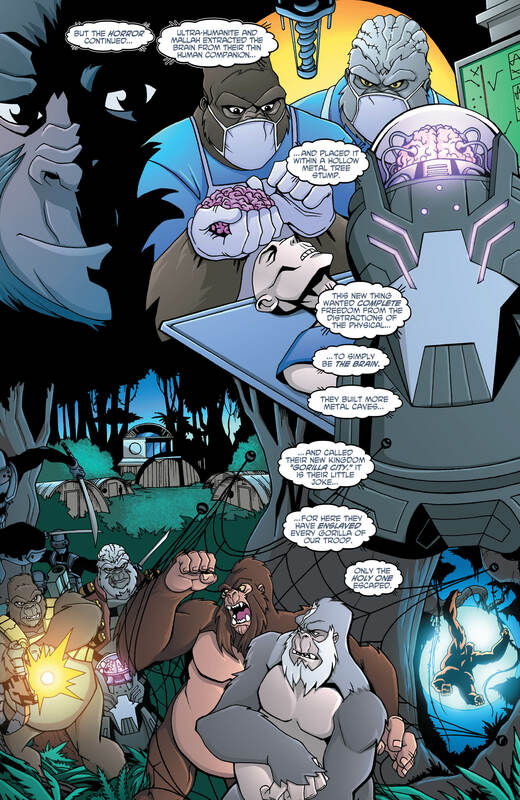 · Someone is enhancing apes to create an army of warrior slaves! 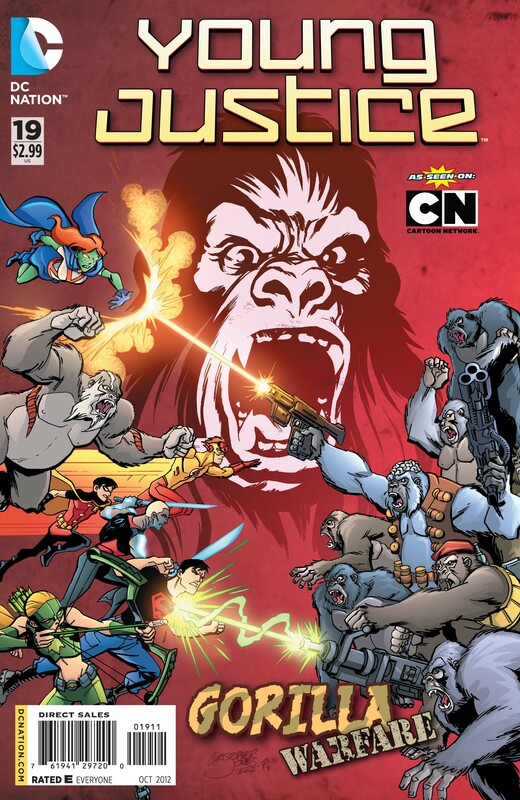 · Don't miss the origin of Gorilla City! 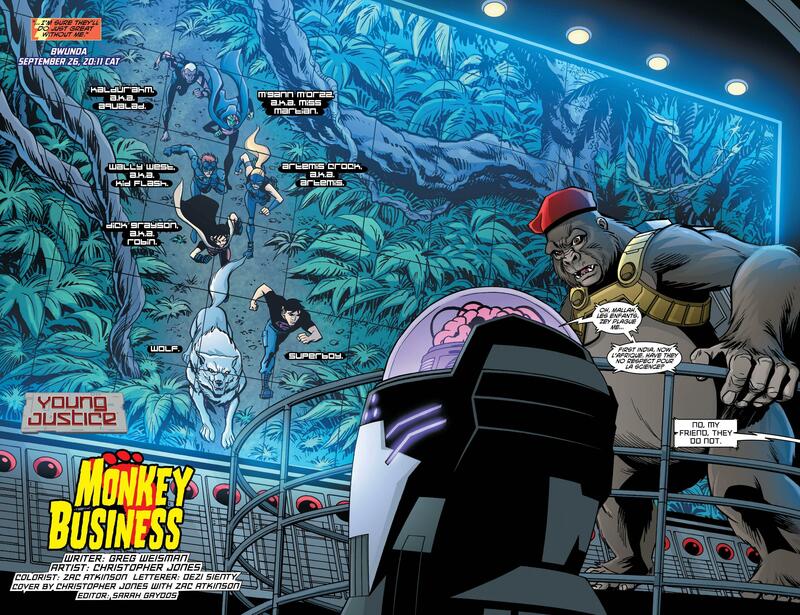 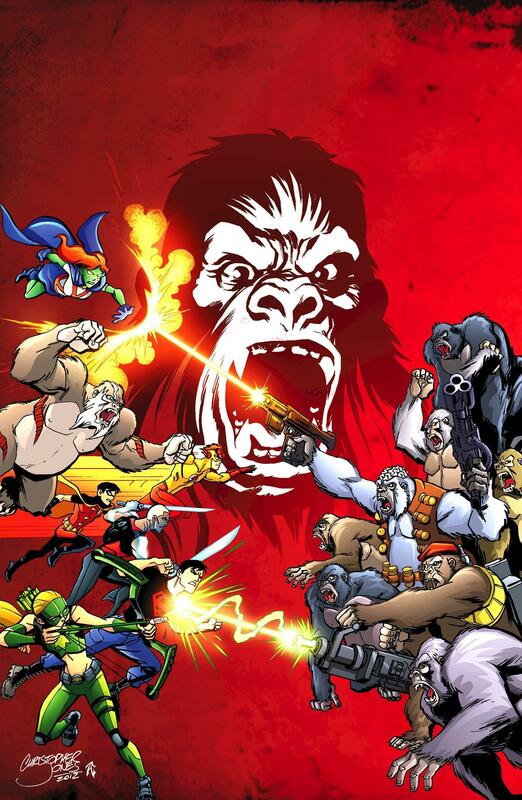 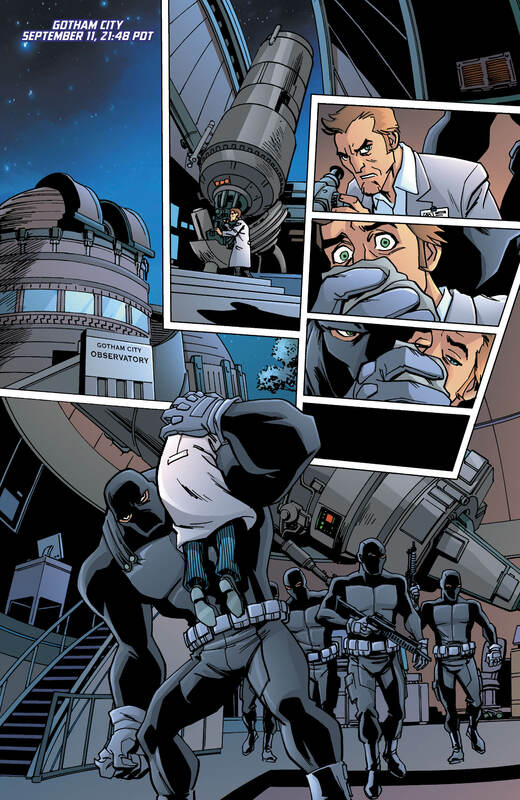 · The Brain, Monsieur Mallah and The Ultra-Humanite have captured the team. 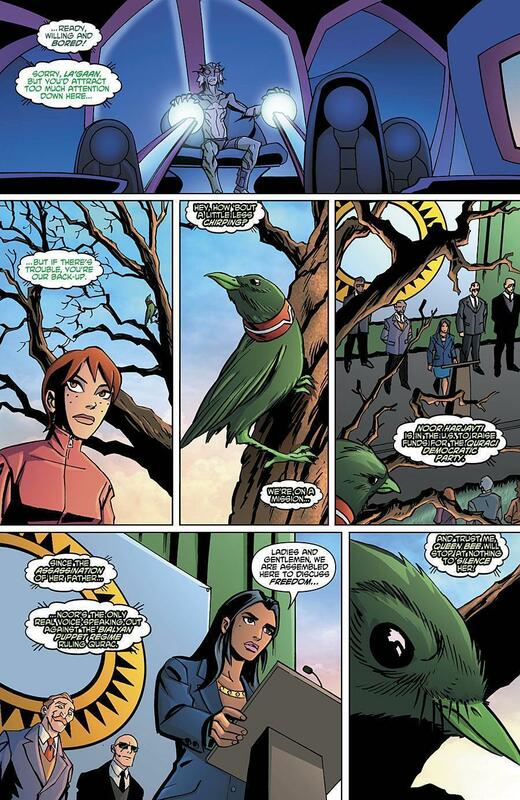 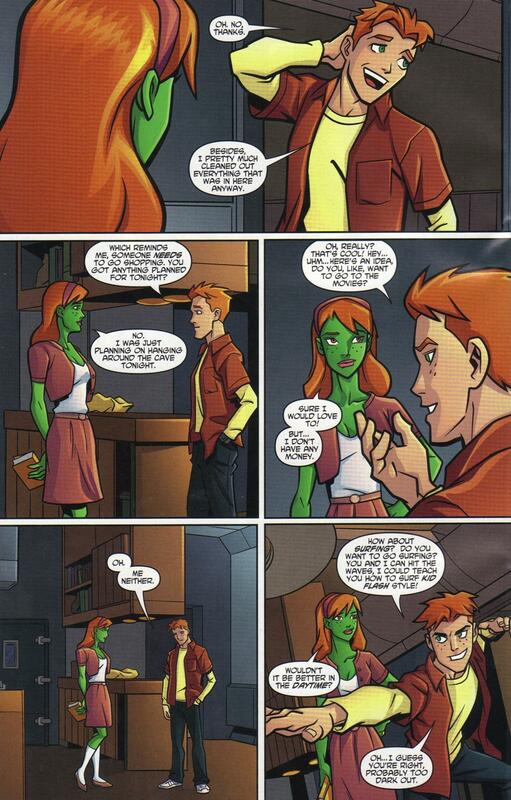 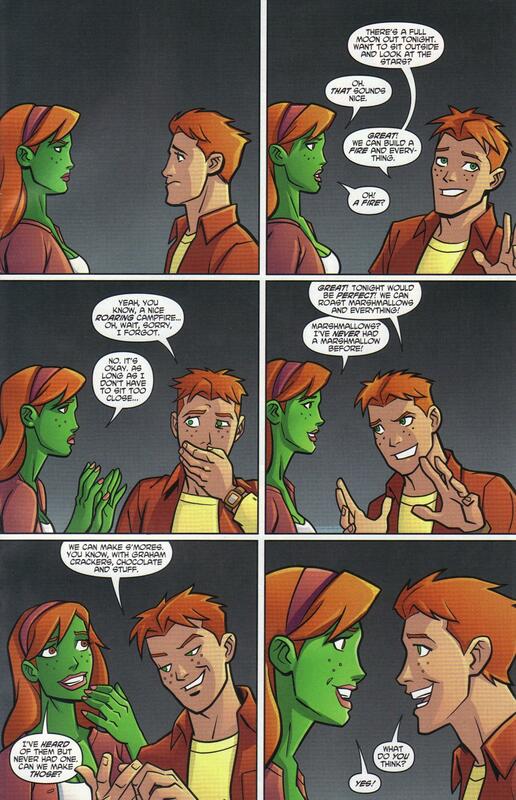 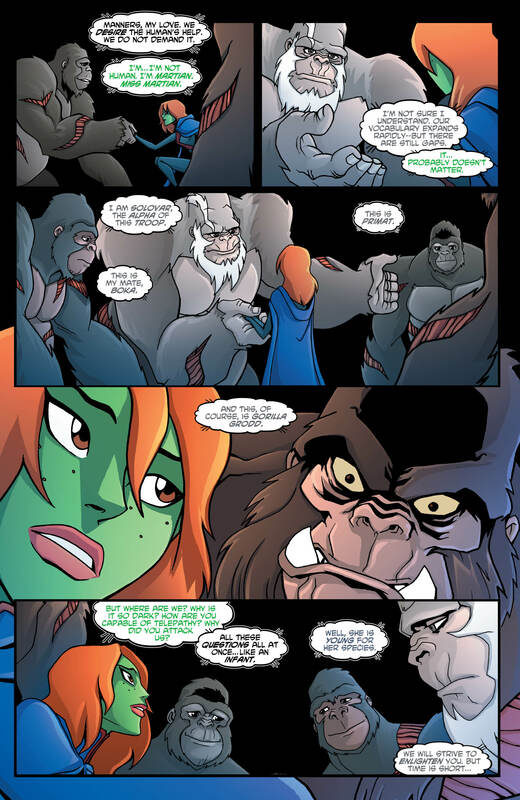 · What does Gorilla Grodd want with Miss Martian? 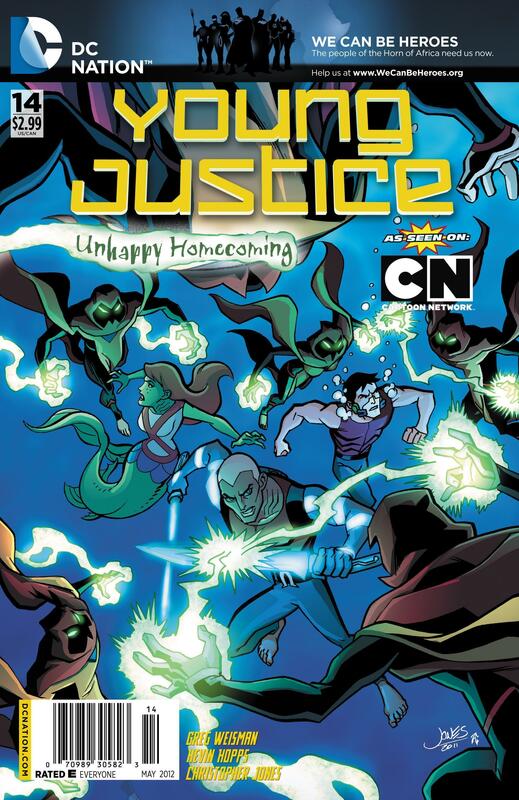 · Following the animated series, it's now five years later! 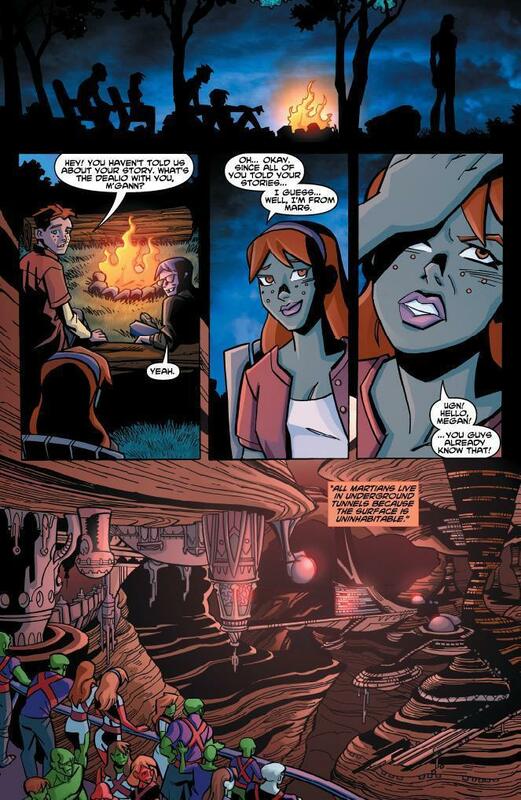 · Aliens have infiltrated the Earth! 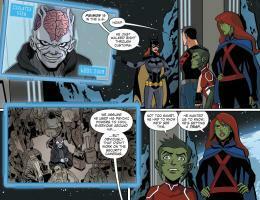 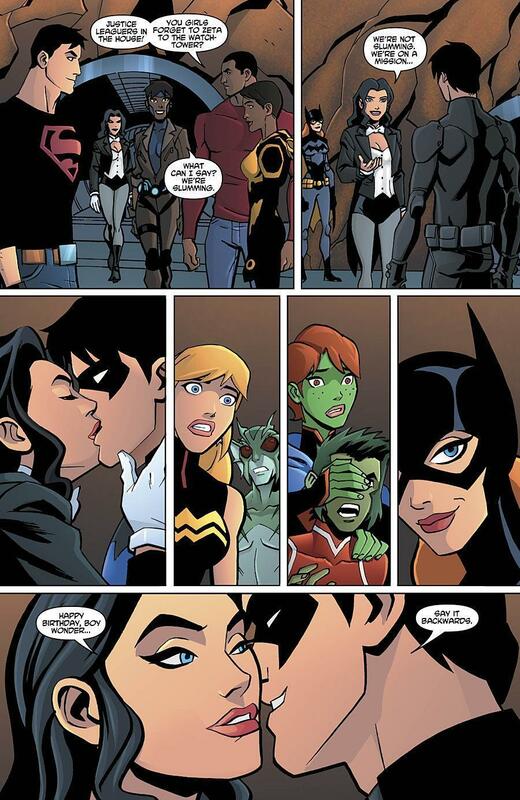 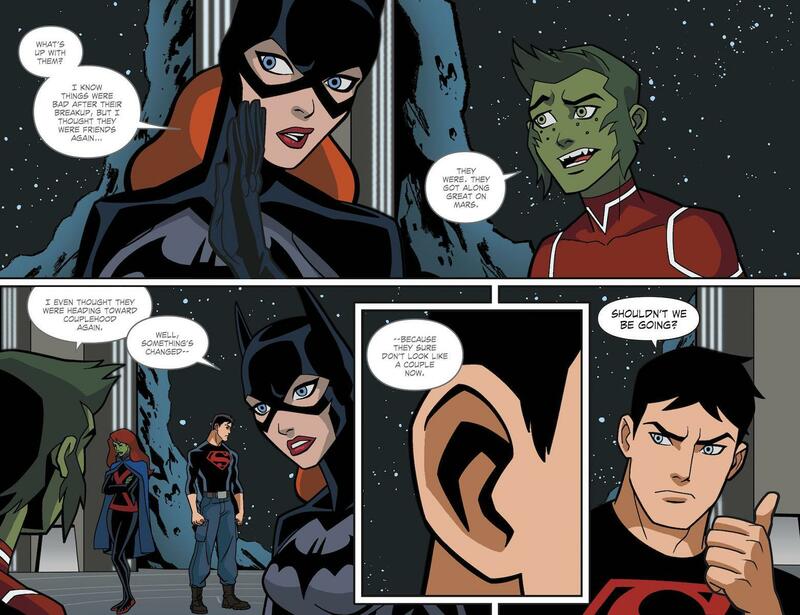 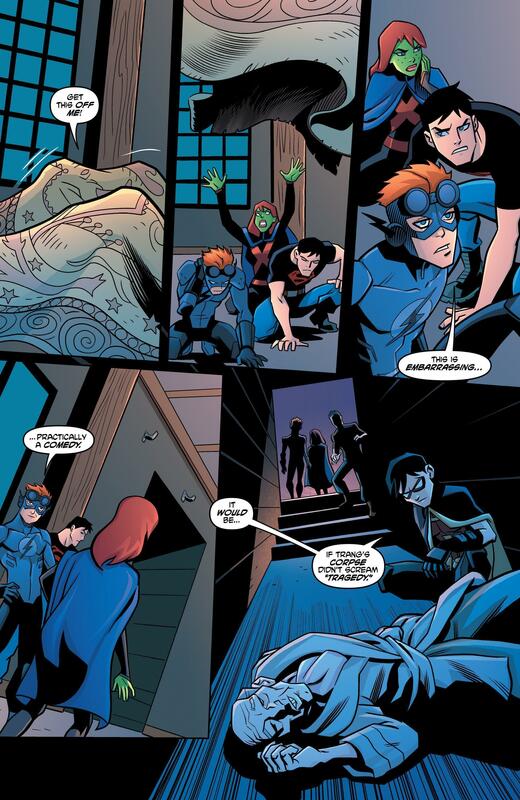 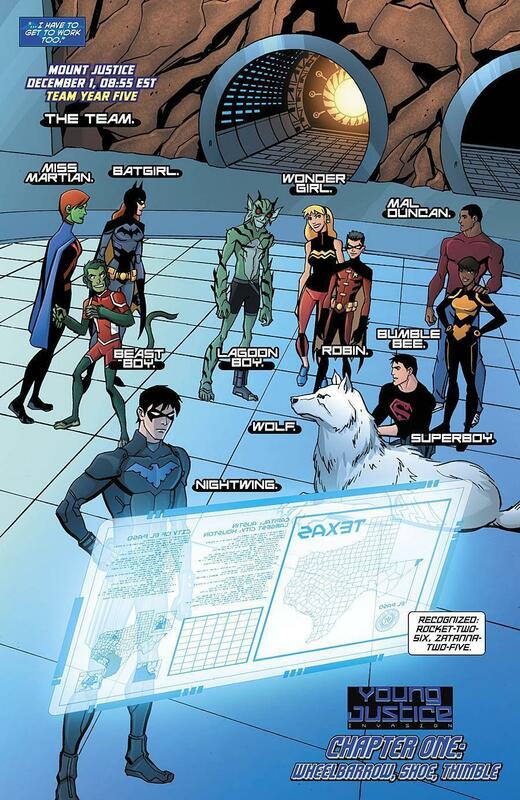 · Nightwing's new team includes Batgirl, Blue Beetle, Wonder Girl and Beast Boy! 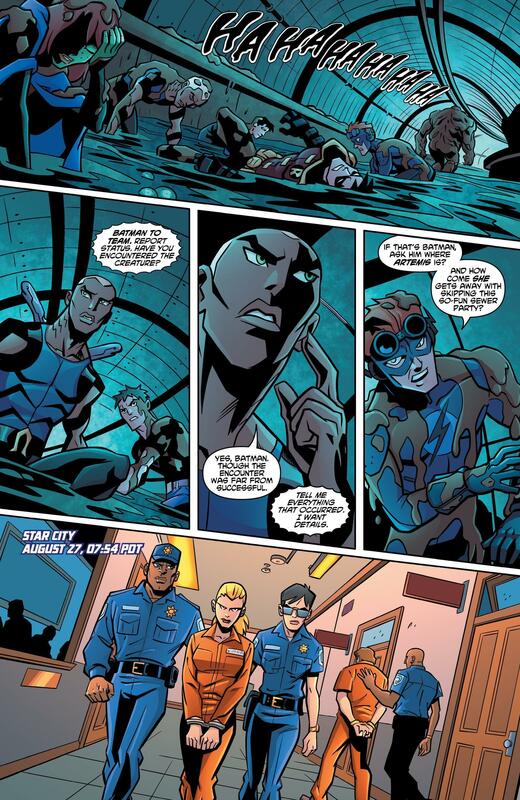 · Aliens have arrived on Earth-16! 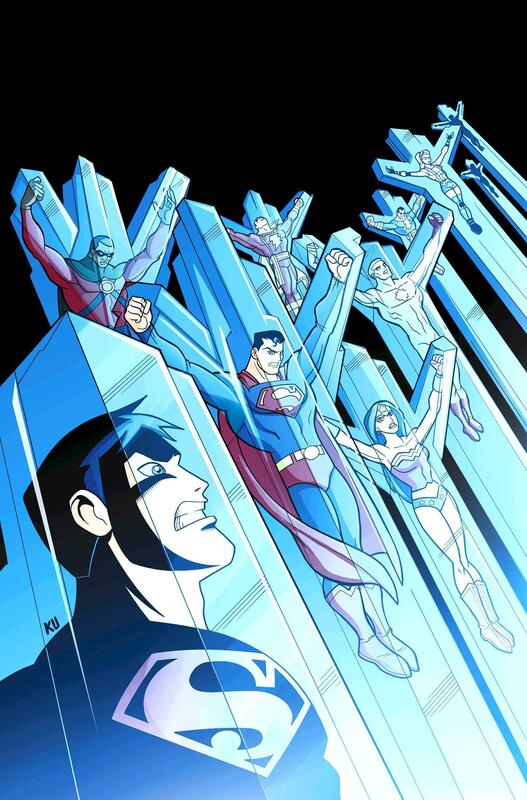 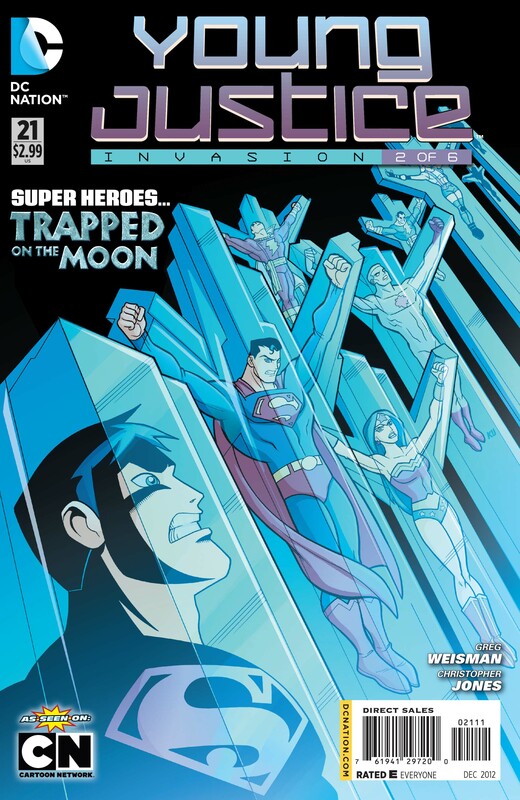 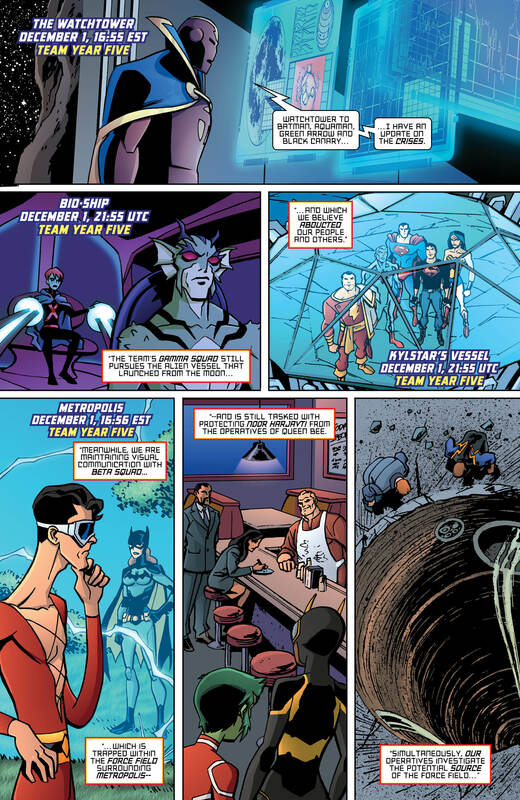 · Superboy and five Justice Leaguers have been abducted! 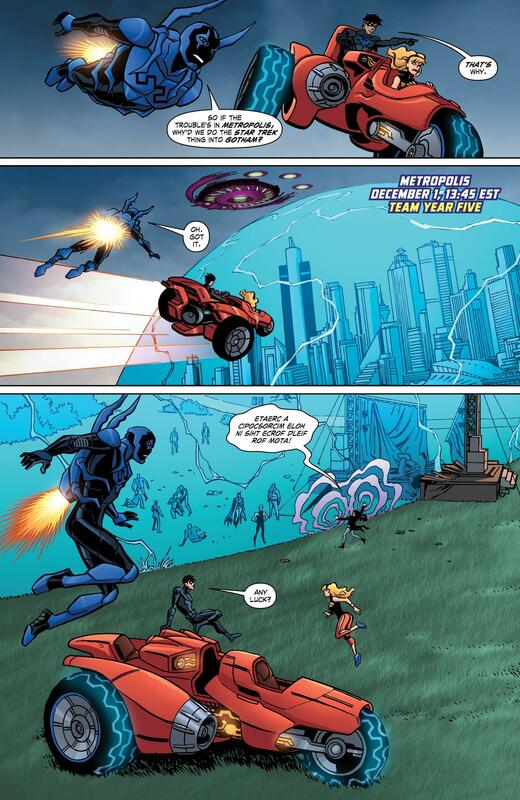 · Metropolis is in danger! 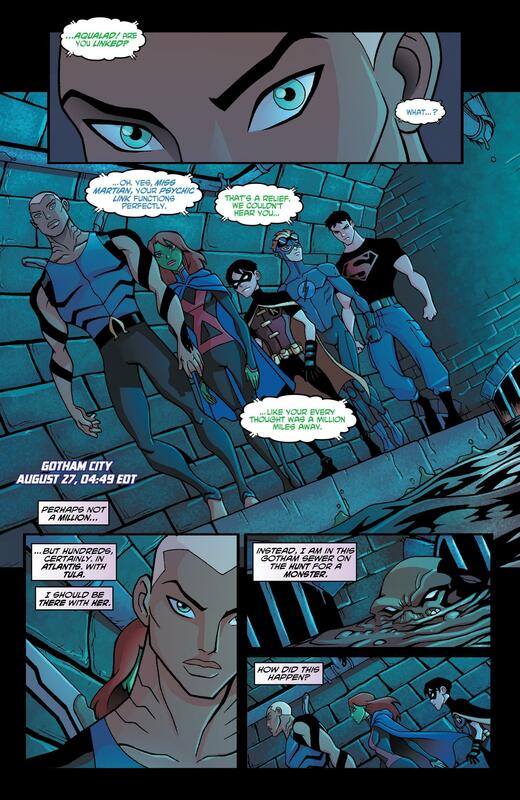 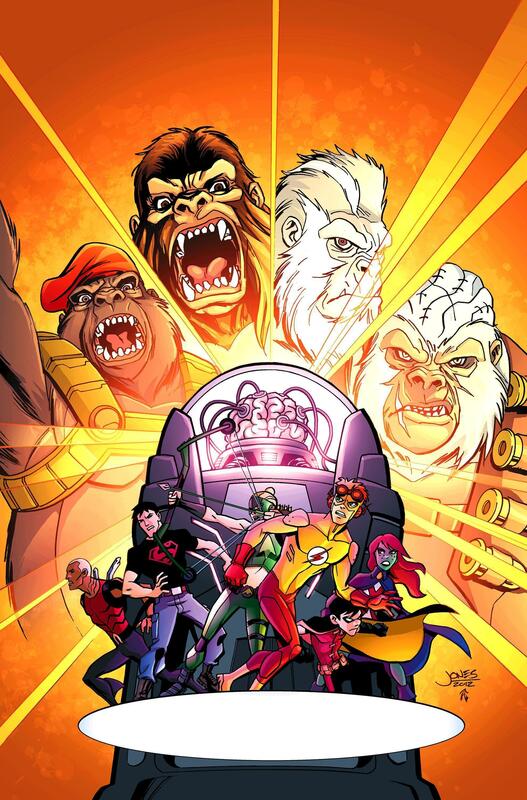 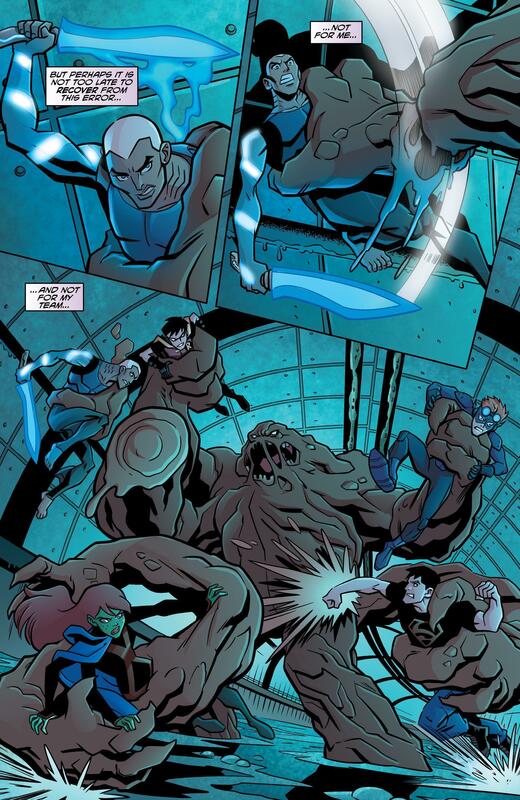 · Superboy, Robin, Kid Flash, Aqualad, Miss Martian and Artemis defend Gotham City from Ra's al Ghul and Clayface! 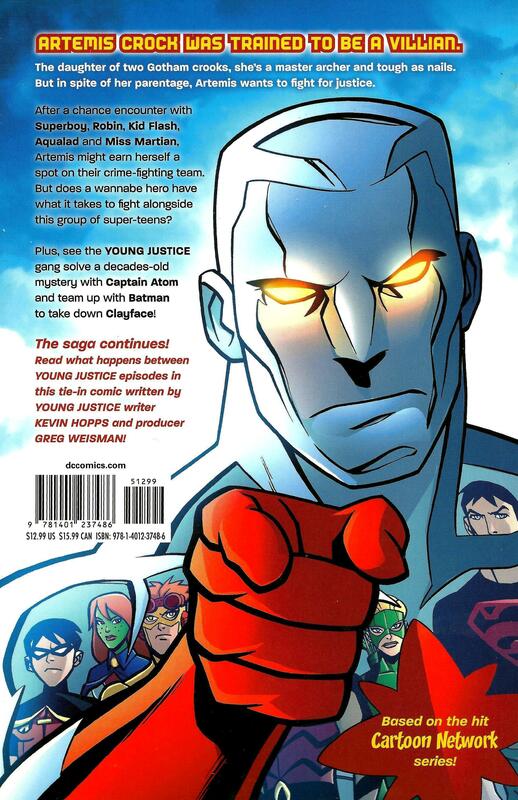 · Features issues #7-13 of the all ages series.! 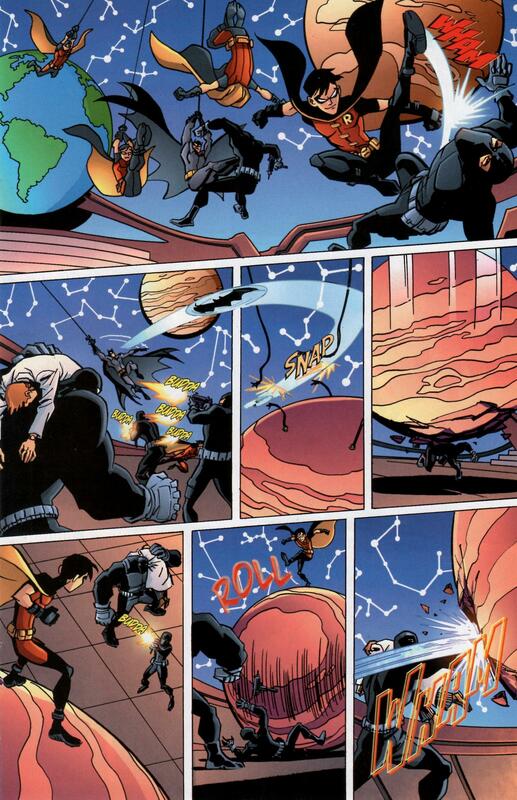 · Earth's greatest heroes are kidnapped by Kylstar! 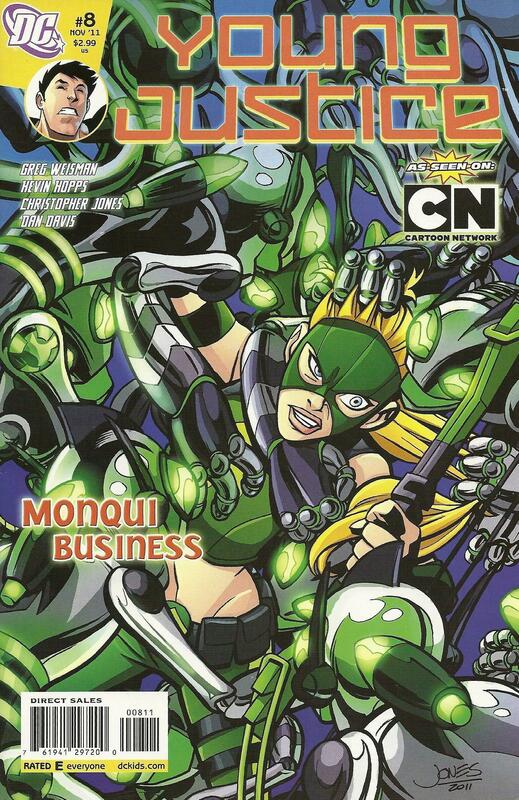 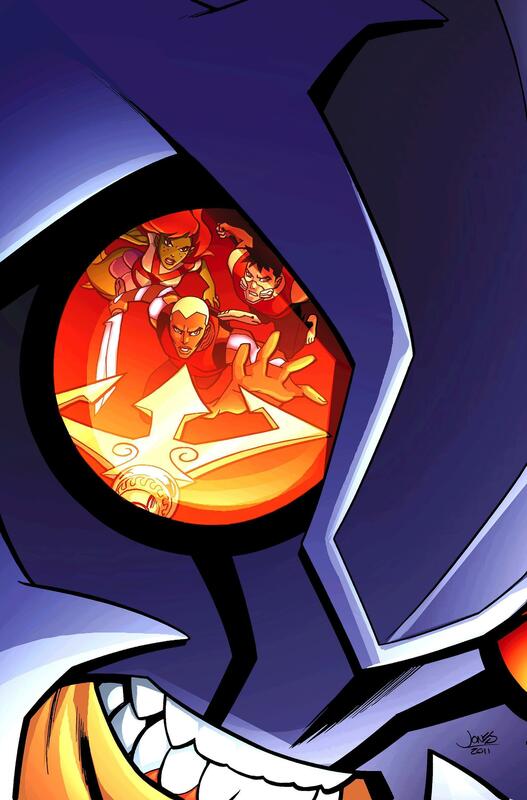 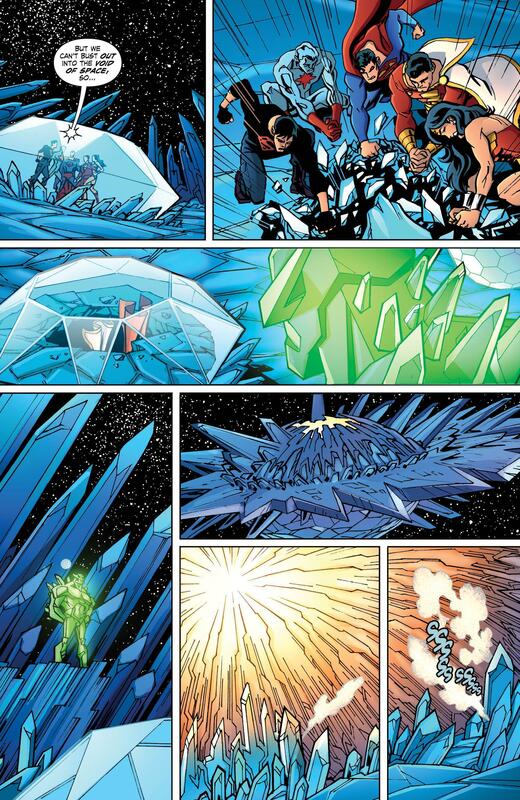 · Brainiac has Metropolis under glass and Lex Luthor's secret weapon is on the loose! 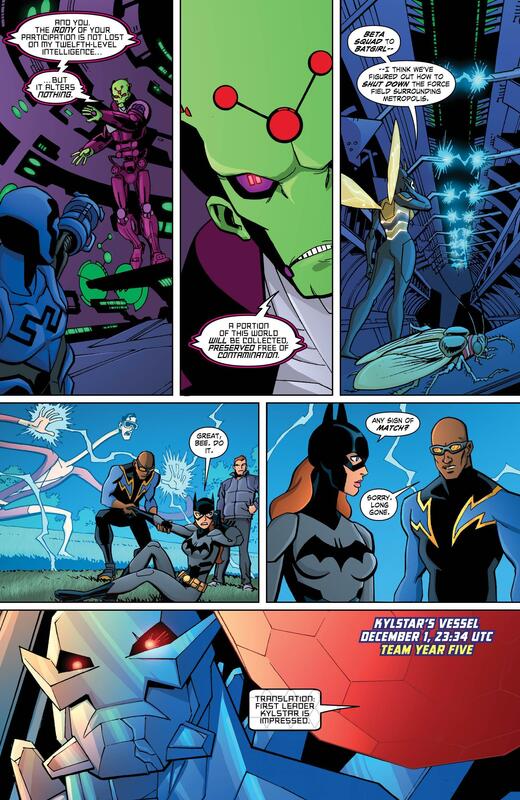 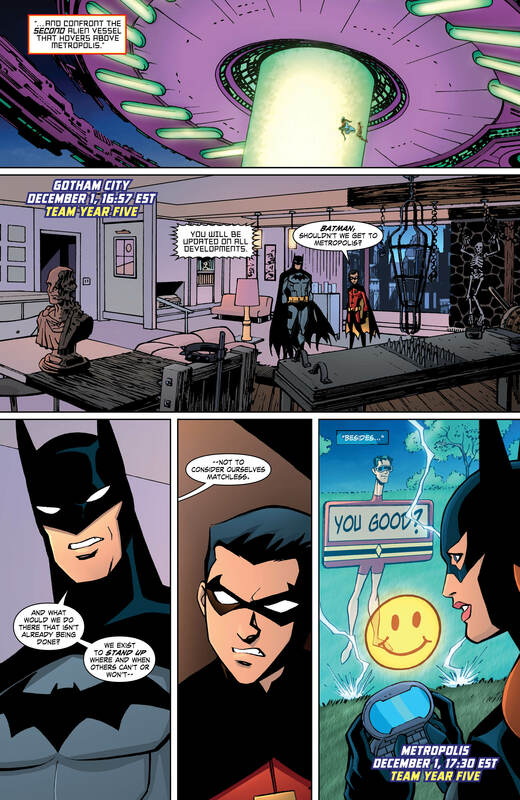 · Batgirl takes on Match-alone! 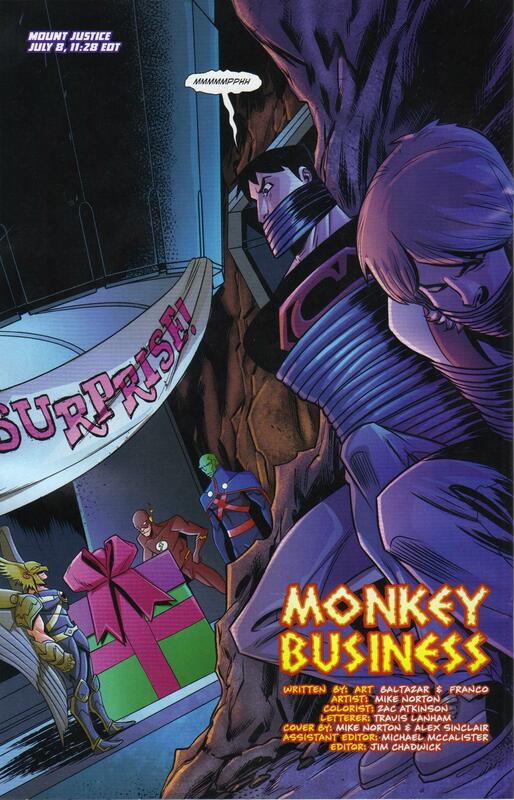 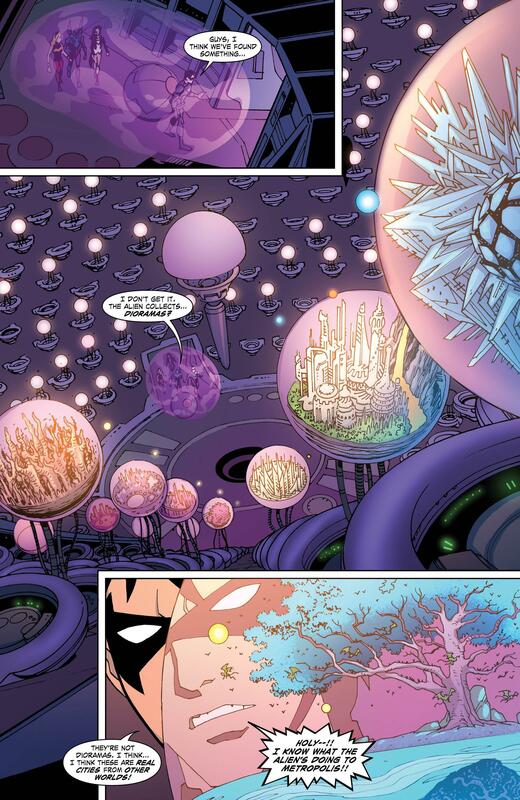 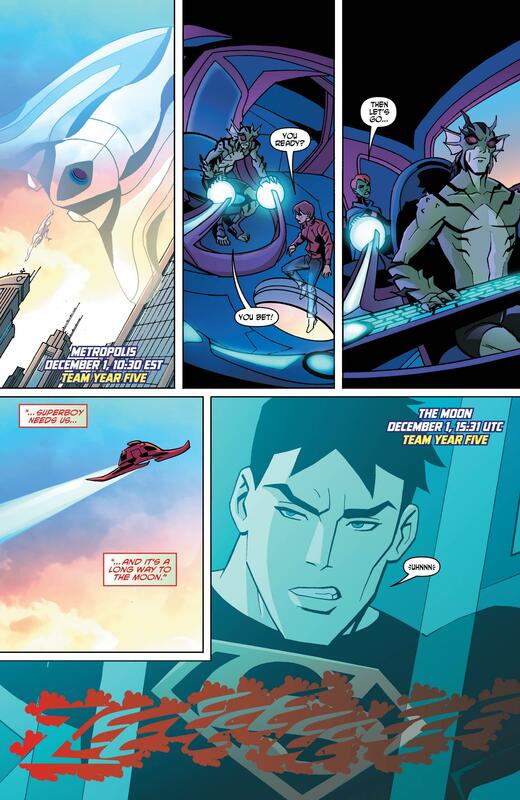 · Alpha Squad infiltrates Brainiac's ship as it hovers above Metropolis! 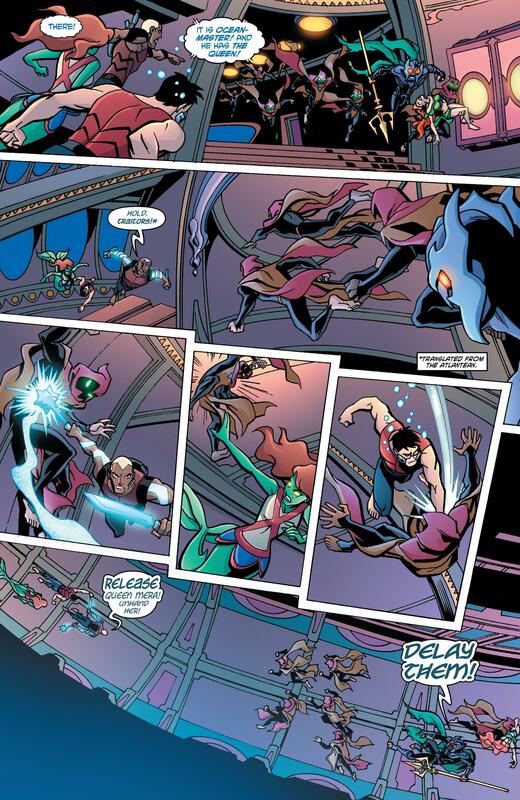 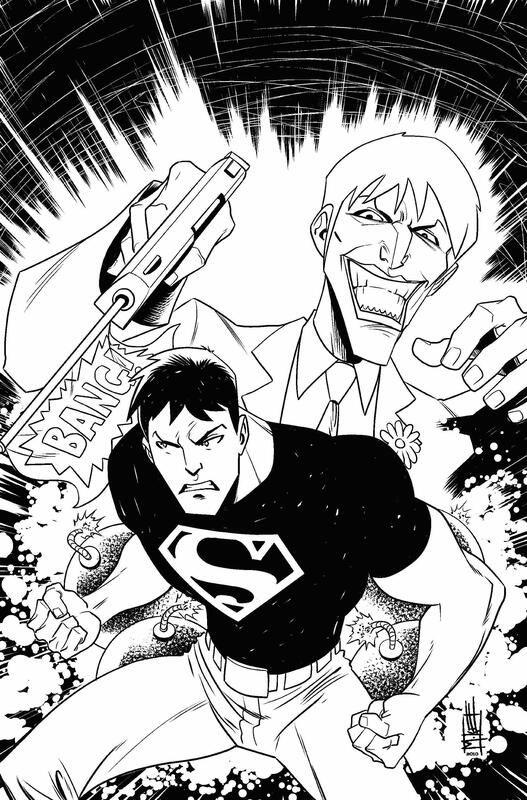 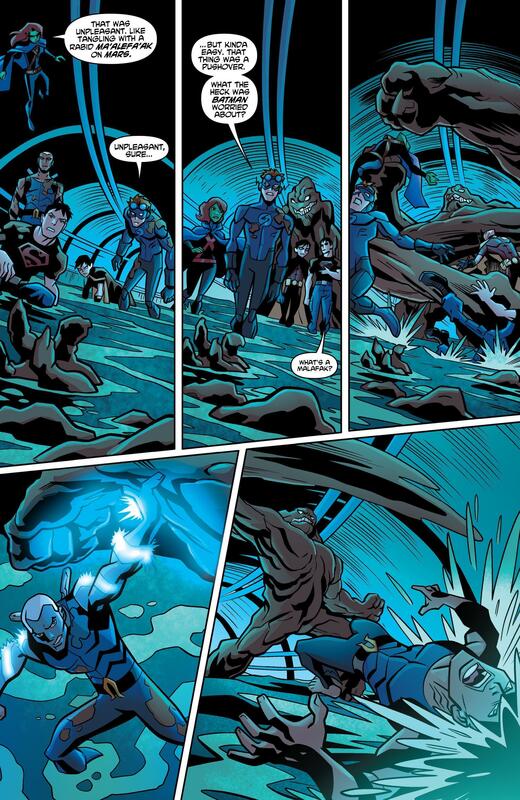 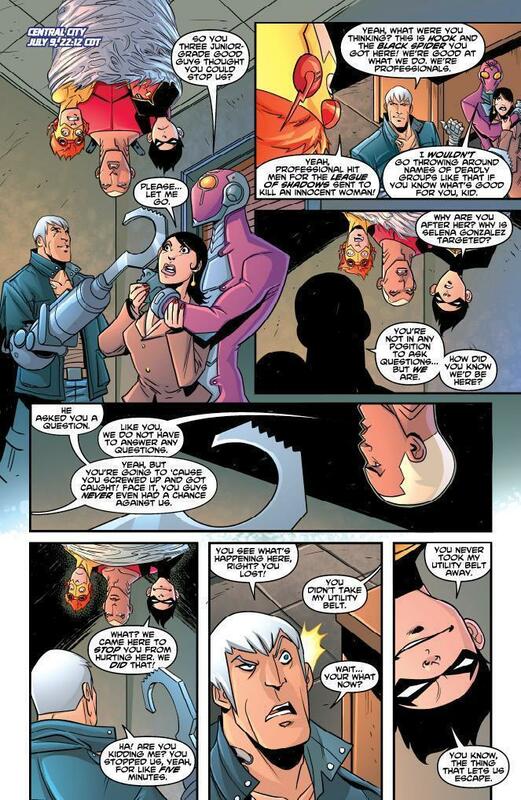 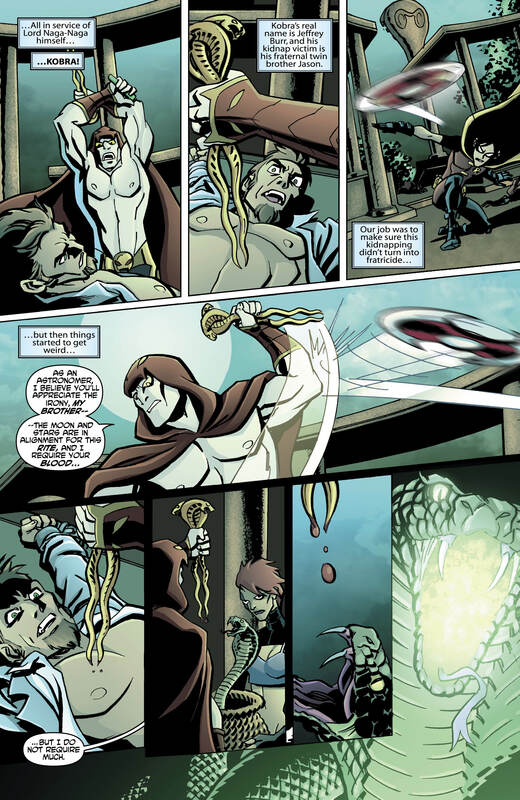 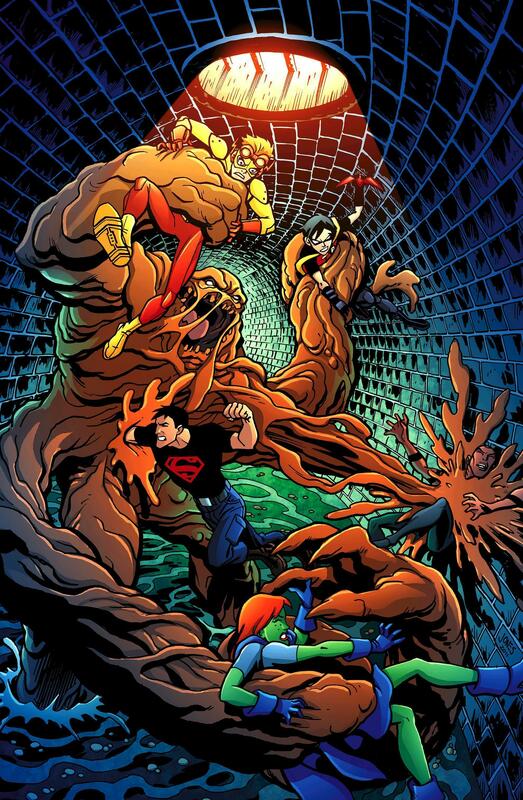 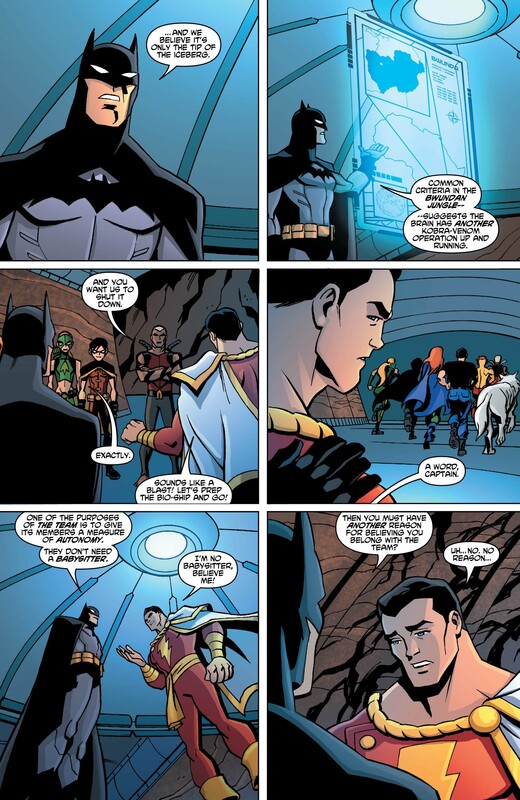 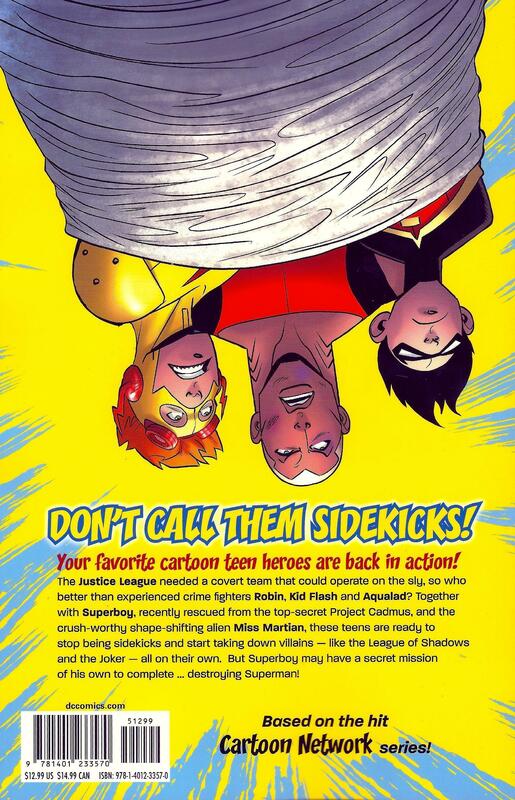 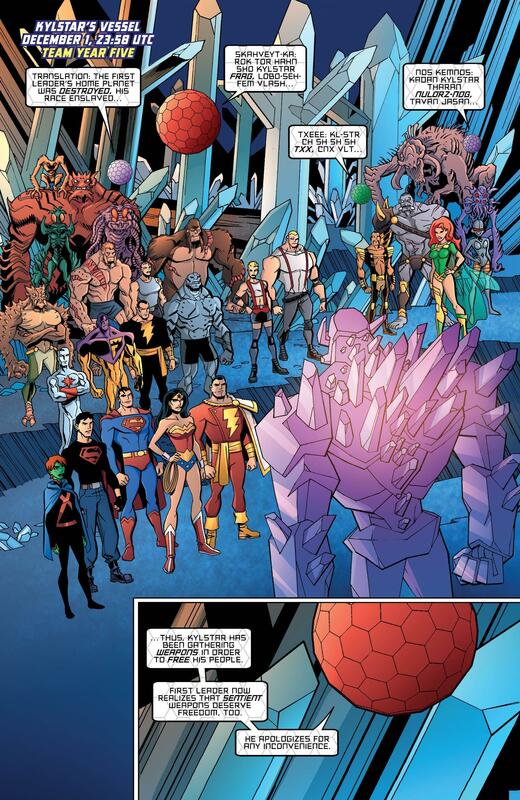 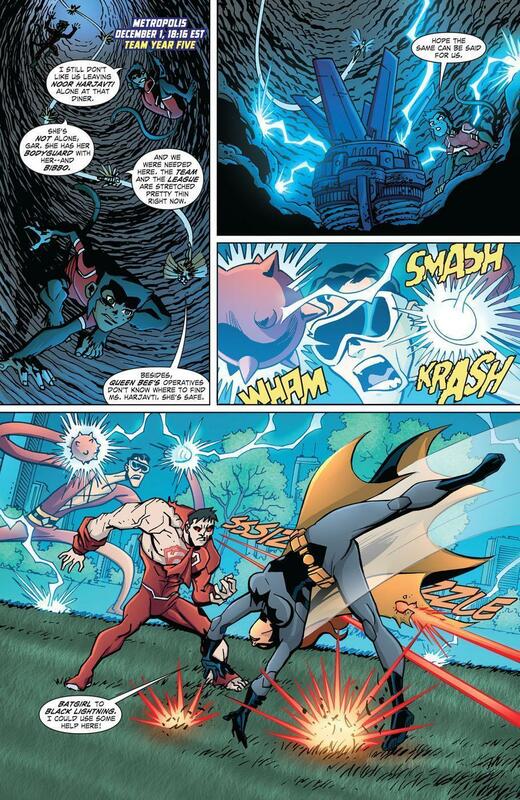 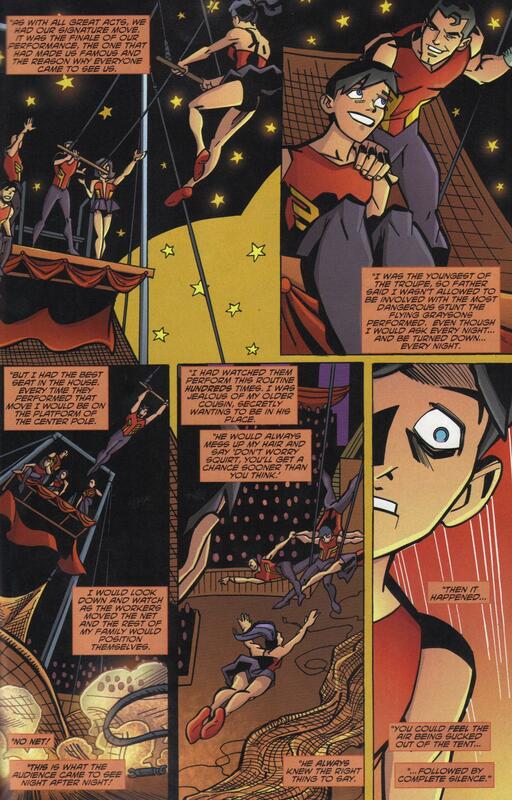 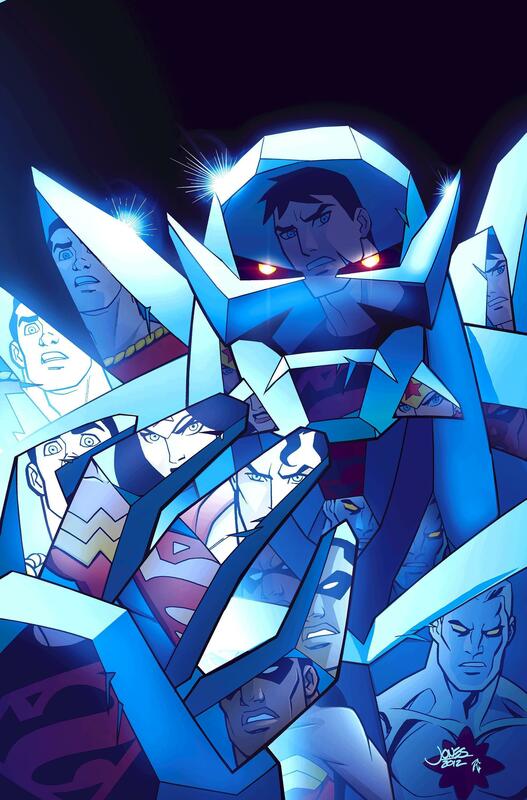 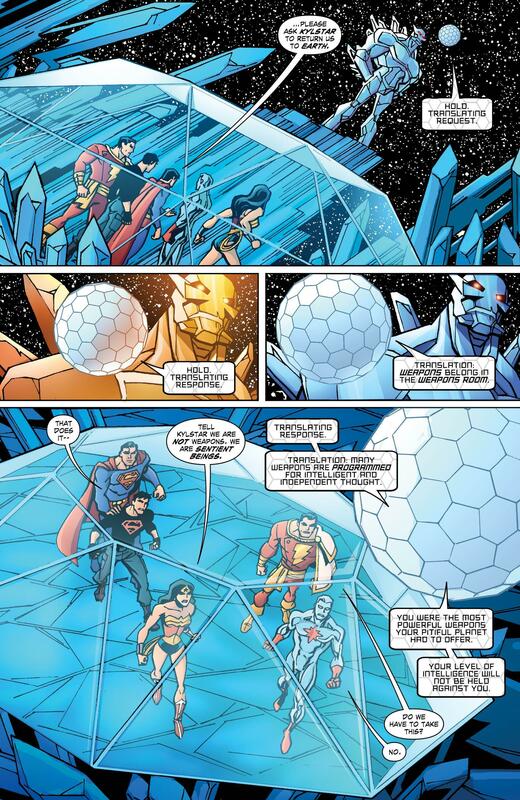 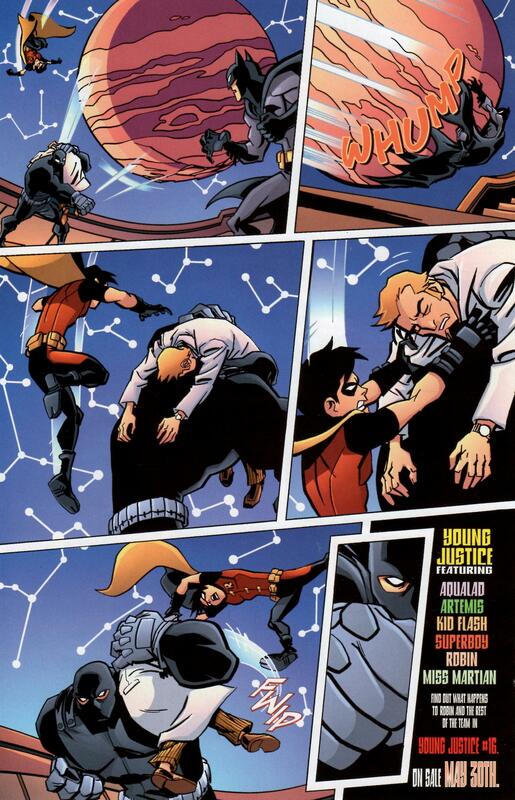 · Superboy and the Justice League battle their captor, Kylstar! 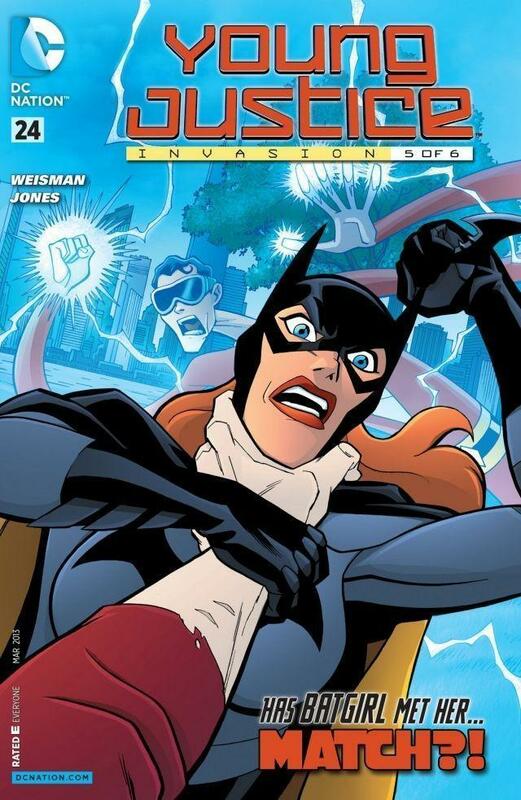 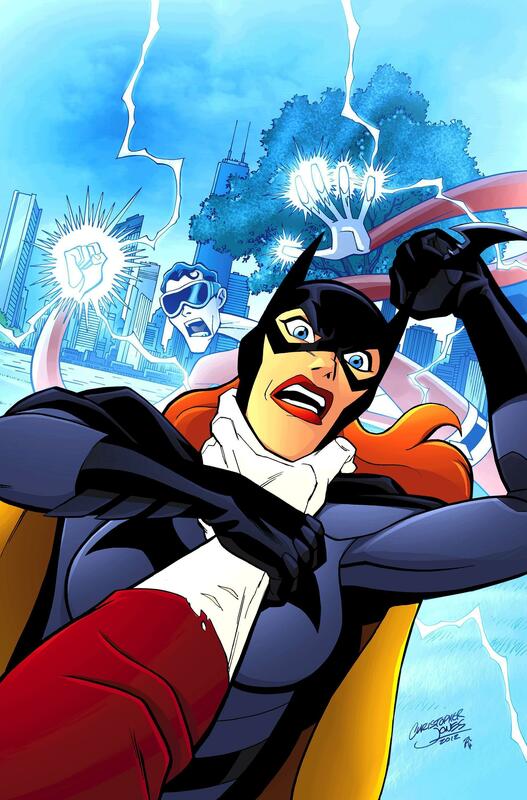 · Batgirl fights alone against Match! 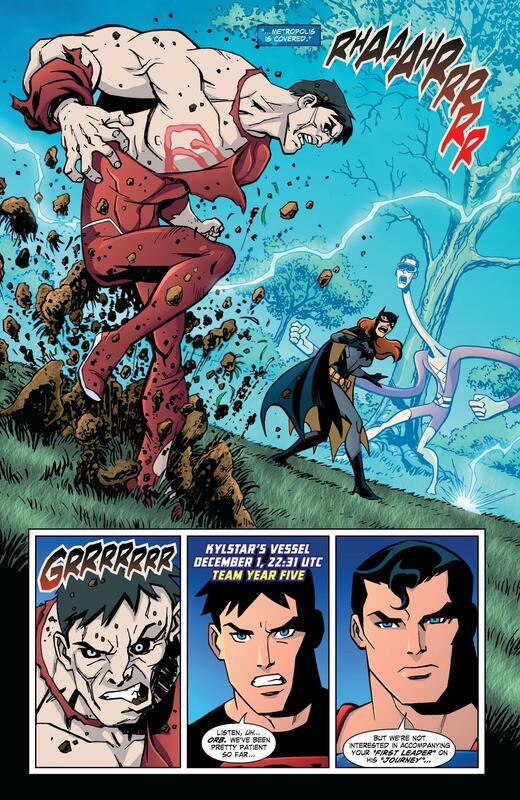 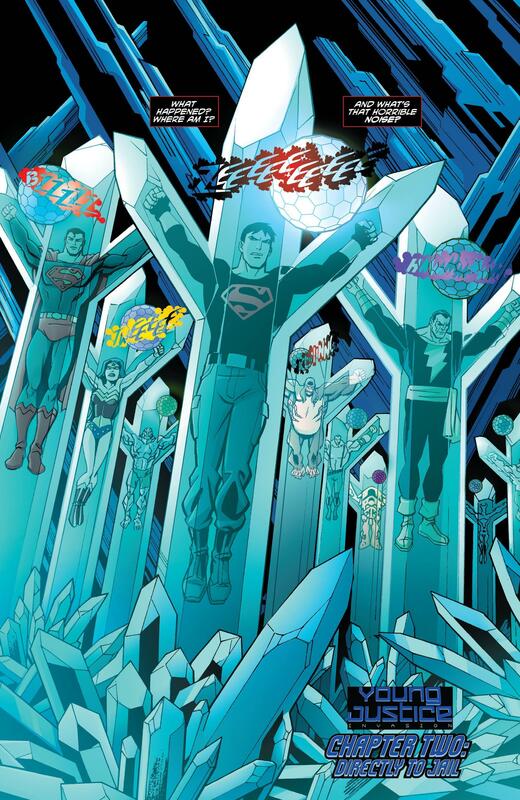 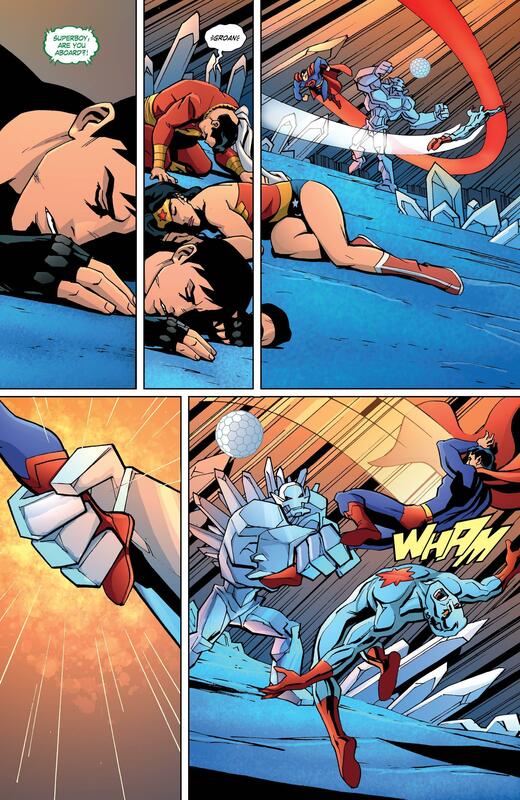 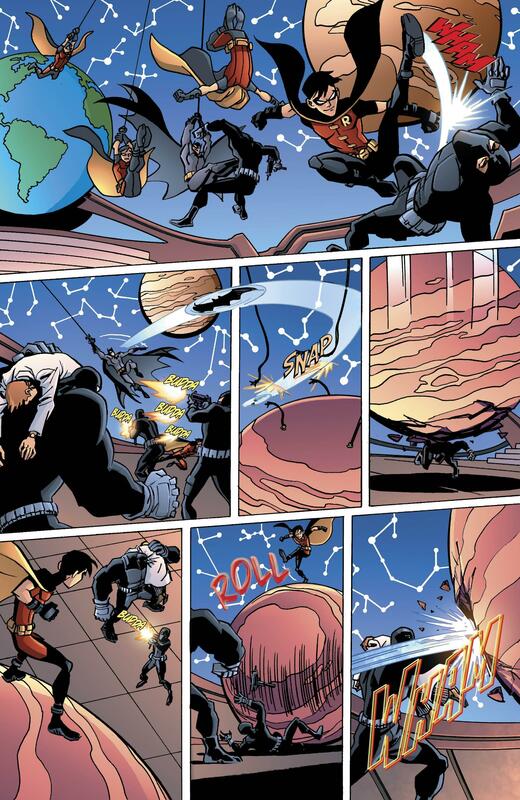 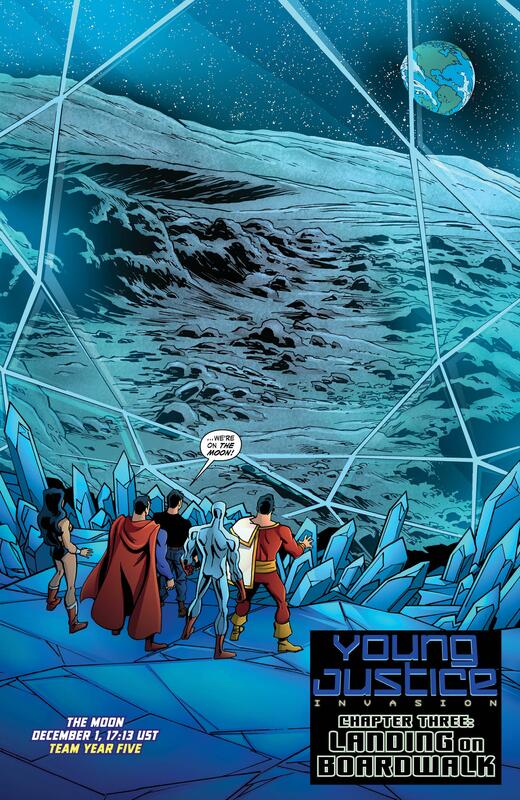 · Kylstar decimates Superboy and the Justice League! 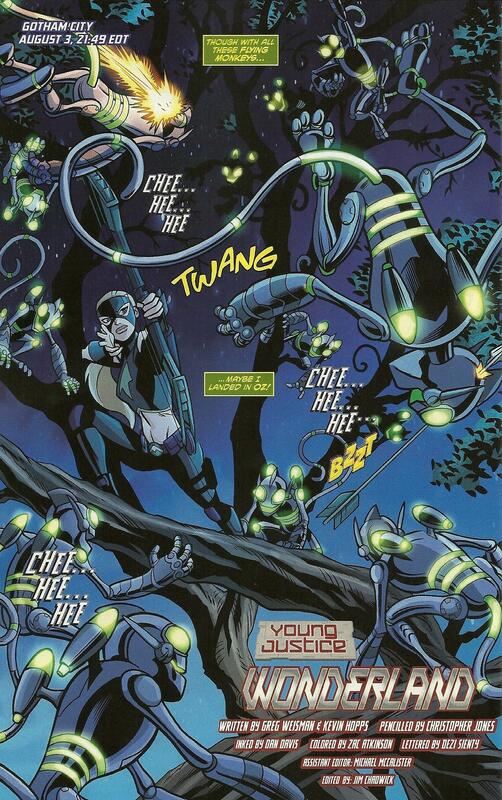 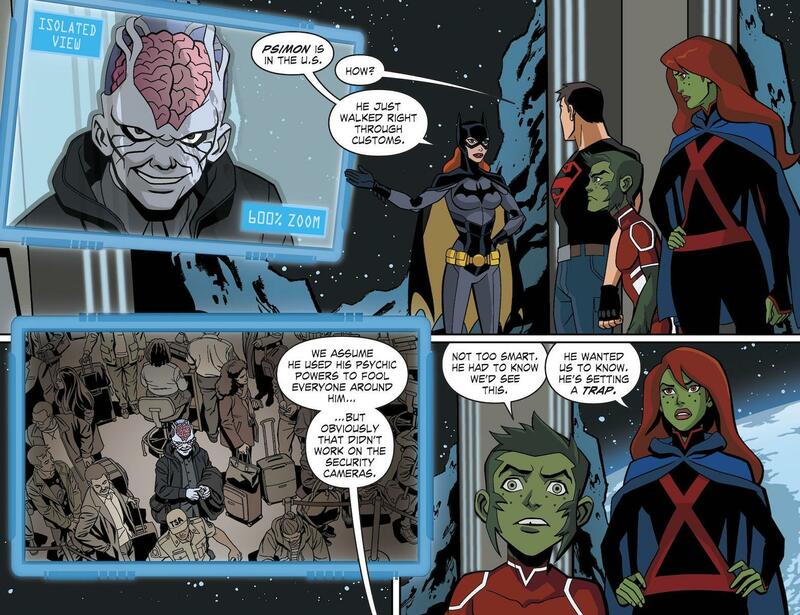 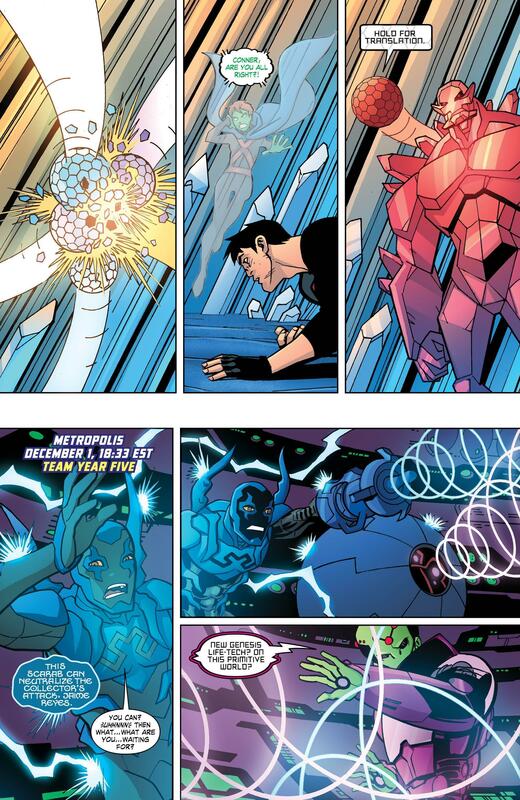 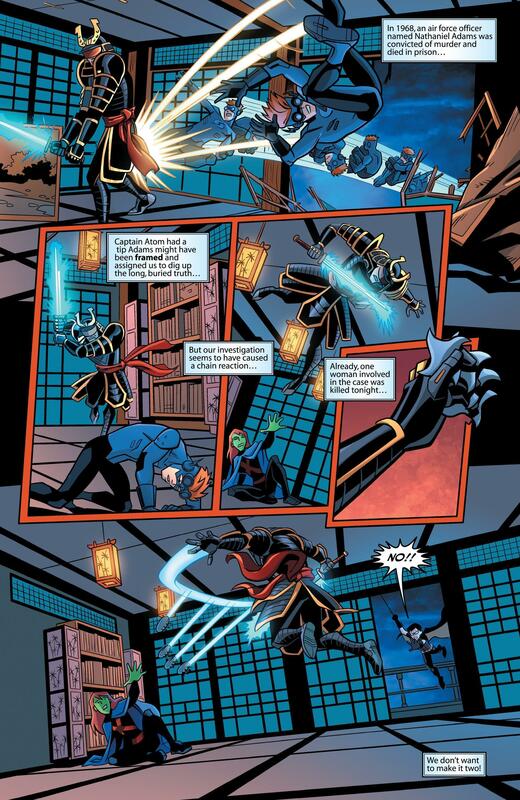 · Nightwing's team fails against Brainiac! 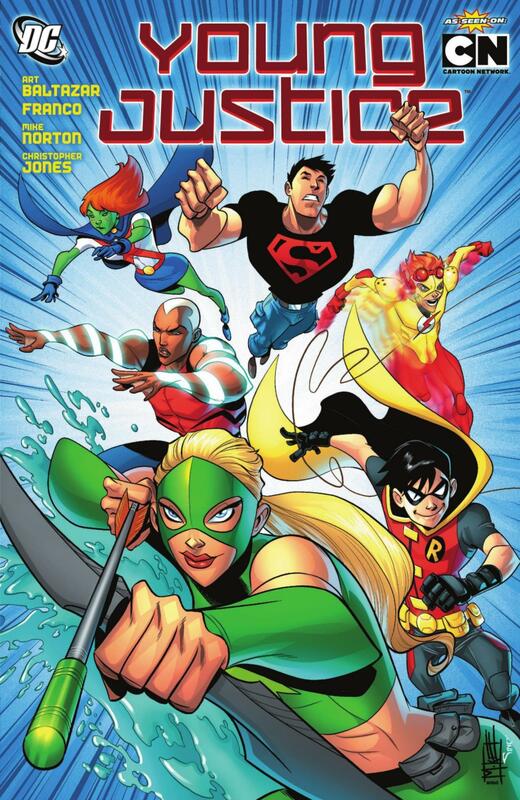 · In this new collection, Superboy, Robin, Kid Flash, Aqualad, Miss Martian and Artemis make their way to Atlantis to foil Ocean-Master's plan to purify the underwater city. 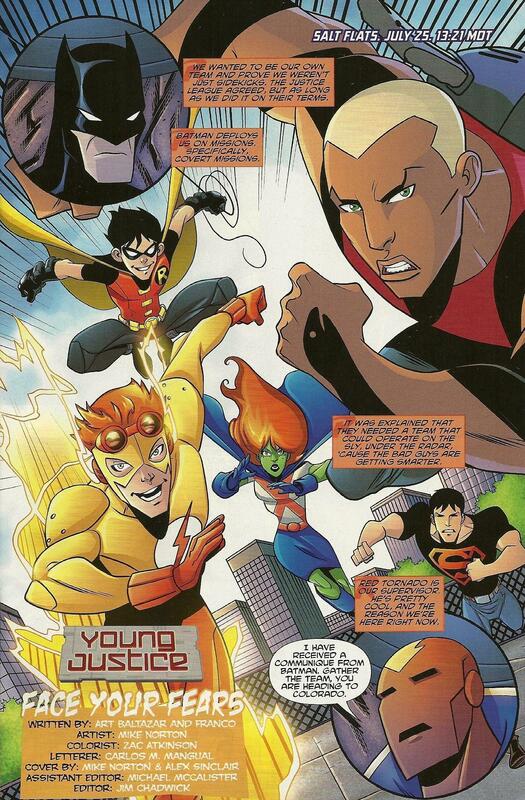 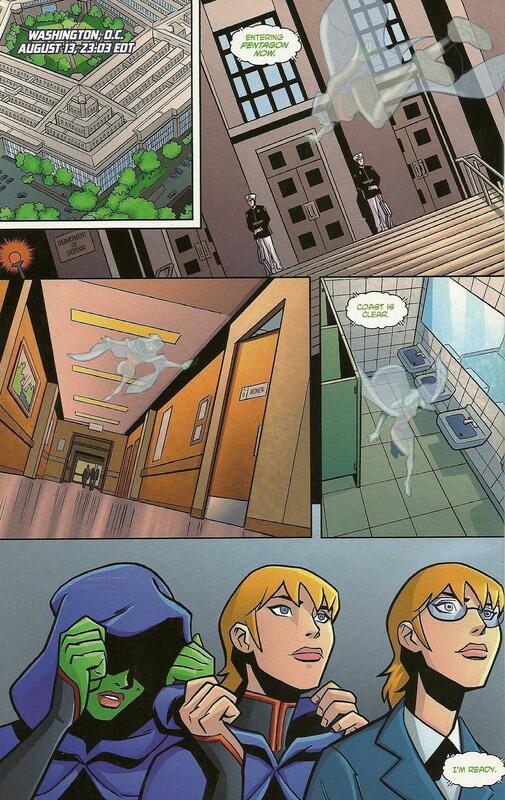 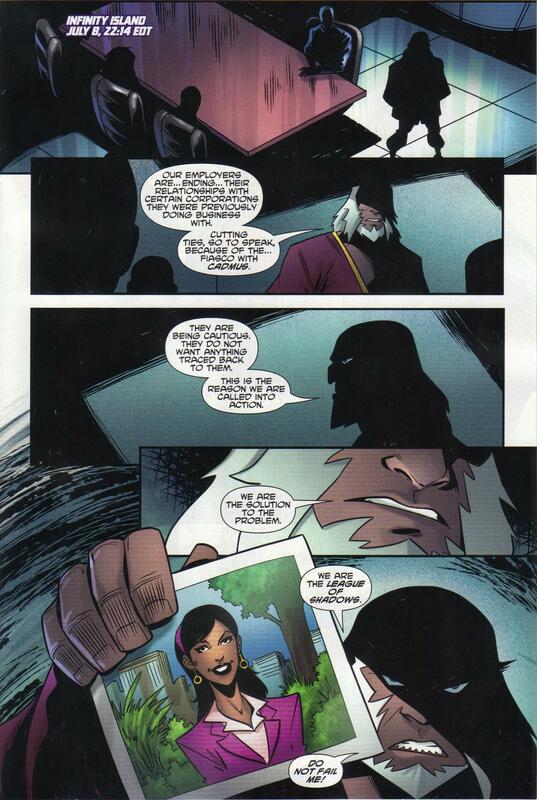 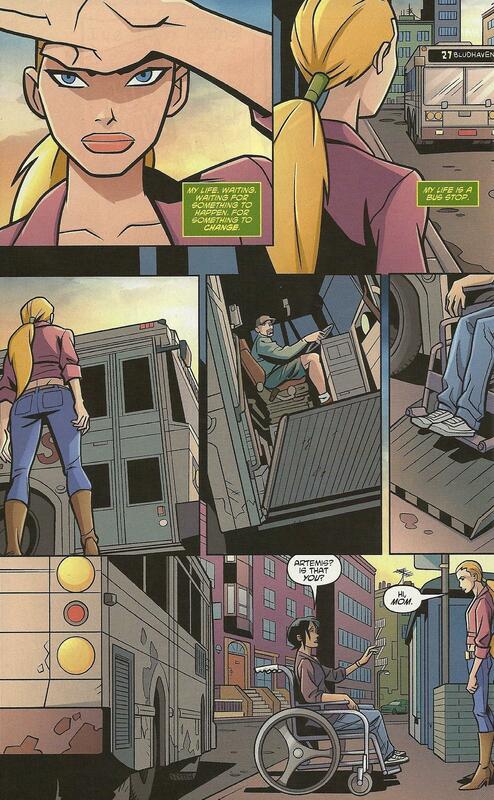 · Collects Young Justice #14-19! 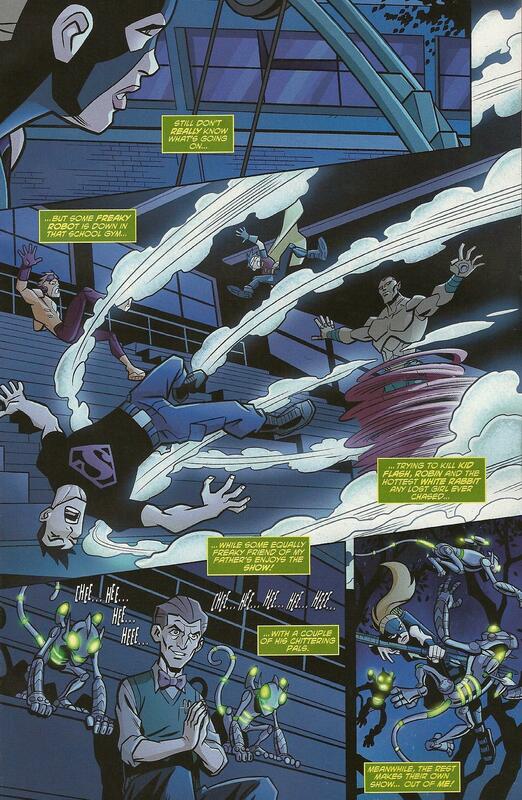 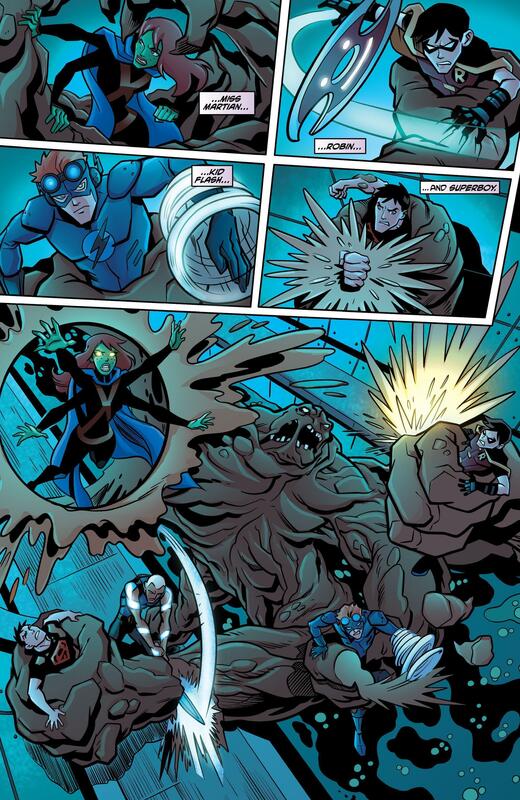 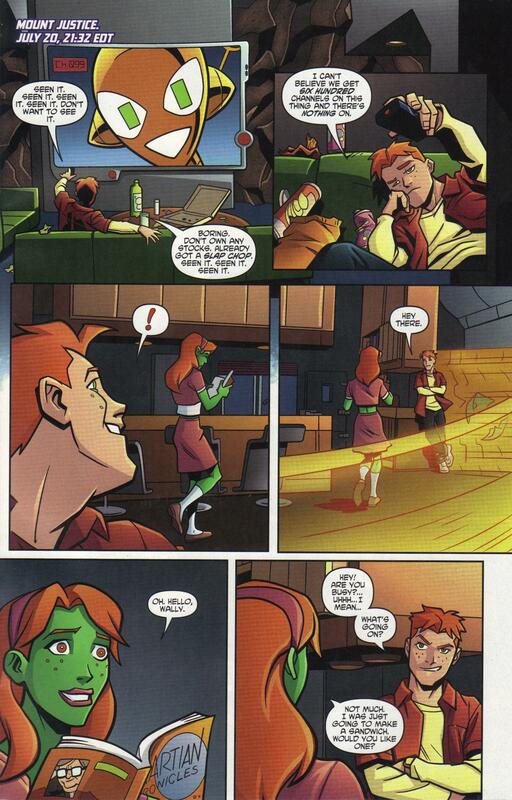 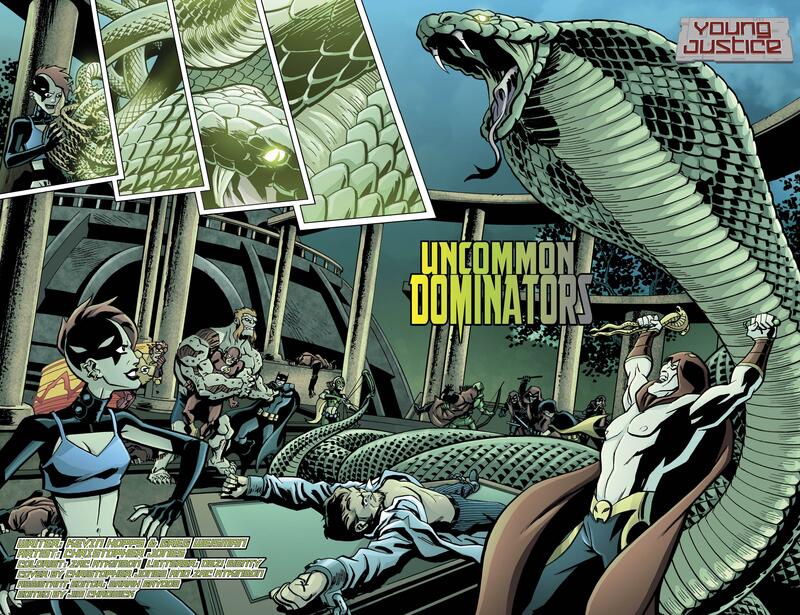 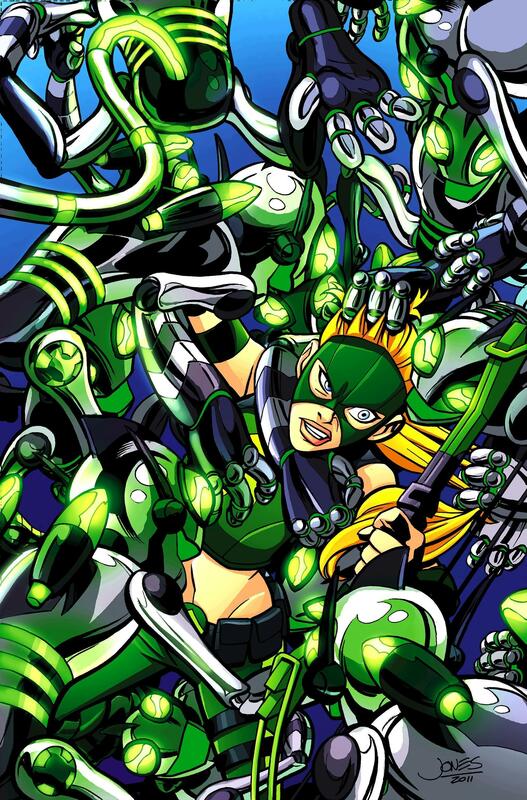 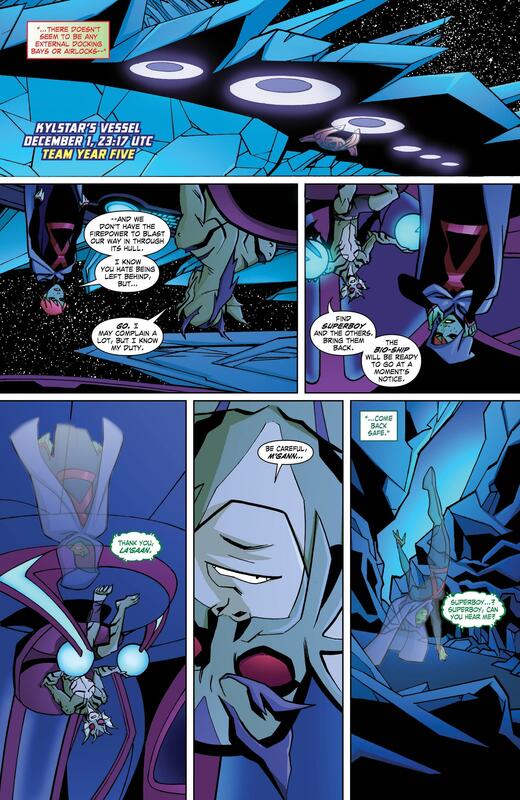 · The heroes make their last stand against Kylstar and Brainiac! 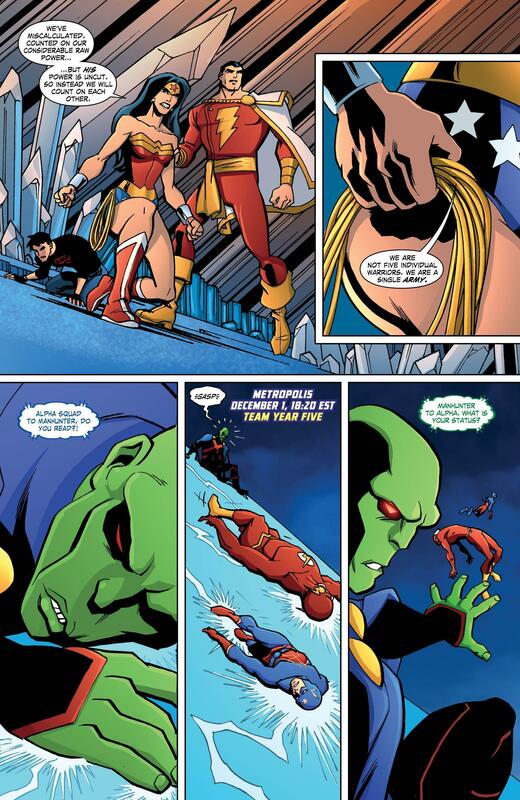 · Metropolis is still in danger, but now the entire planet risks destruction! 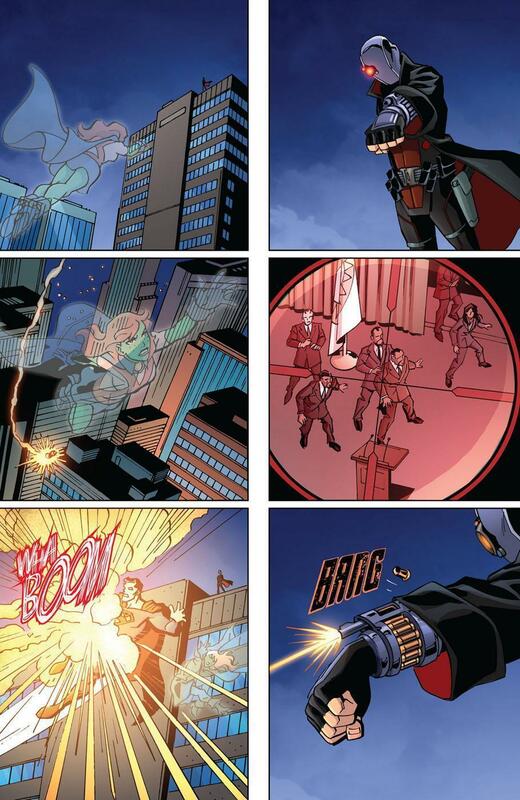 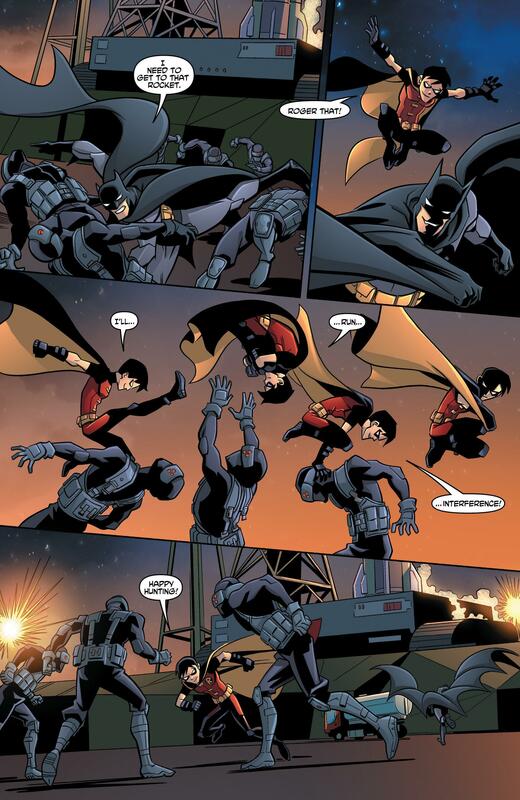 · Deadshot hits his target! 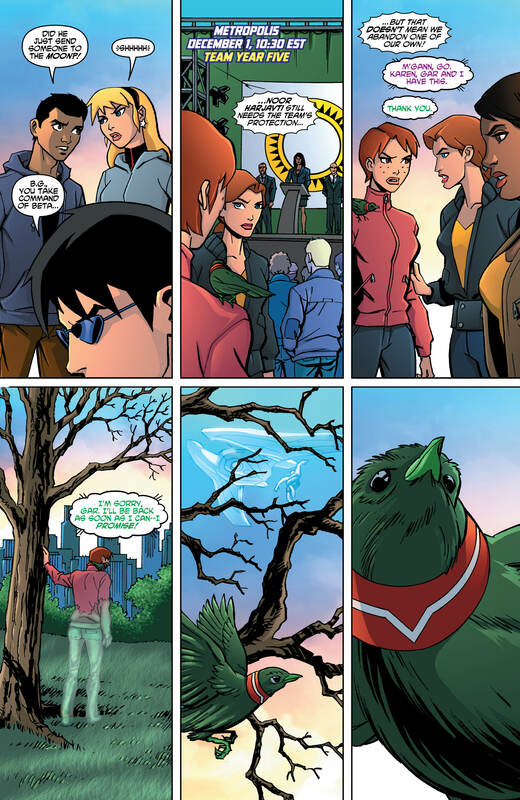 · A two-part story that bridges the gap between seasons two and three.